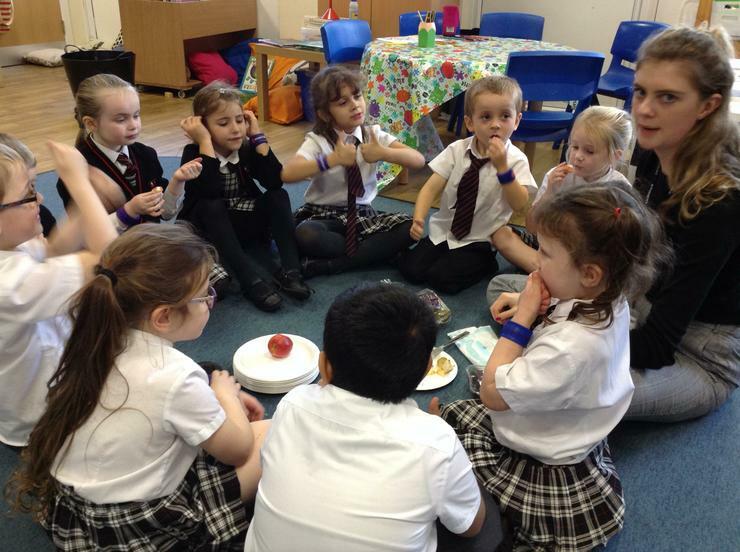 Miss Stead would like to welcome you to our fabulous Year 1 class and introduce you to our wonderful team! 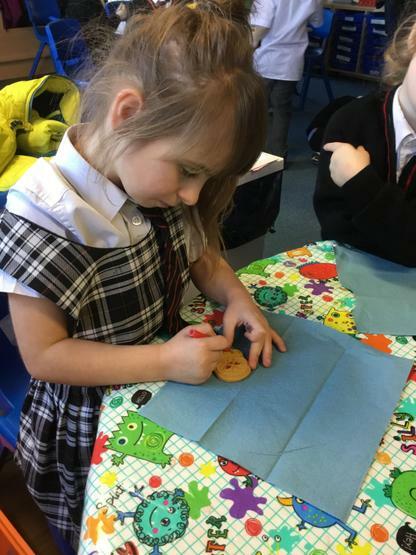 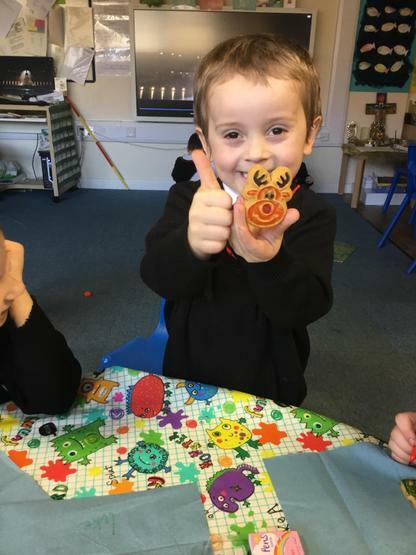 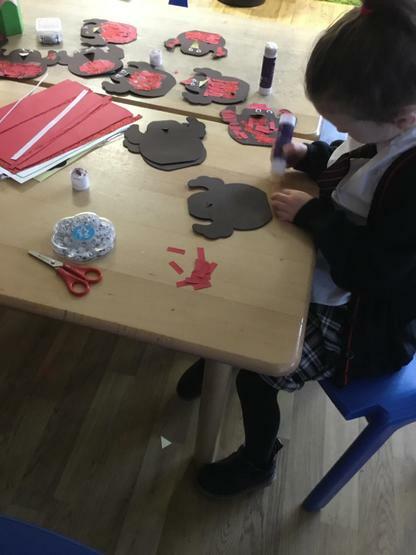 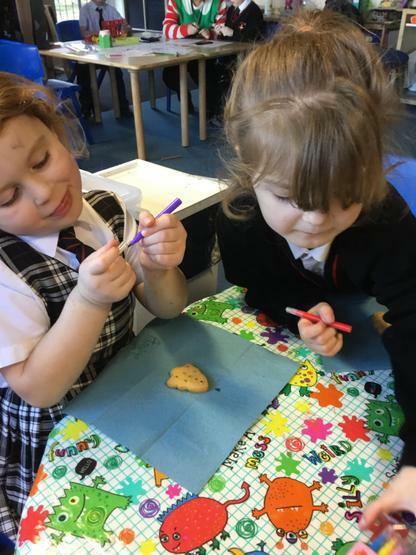 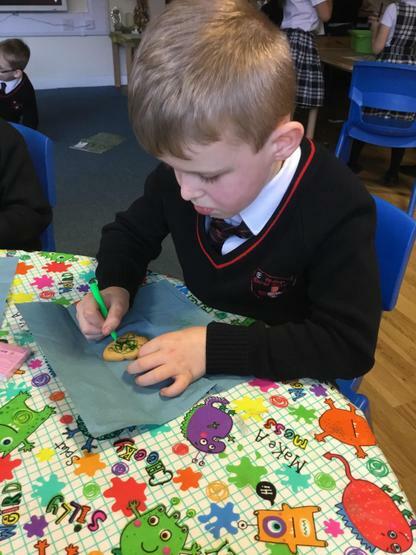 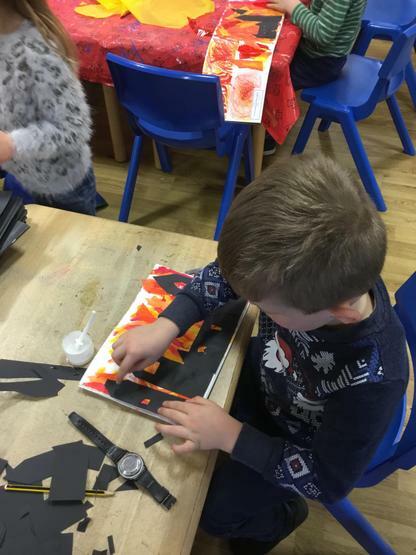 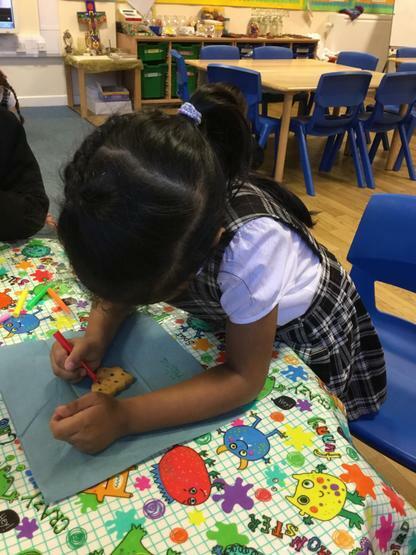 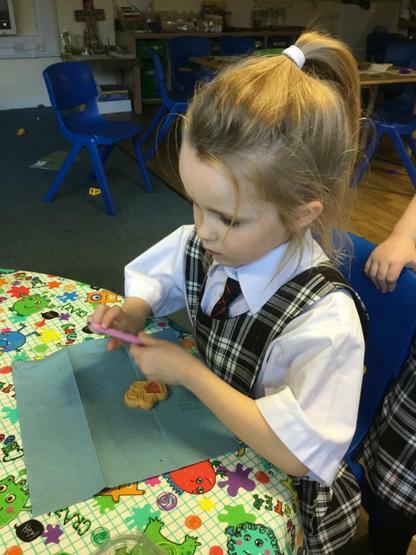 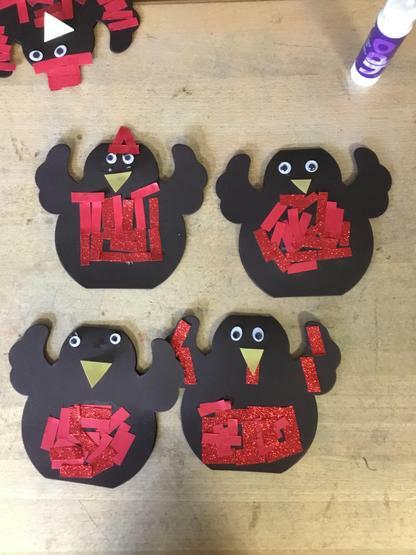 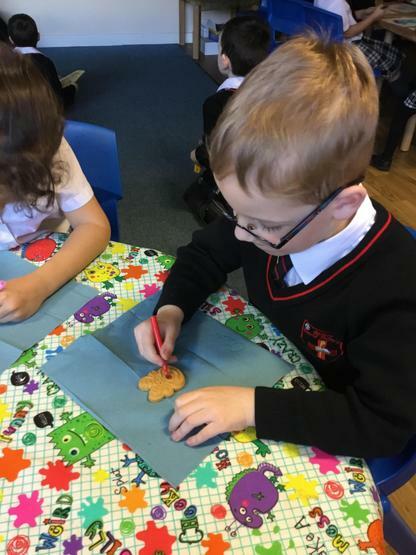 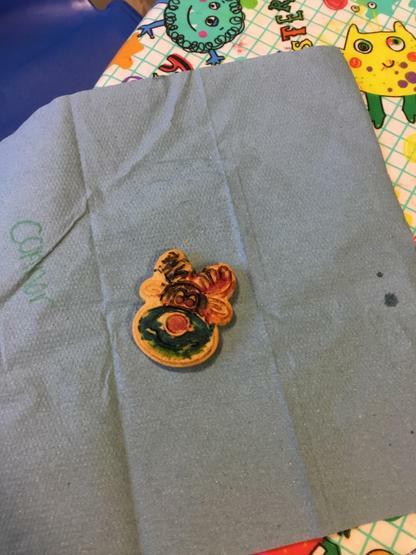 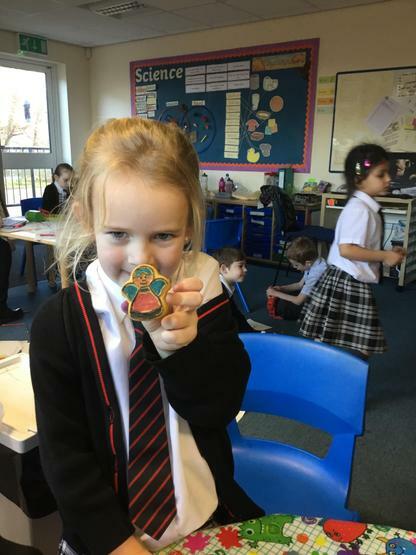 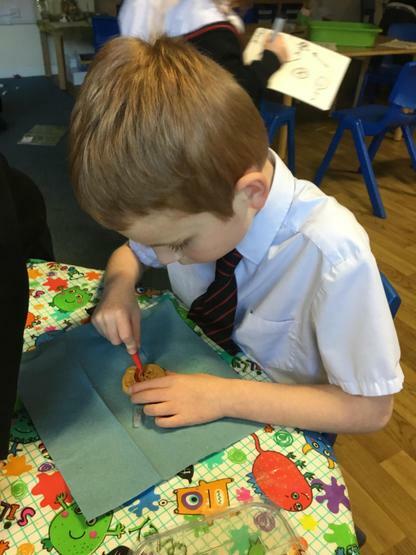 The children had a great time making amazing pop-up Christmas cards and decorating delicious Christmas biscuits. 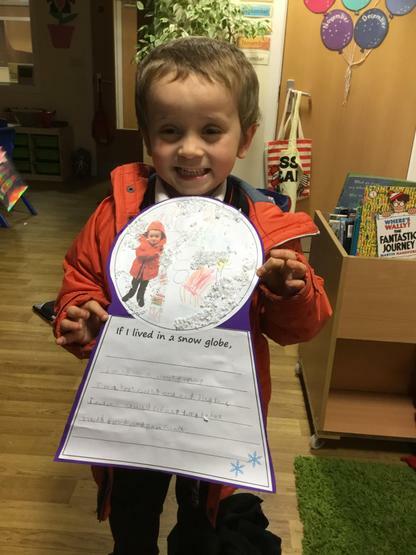 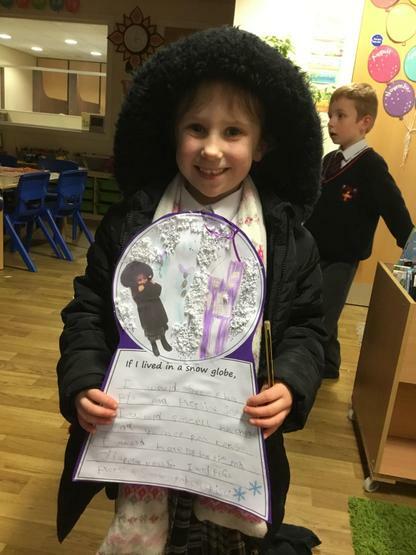 They also wrote fabulous poems about their snows globes, where they used imaginative descriptive writing. 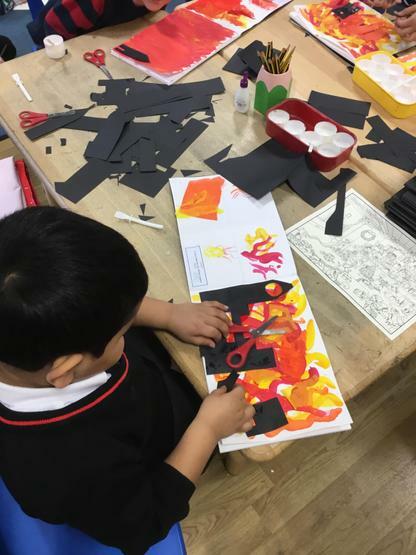 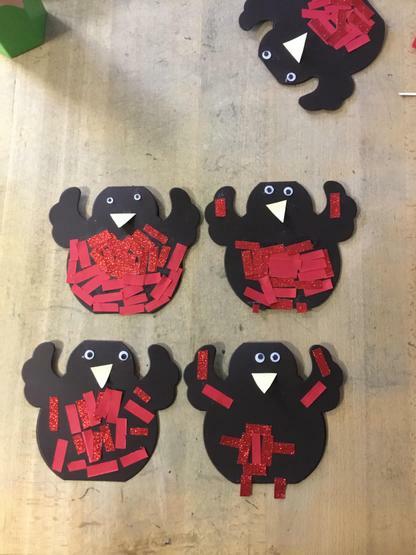 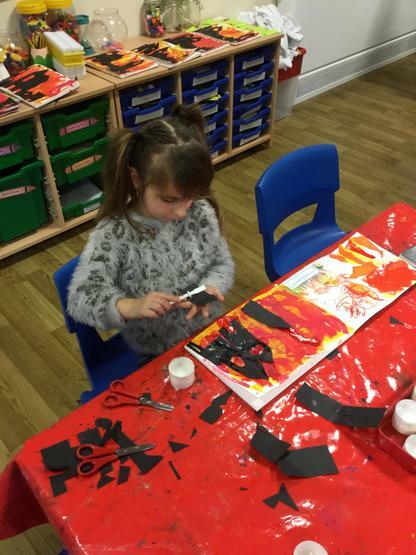 As part of our Great Fire of London topic, the children created a piece of multimedia artwork. 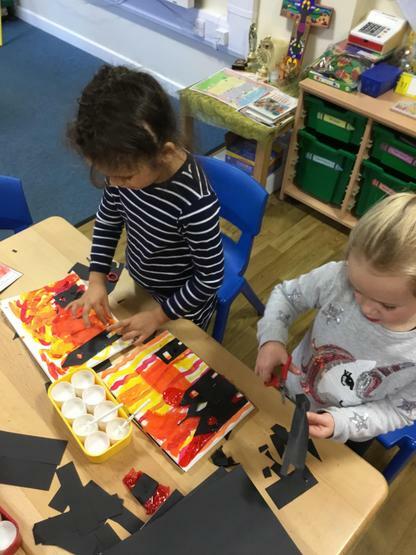 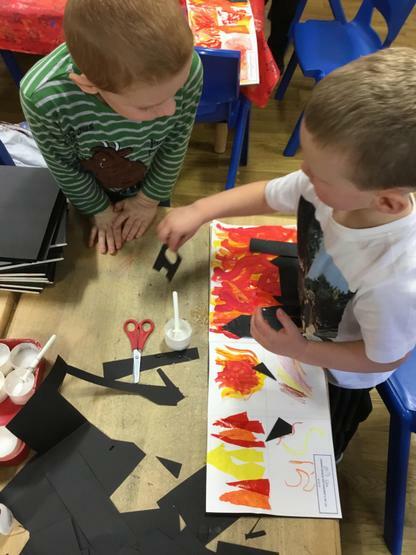 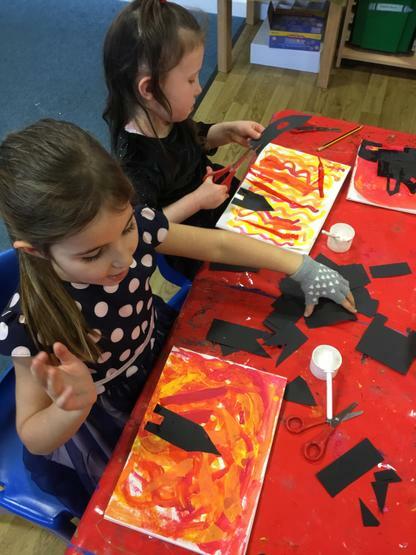 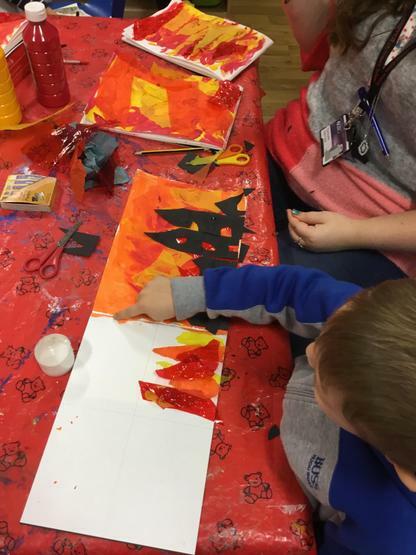 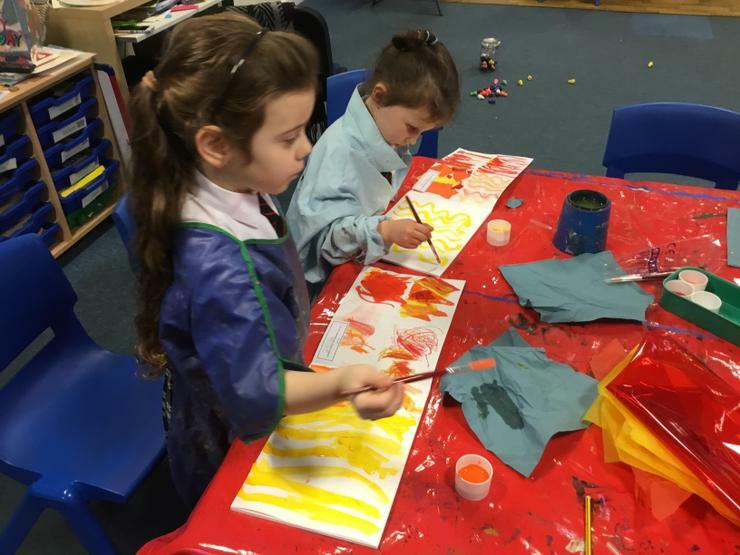 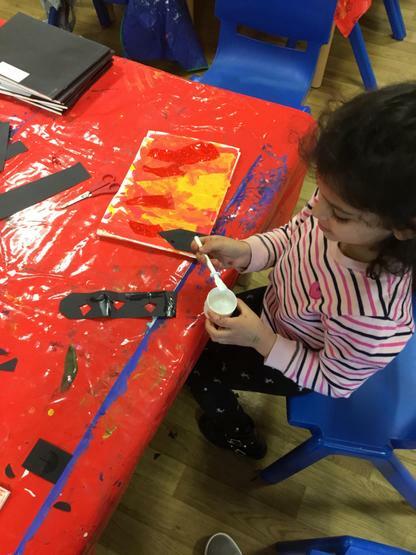 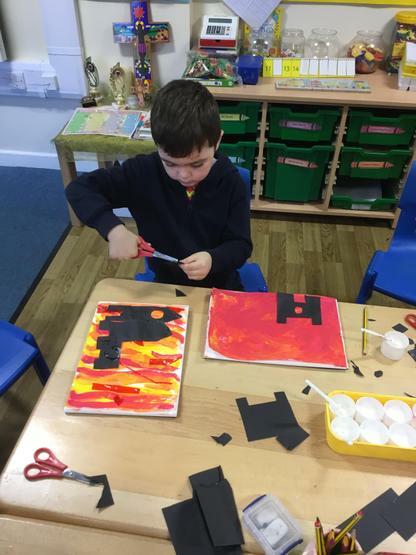 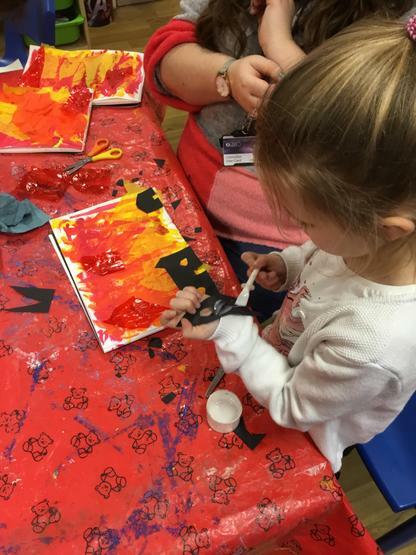 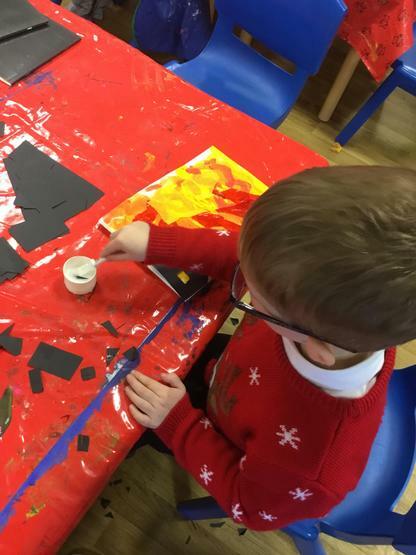 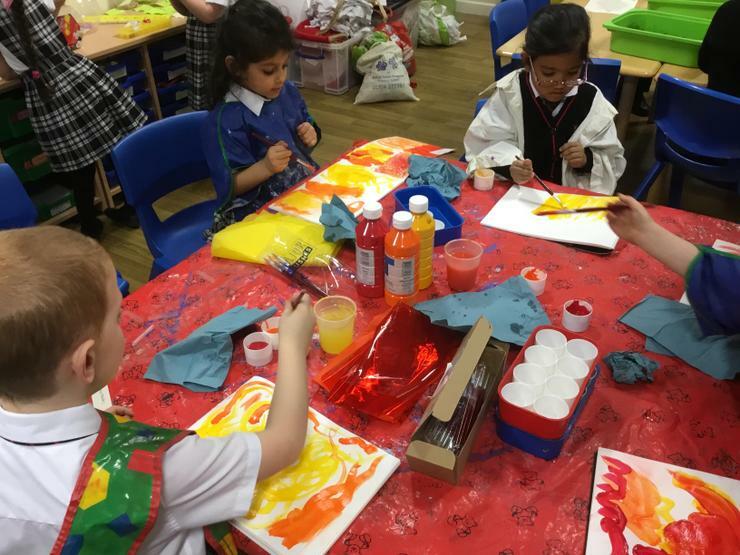 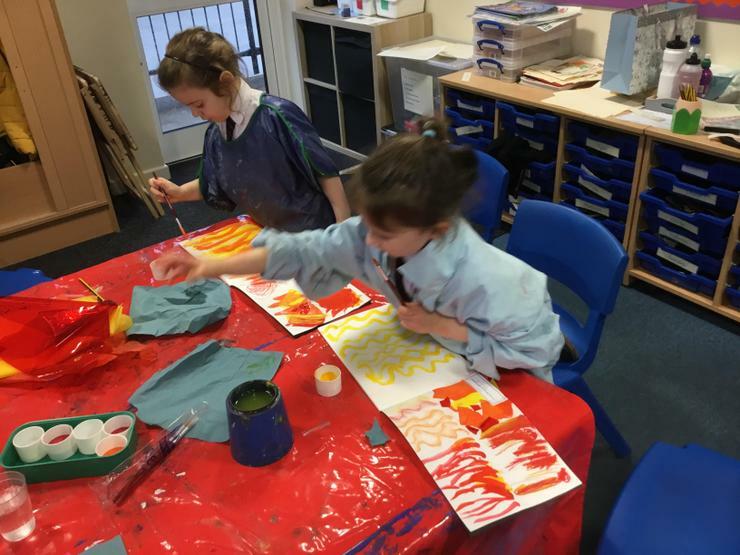 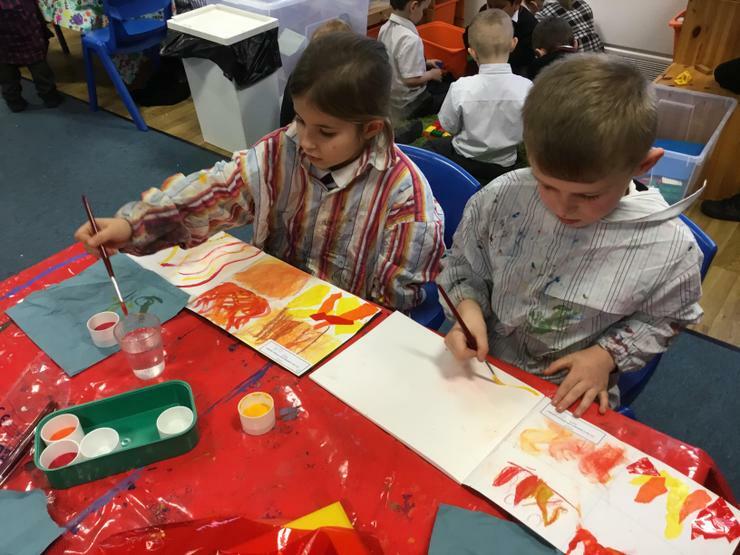 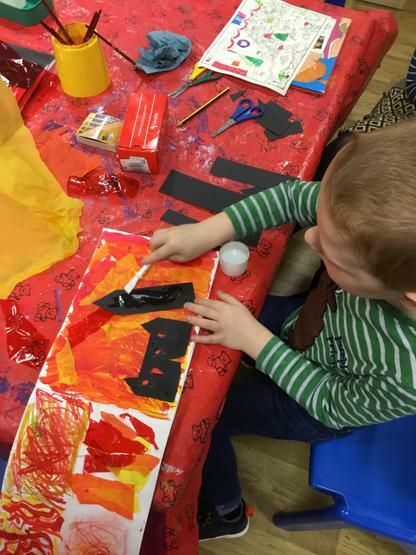 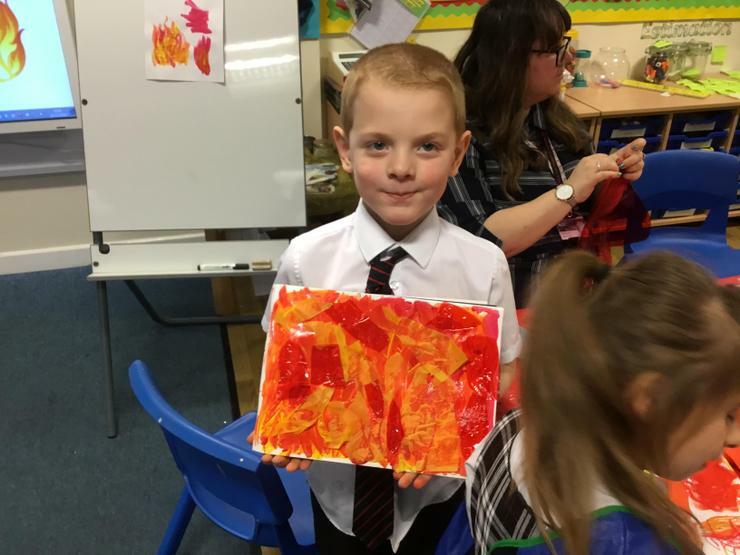 After exploring different mediums, we thought about the colours we would need and the direction we should paint our flames. 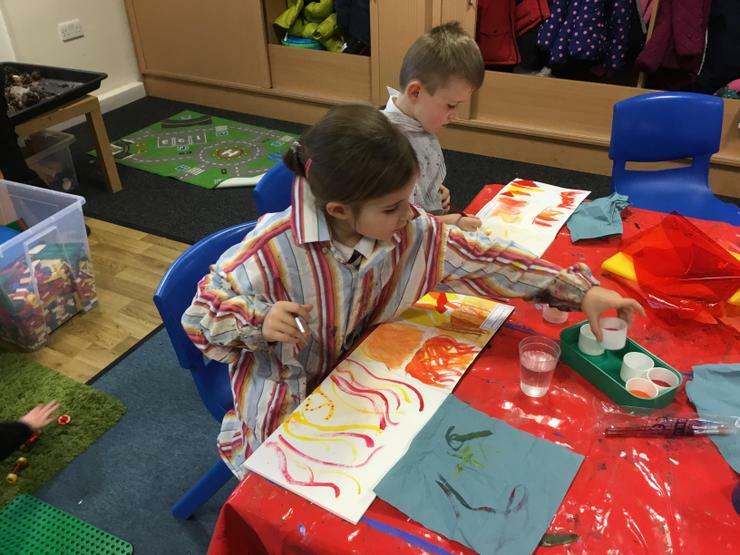 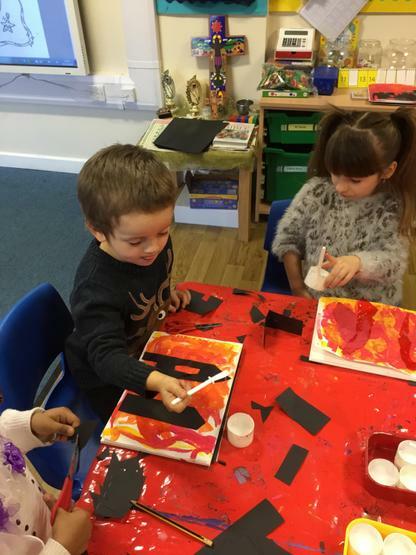 Some children wanted to mix mediums, which they used to great effect! 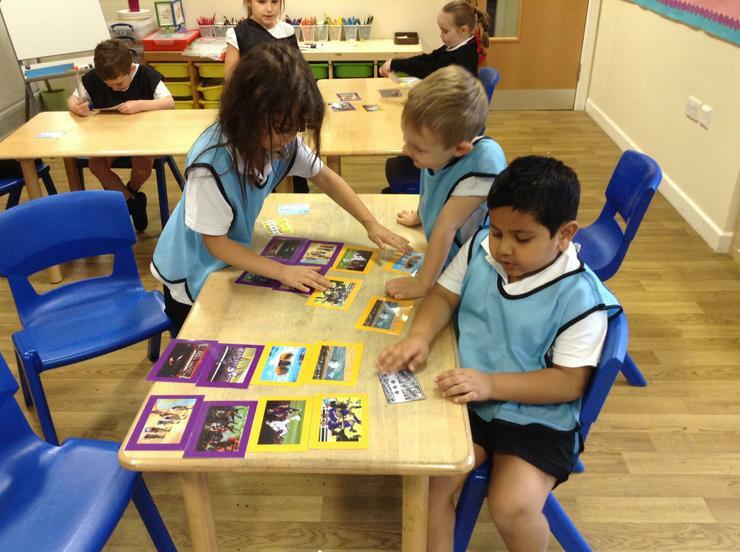 Once the backgrounds were finished, they used black card to recreate the buildings. 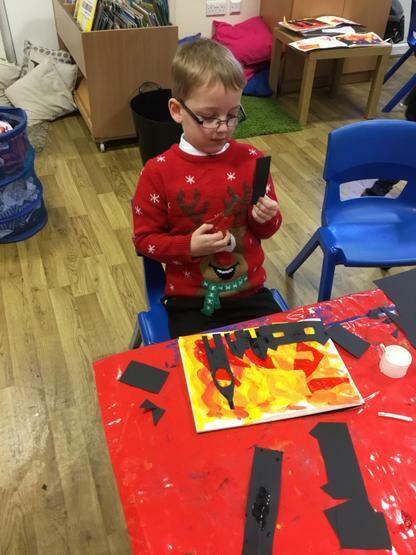 The end result was fabulous! 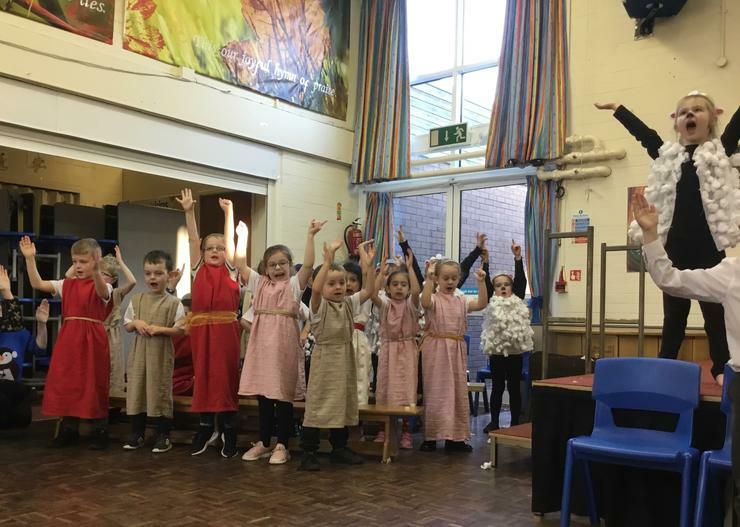 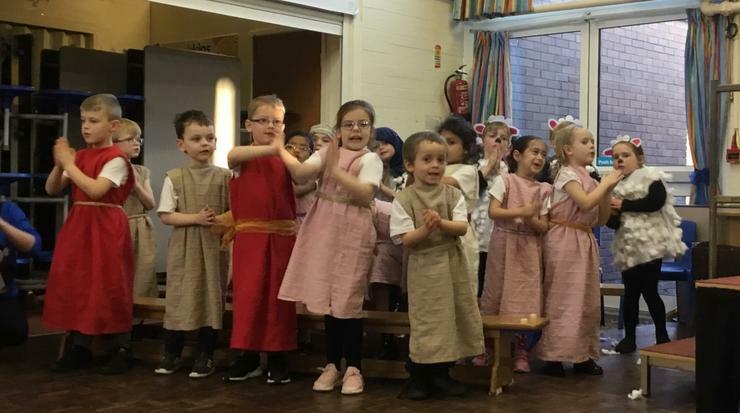 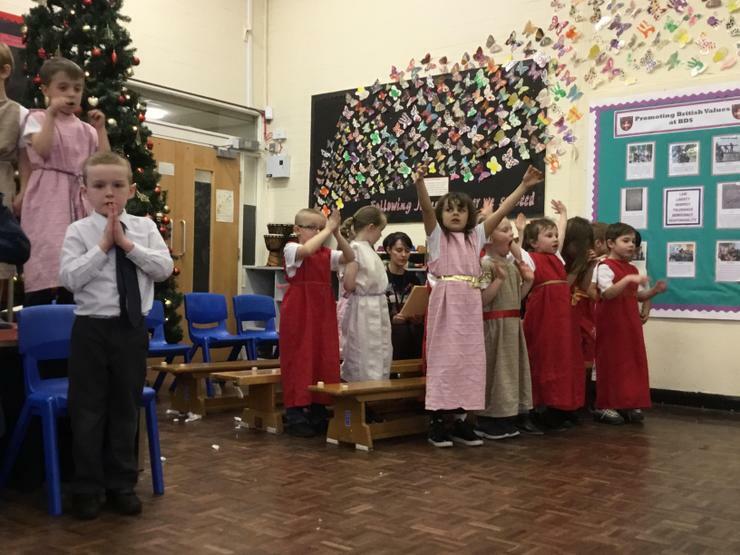 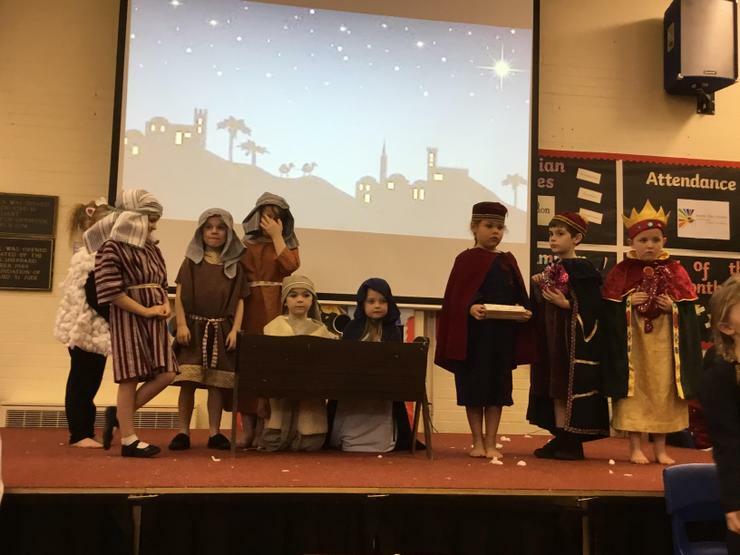 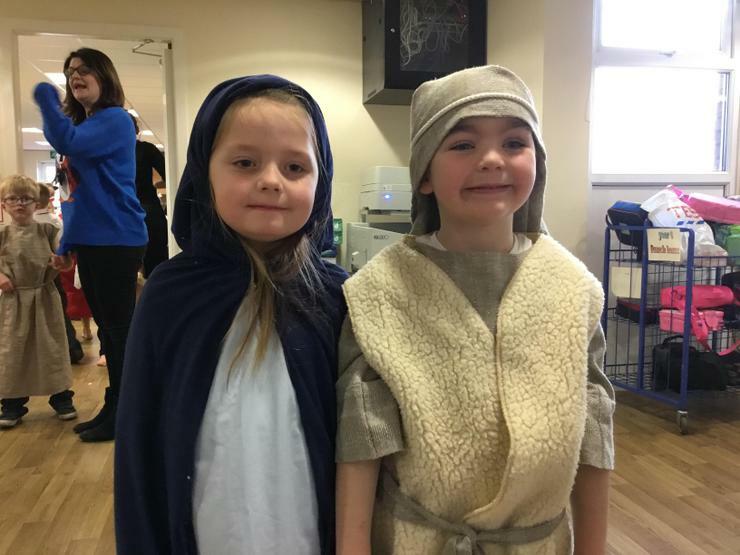 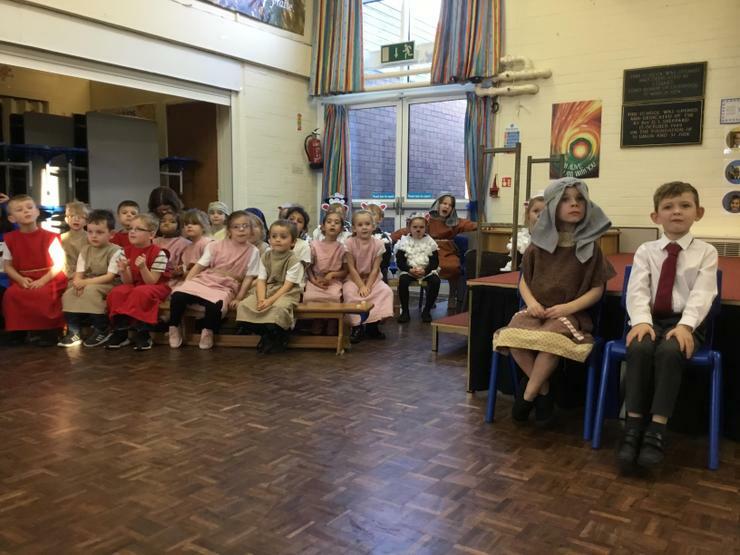 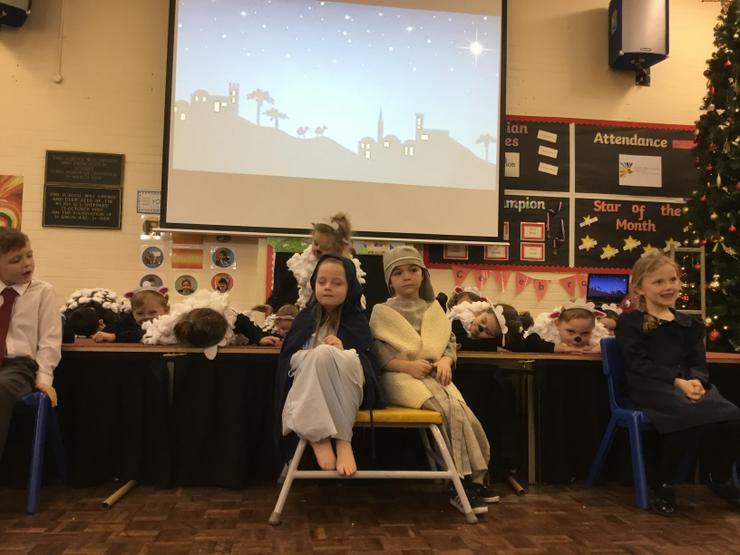 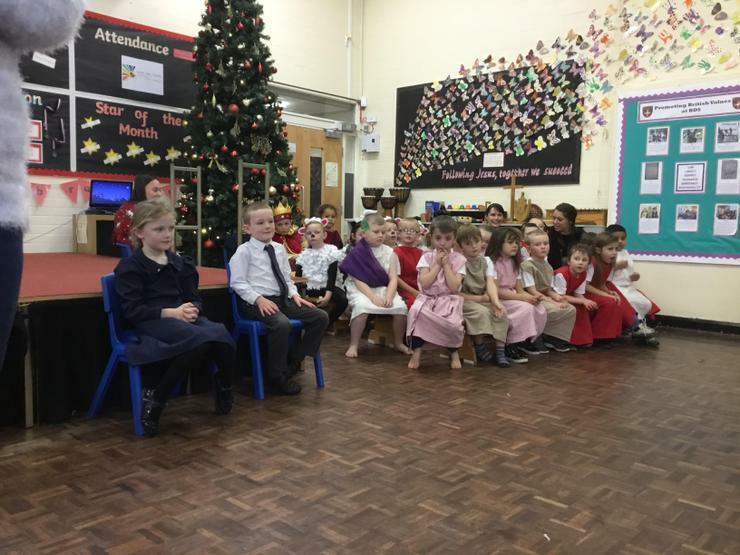 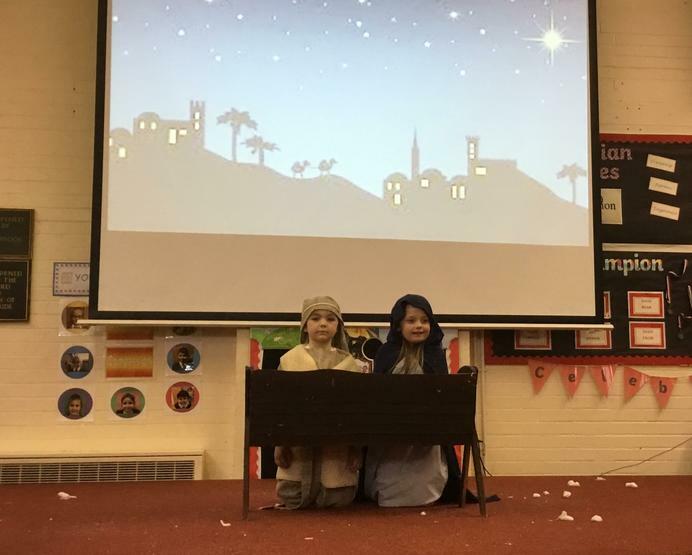 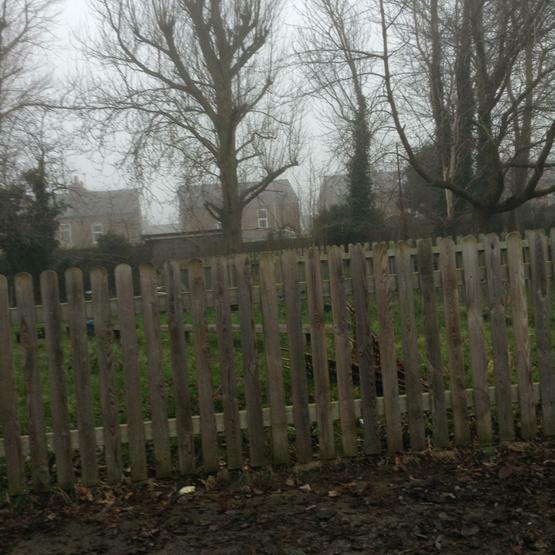 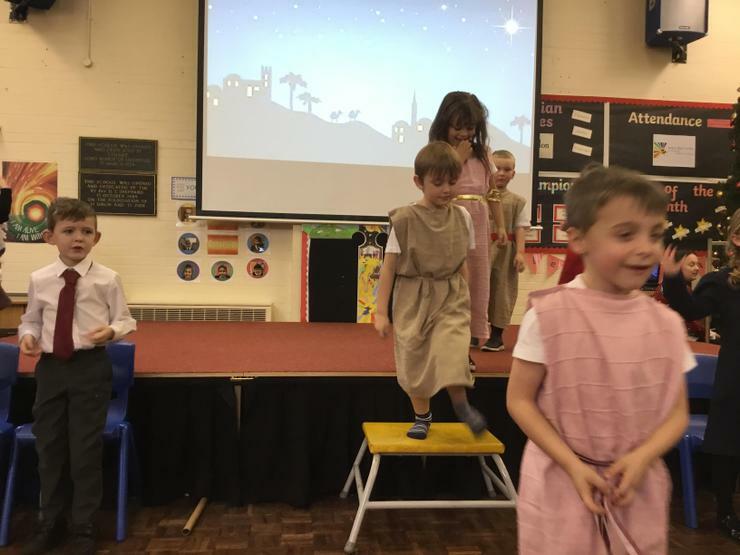 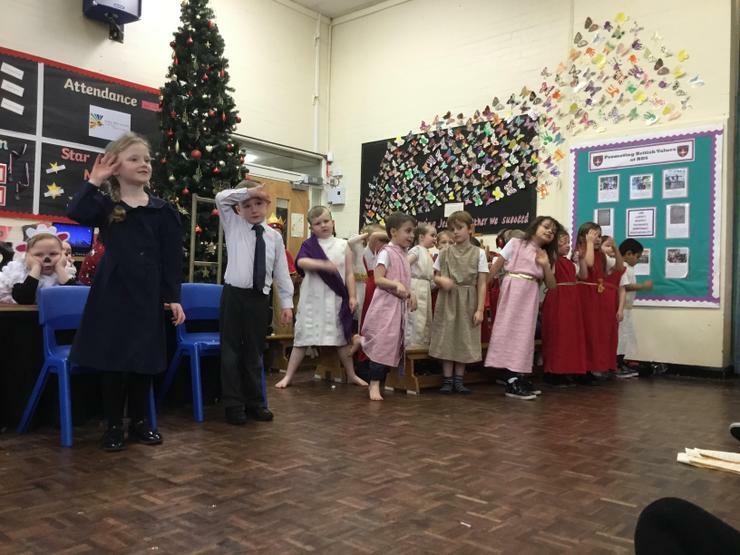 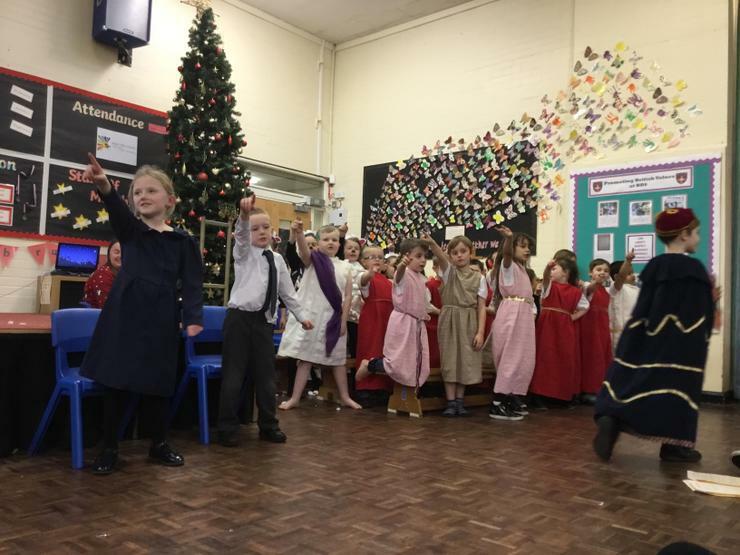 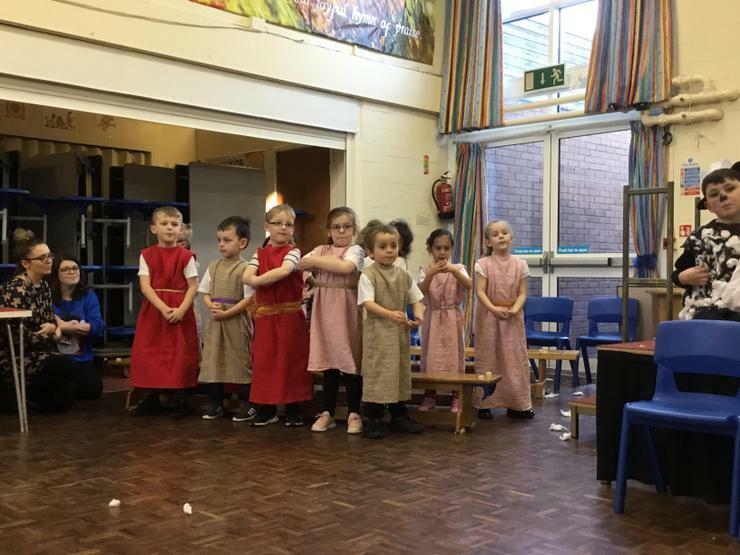 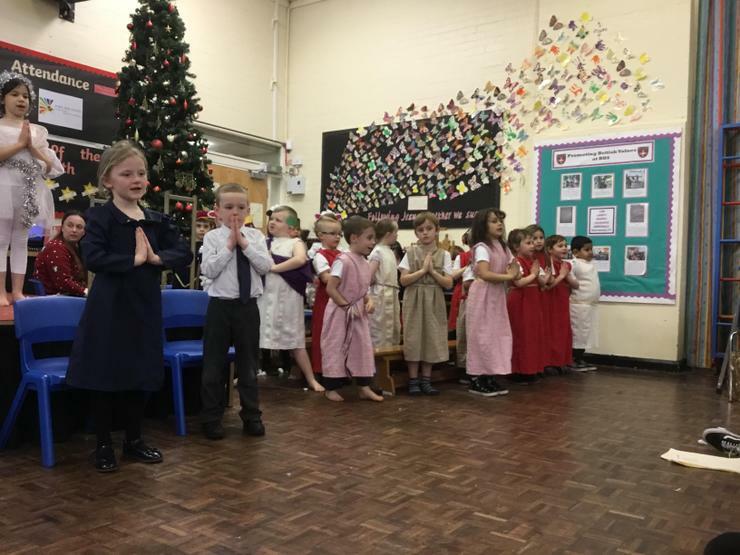 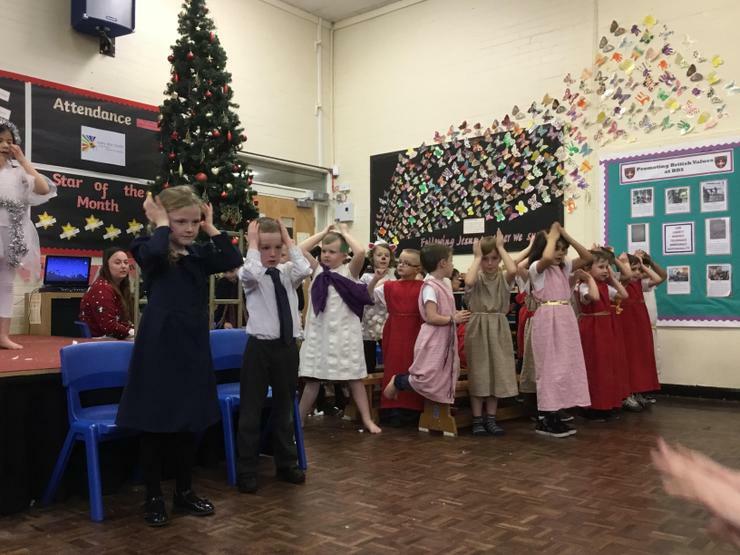 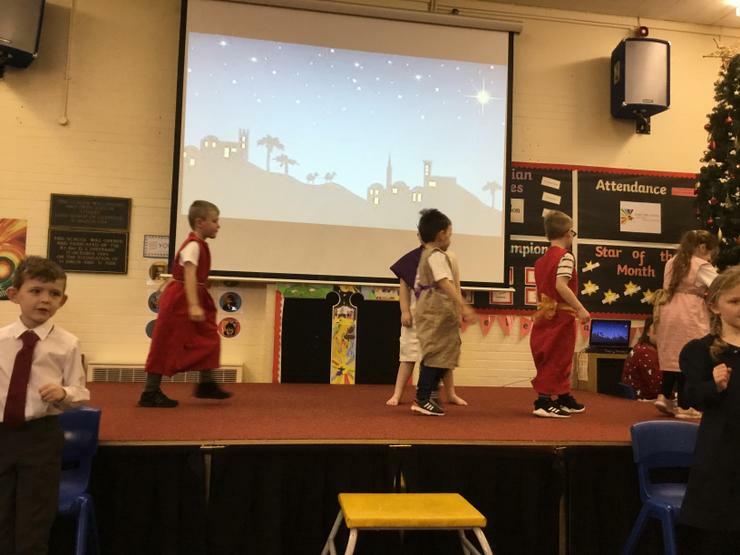 The children in Year 1 and 2 worked extremely hard on our brand new Nativity! 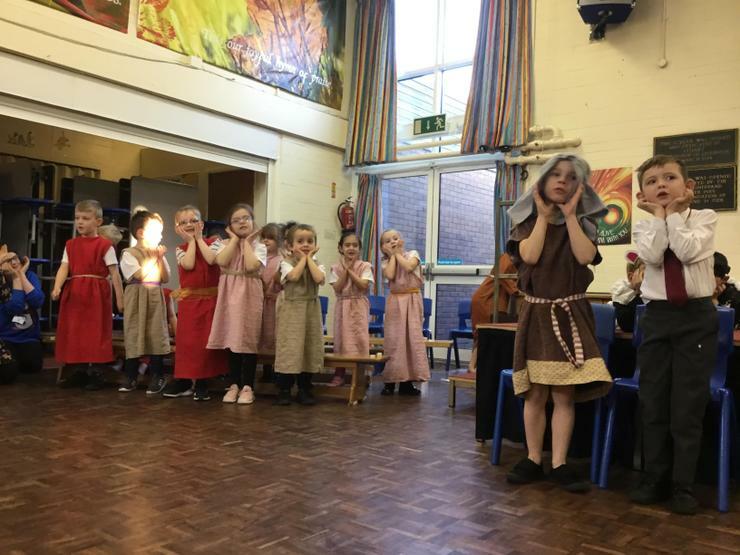 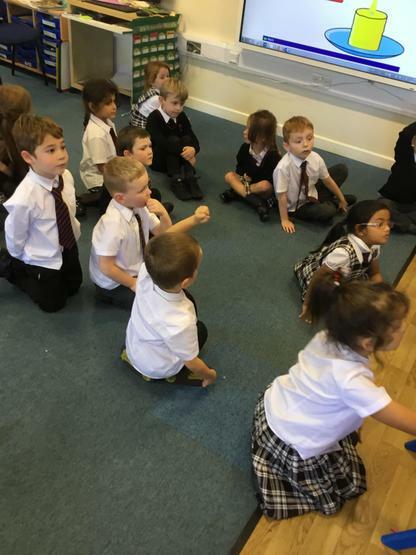 Thank you to all the parents who came to support us and help practise songs at home. 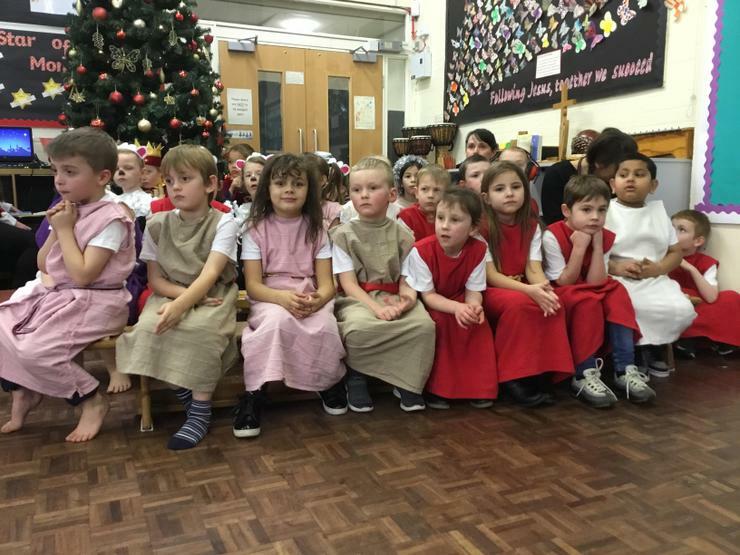 I think everyone would agree the children were amazing and it was a great success! 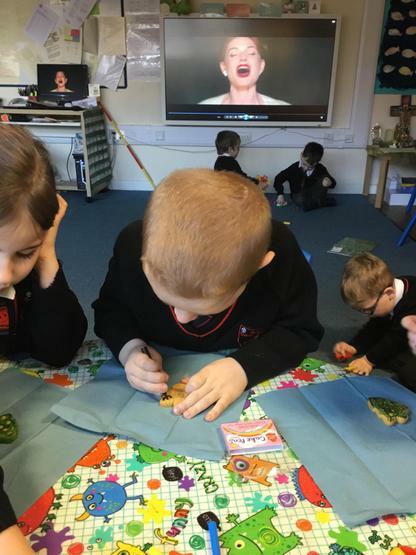 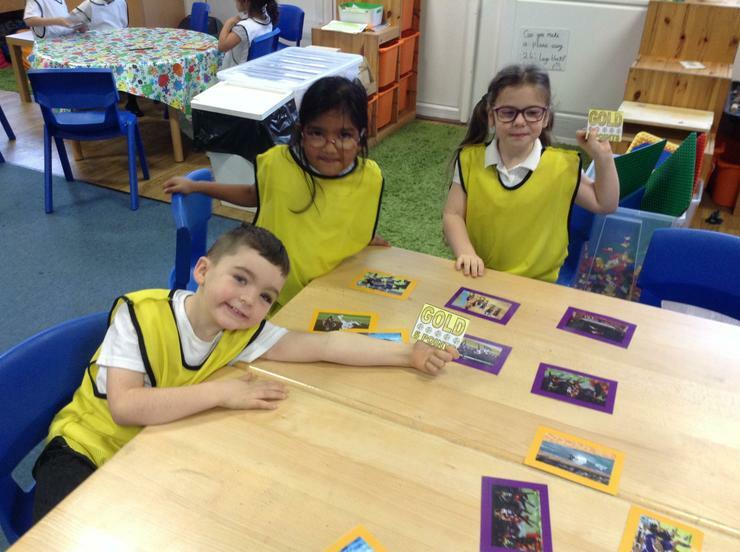 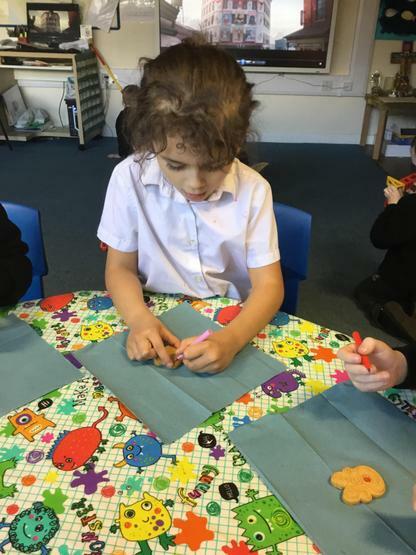 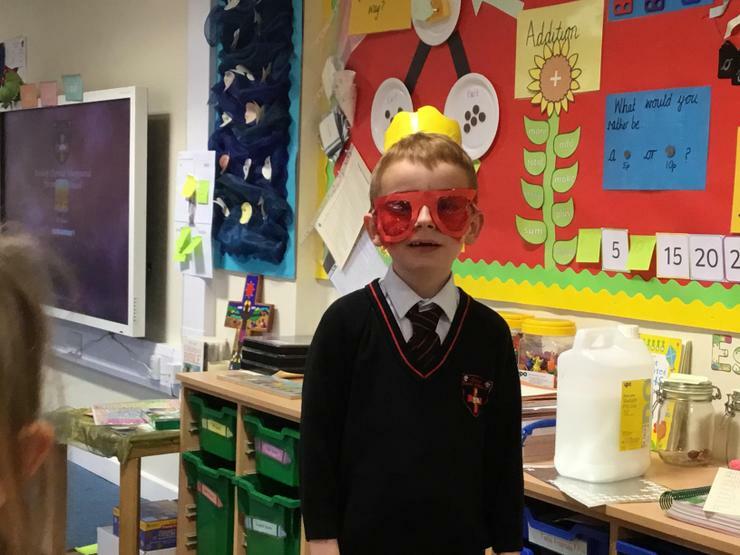 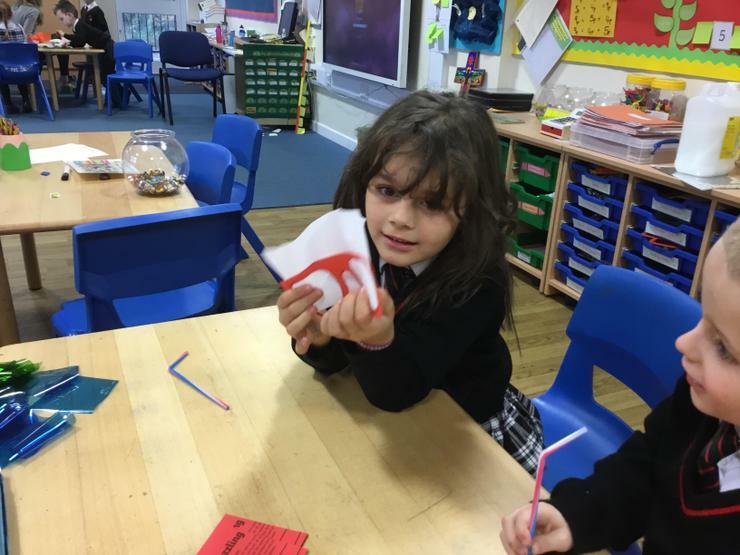 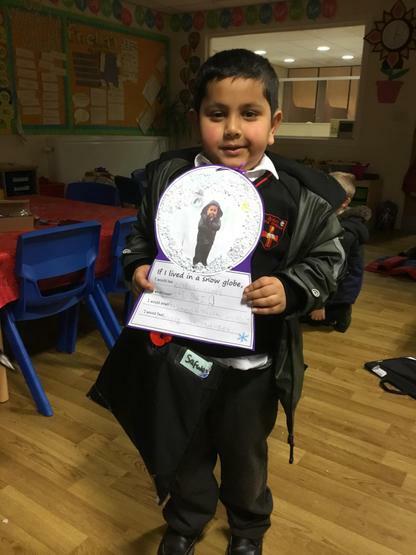 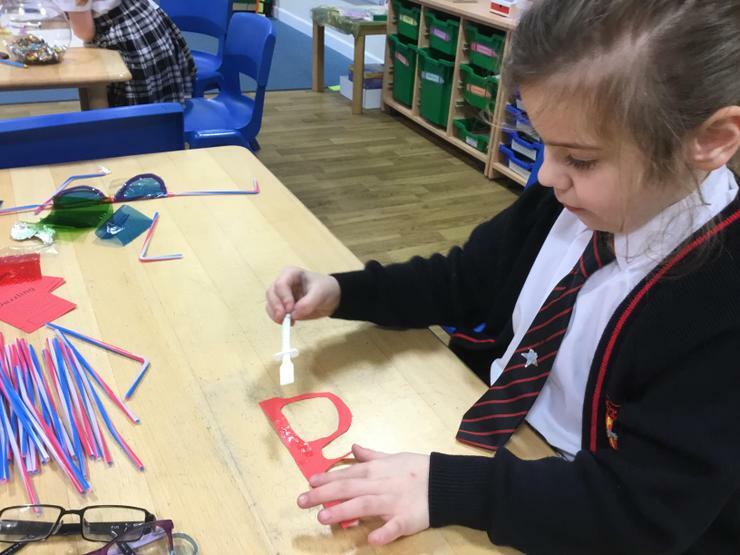 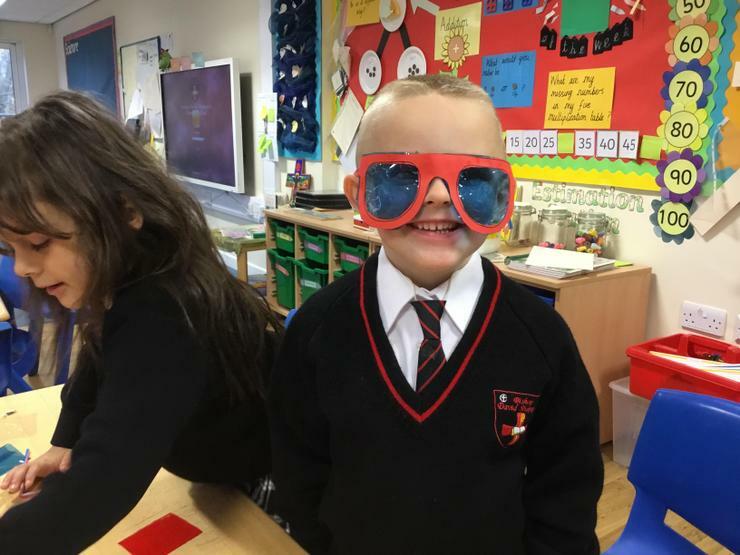 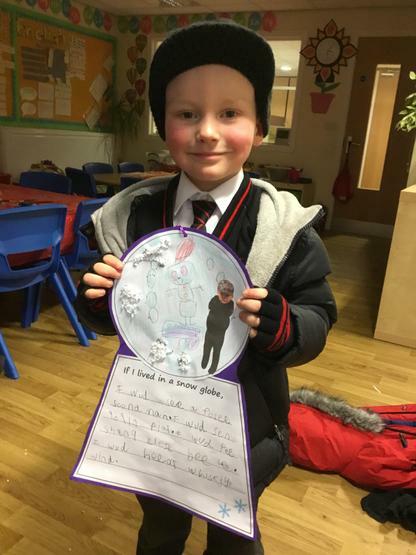 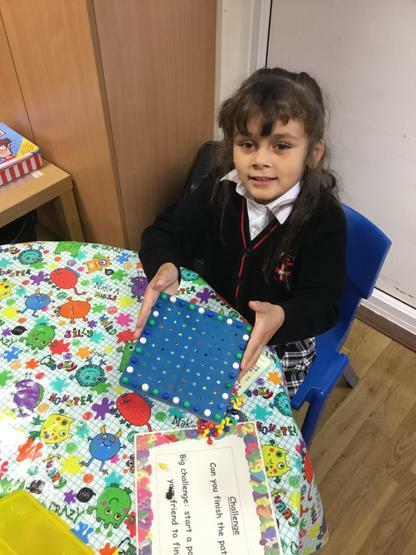 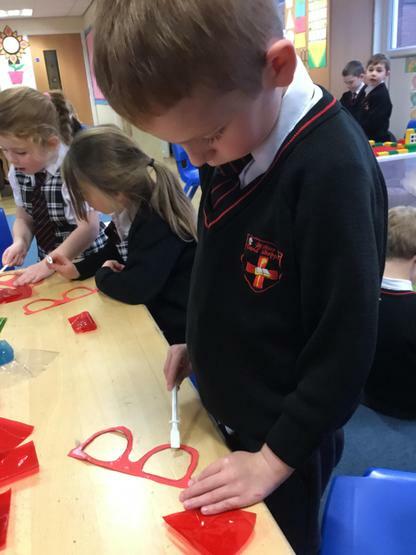 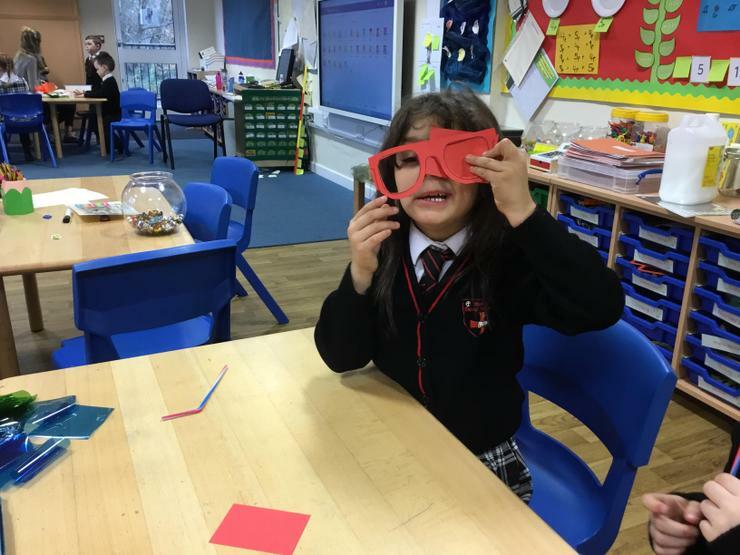 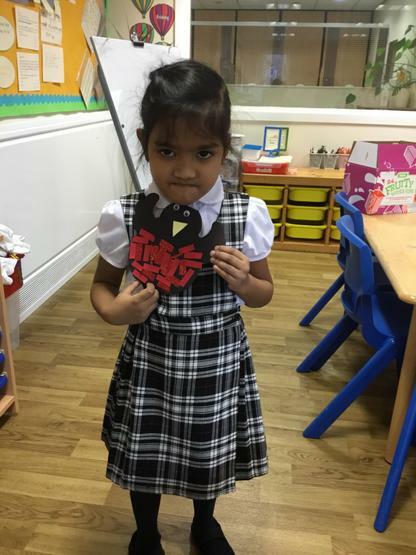 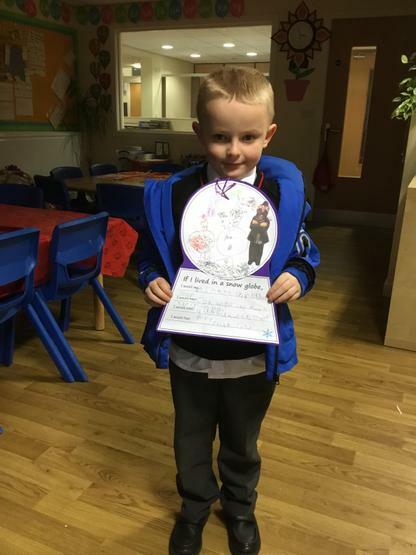 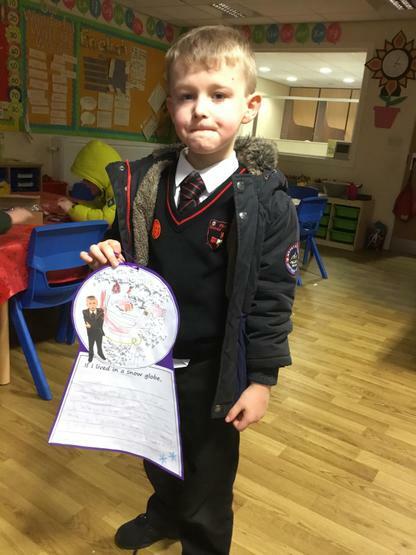 As part of our focus on Meerkat Mail in English, the children received a postcard from Sunny asking them to help him make a pair of sunglasses for his trip to Egypt. 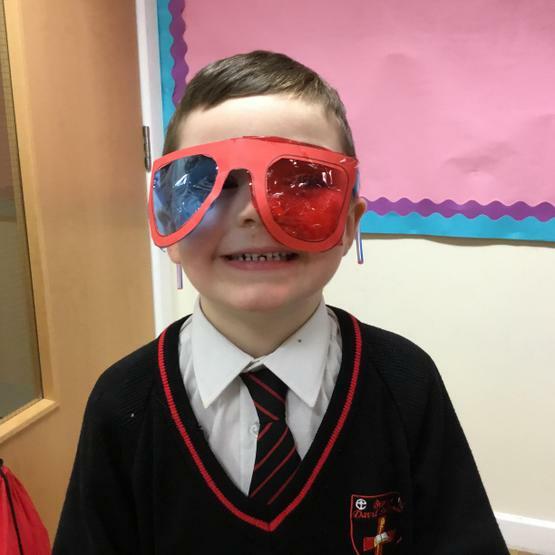 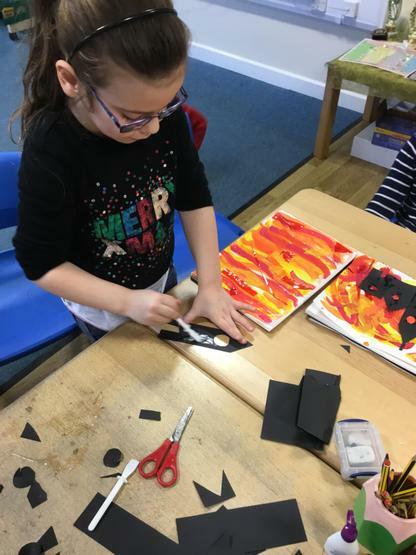 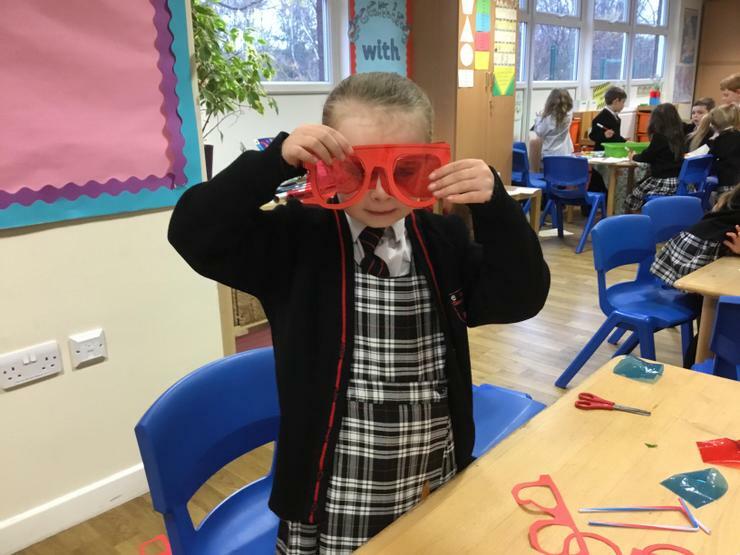 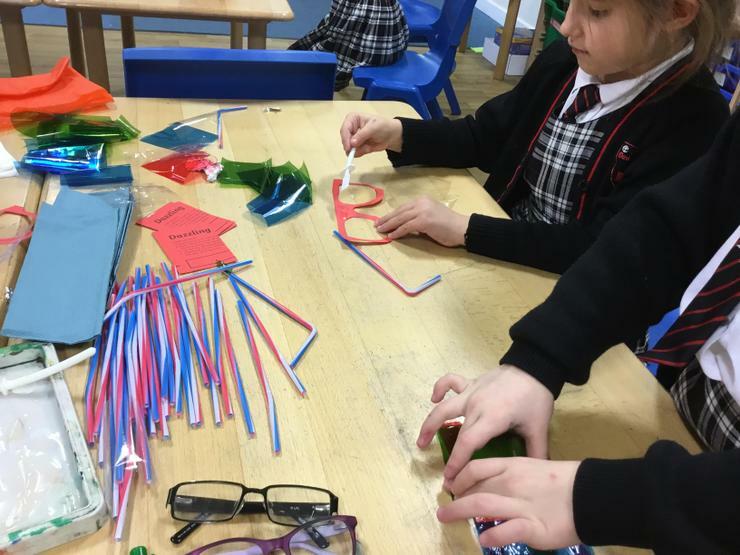 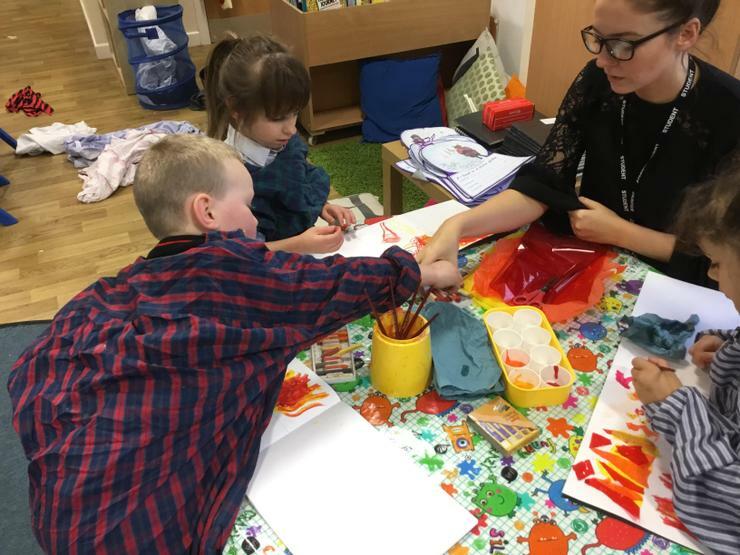 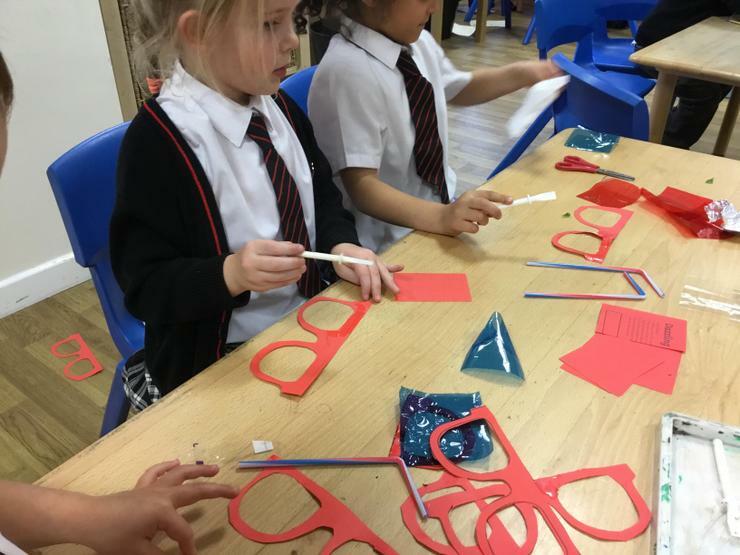 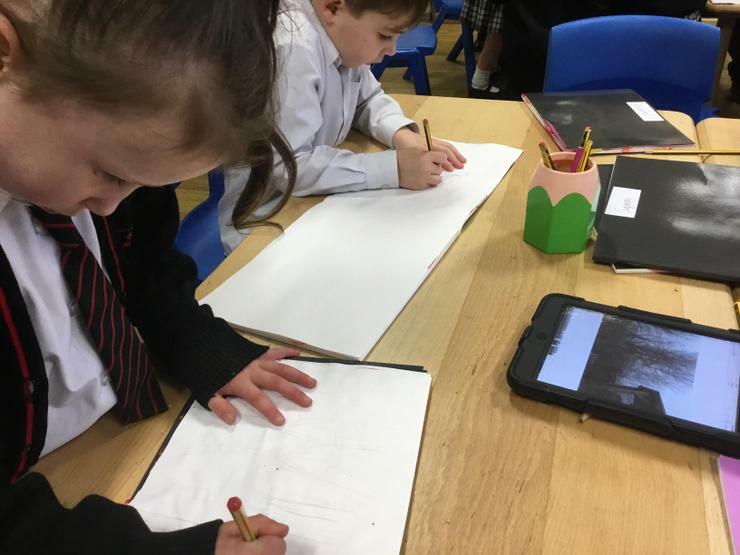 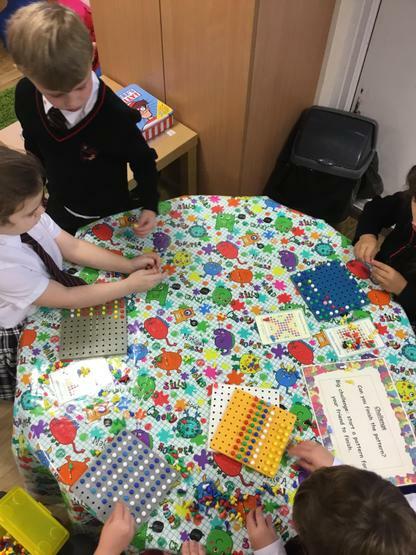 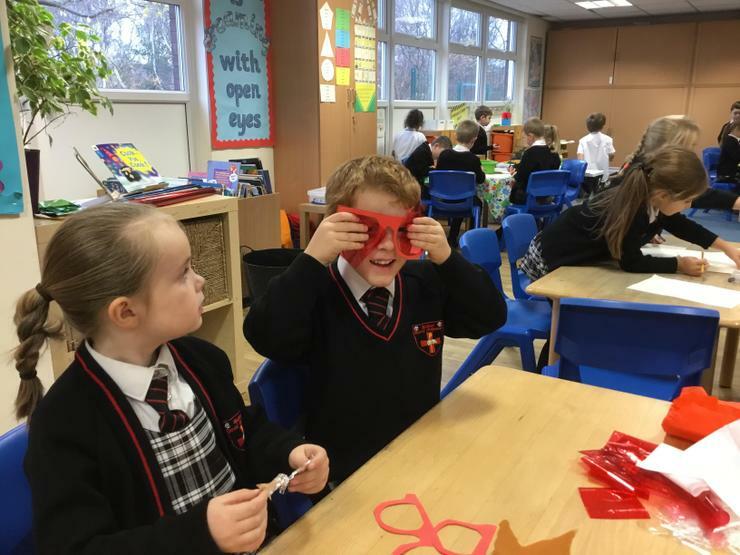 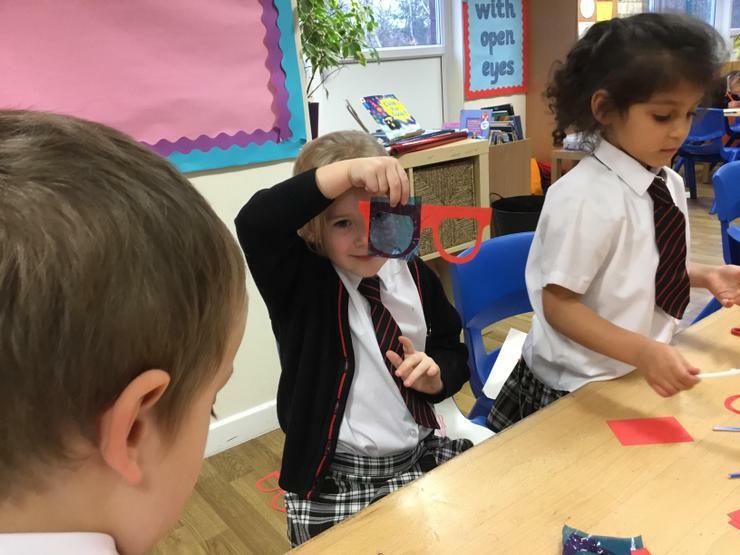 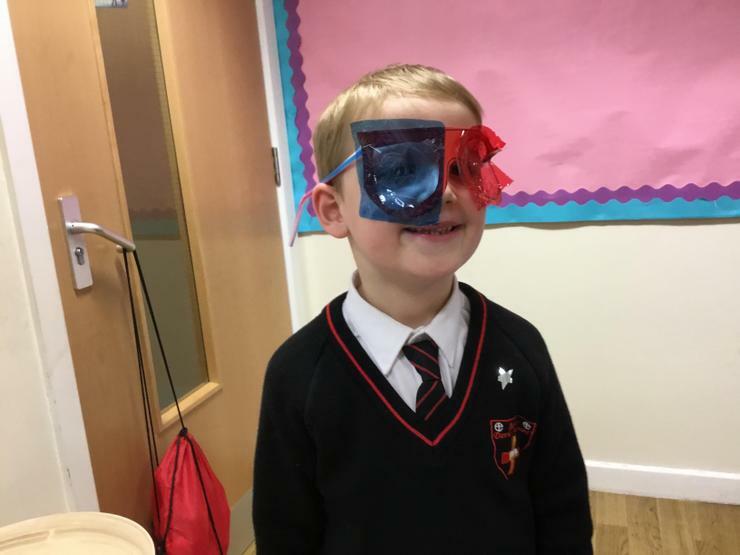 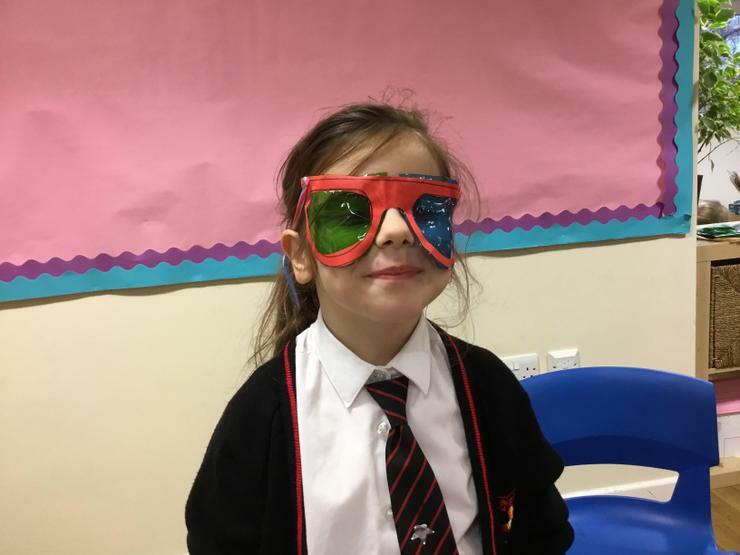 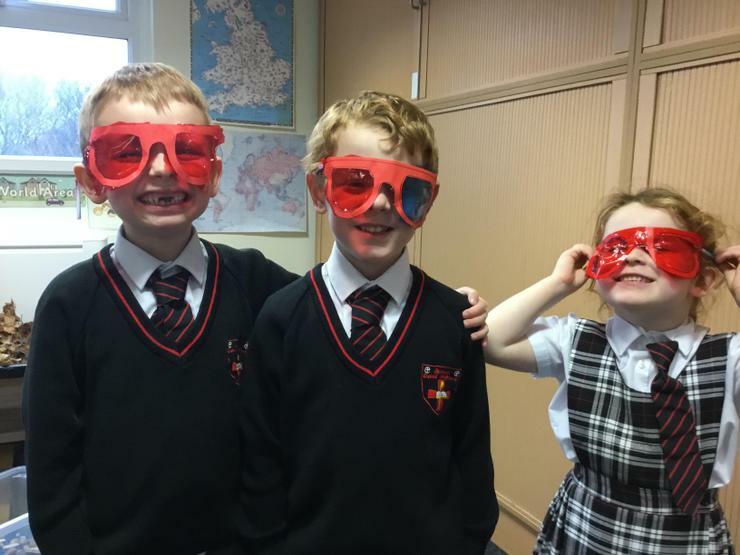 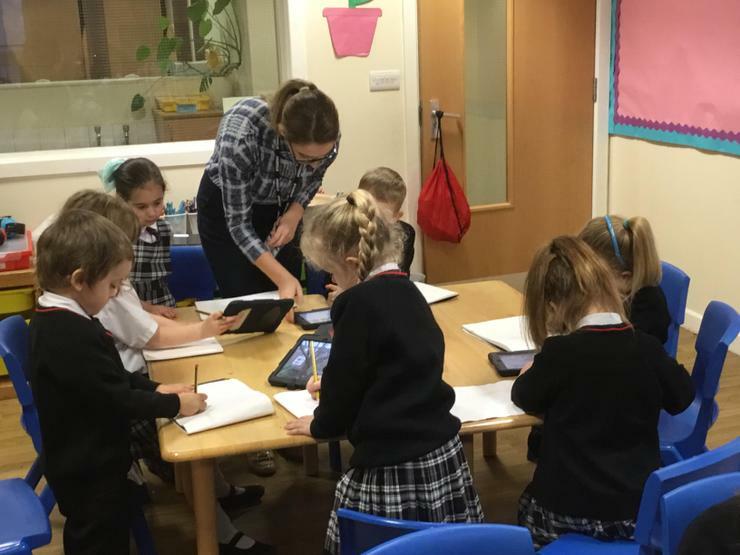 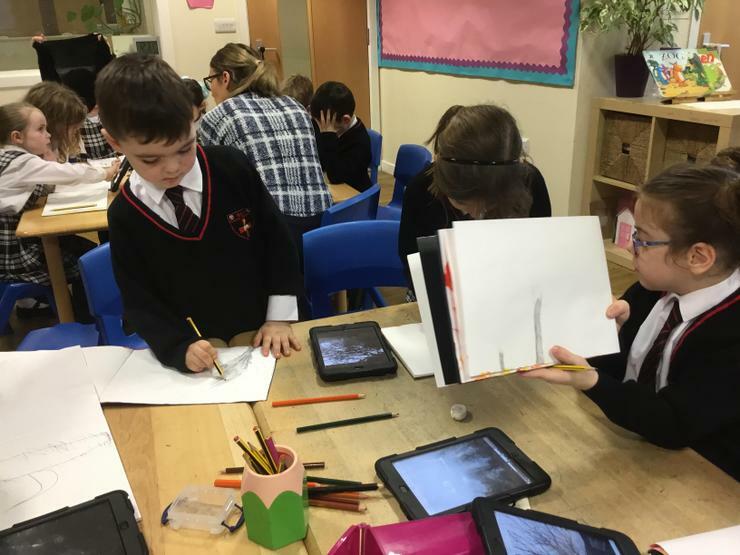 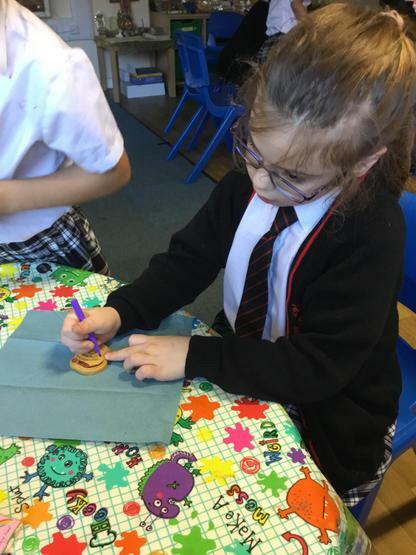 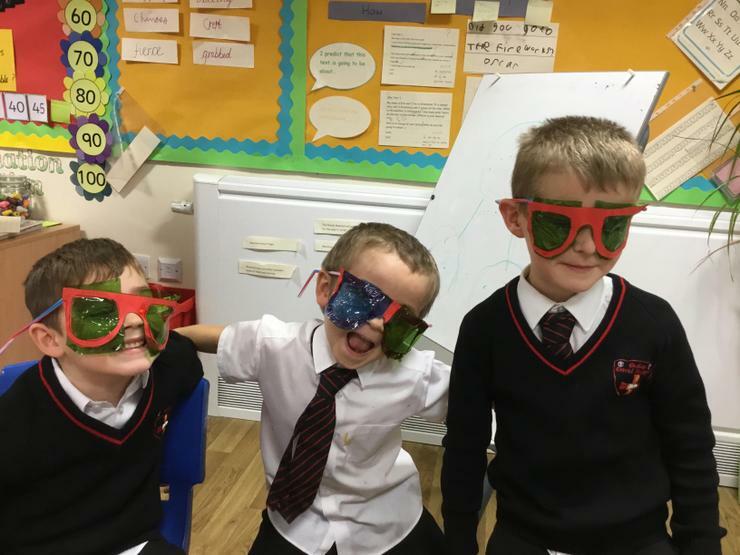 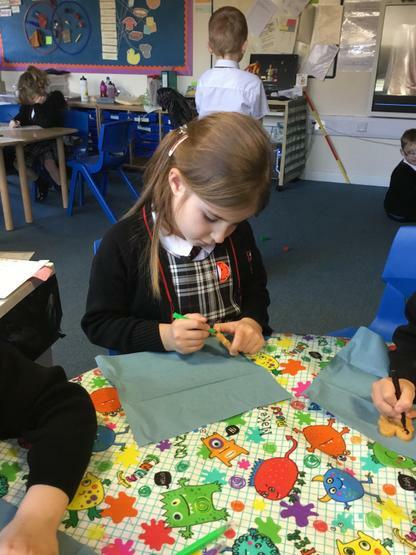 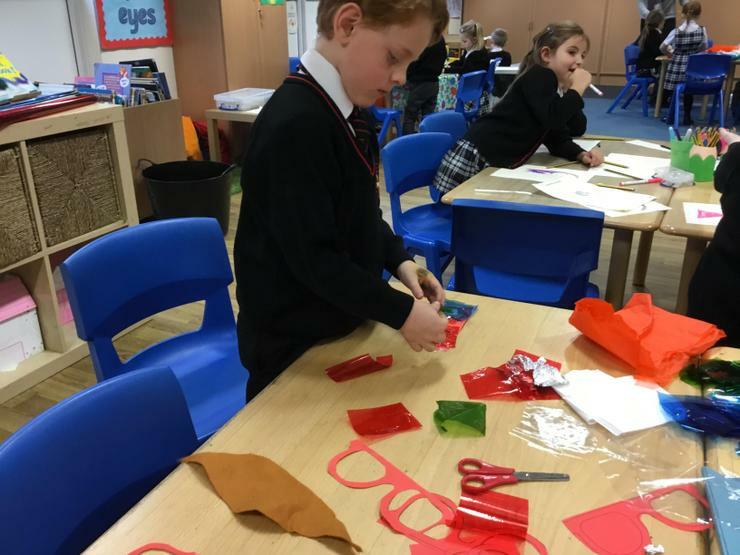 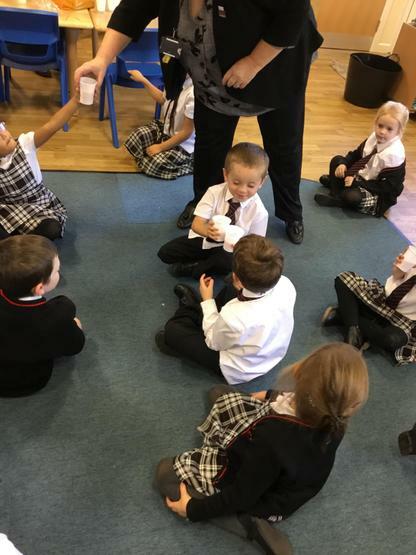 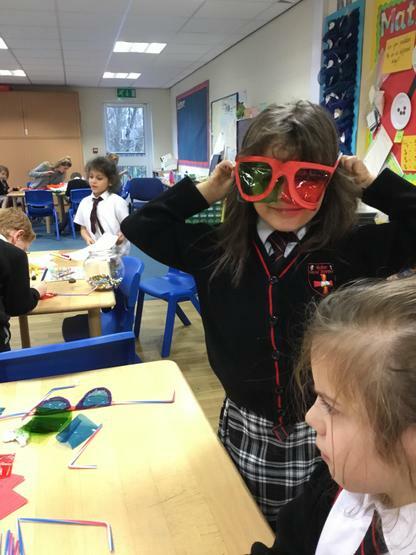 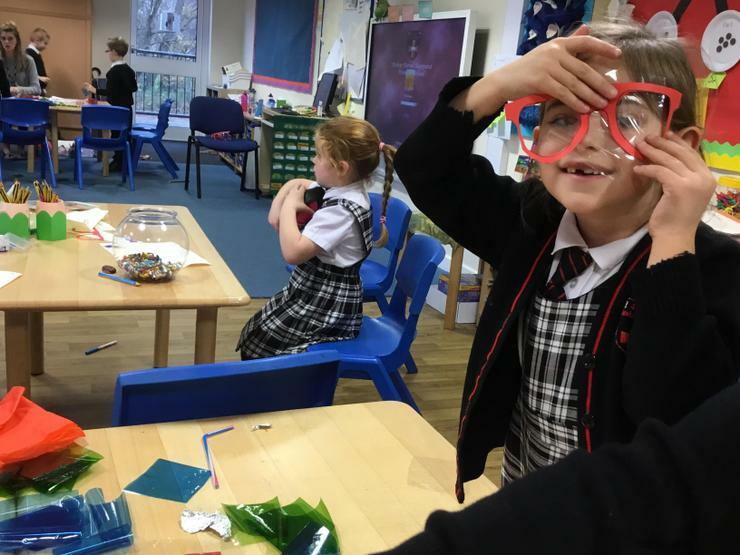 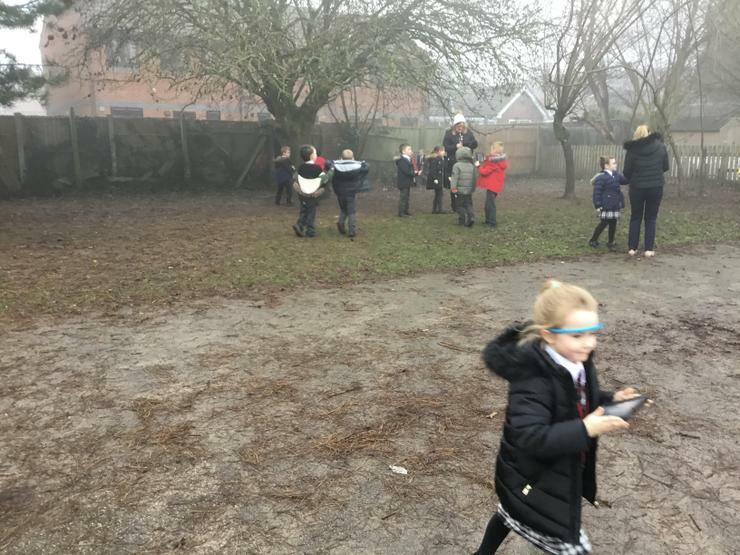 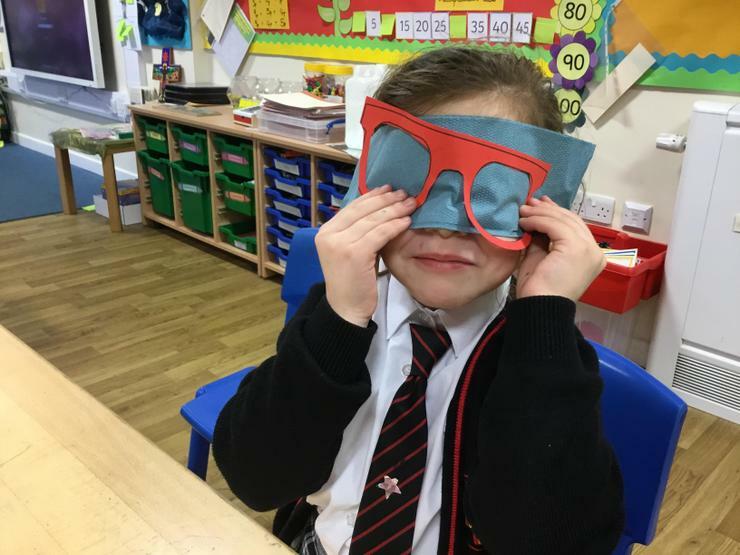 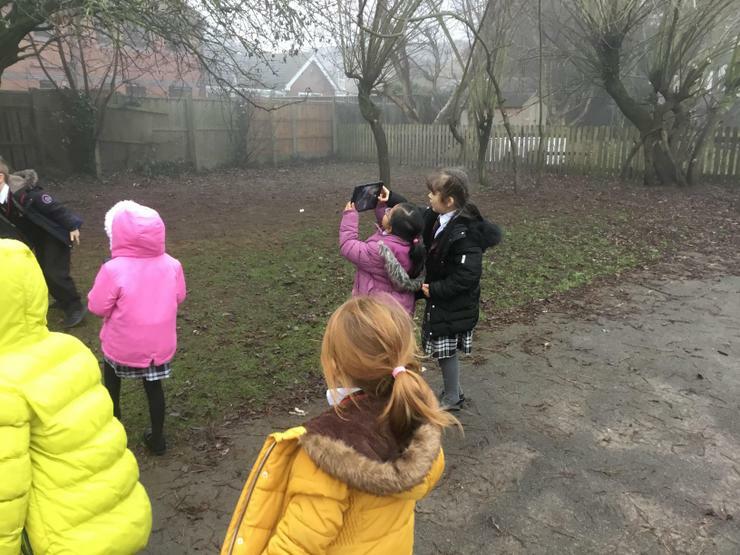 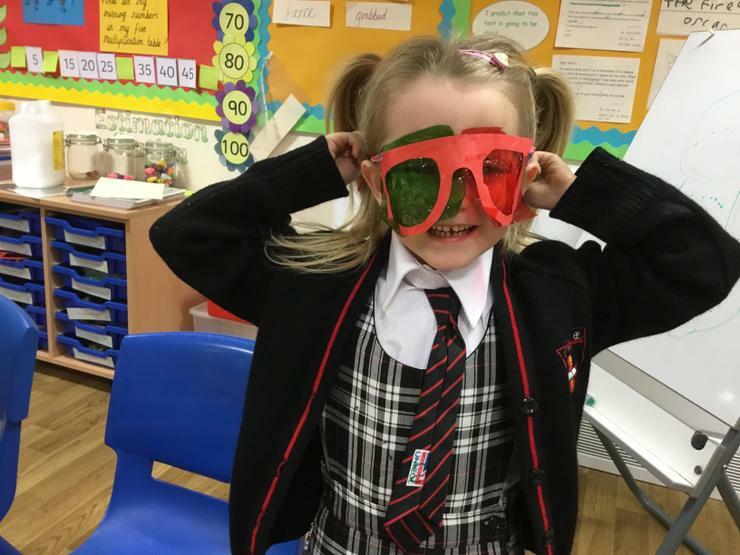 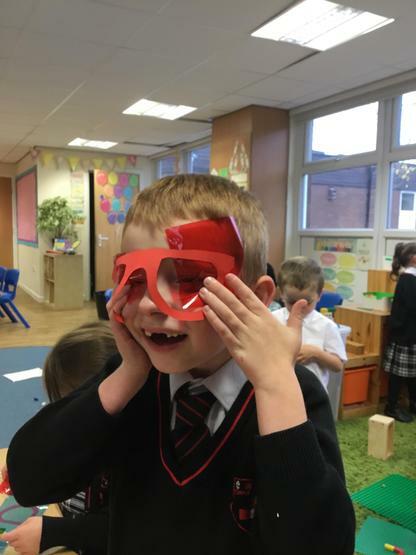 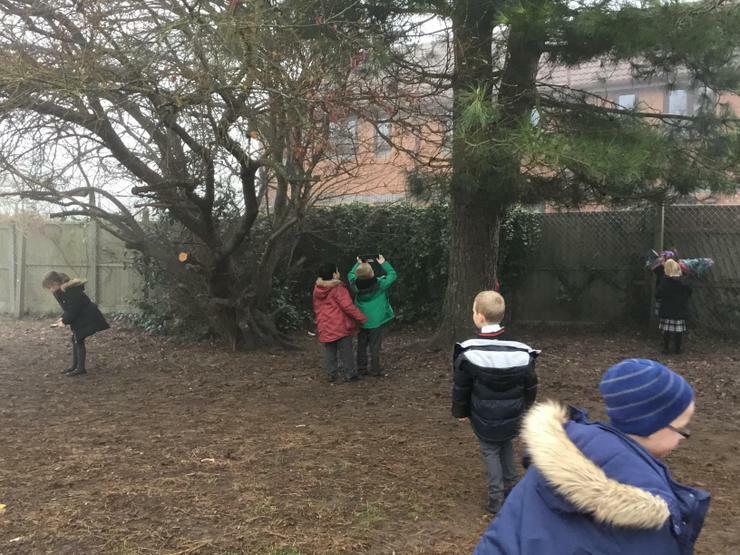 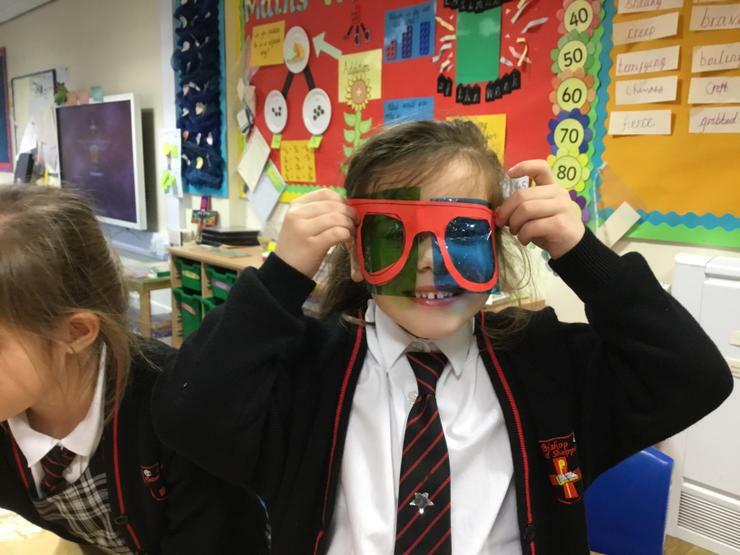 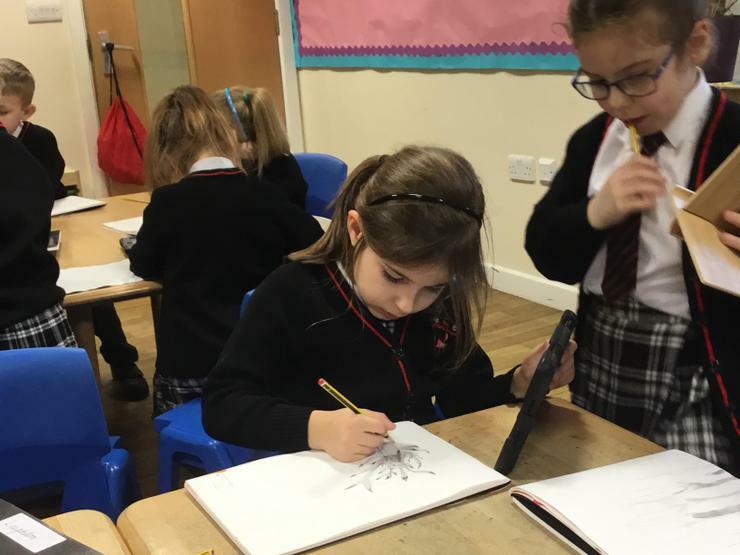 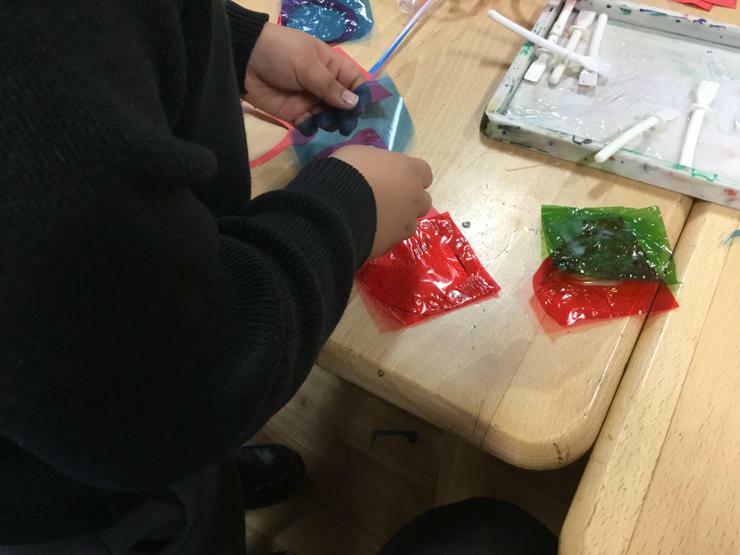 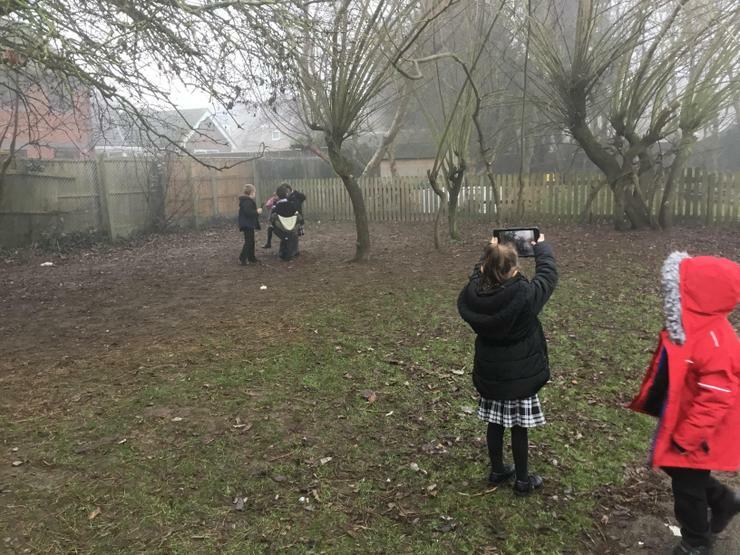 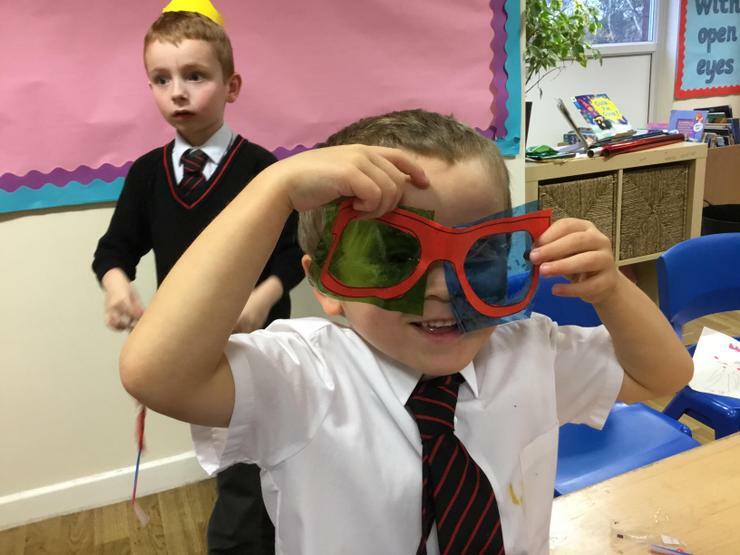 The children were given a range of materials to choose from for the lenses and, using their knowledge of opaque, translucent and transparent materials, they had to decide which one would be best for their sunglasses. 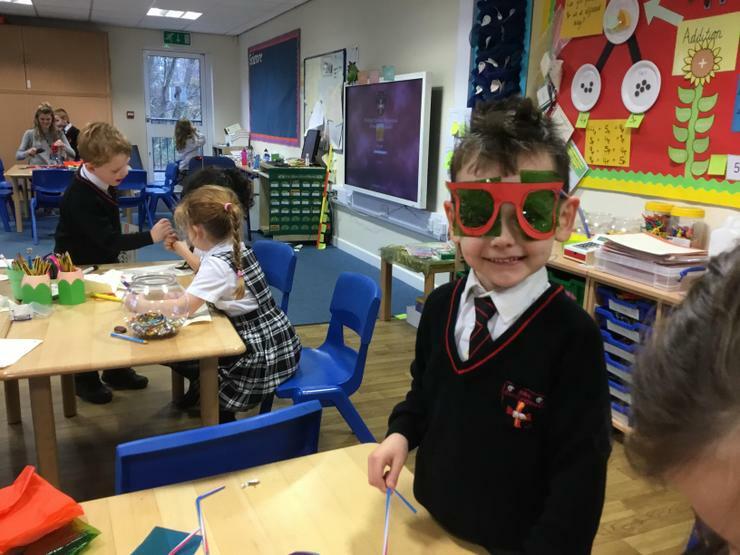 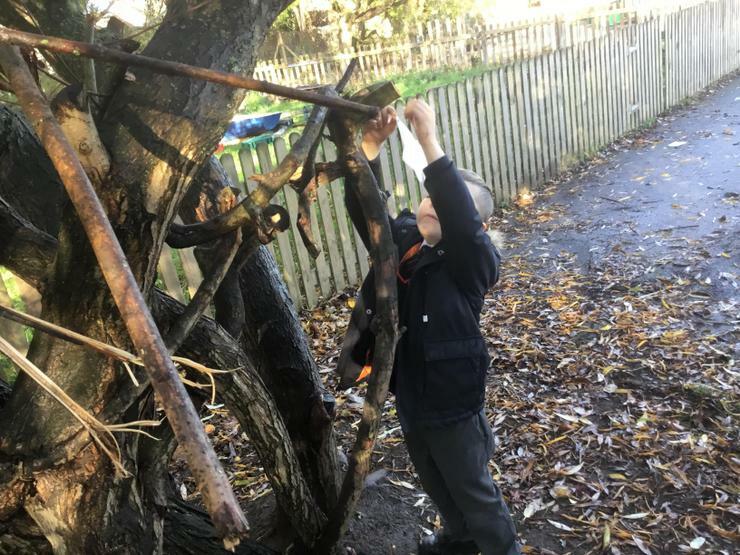 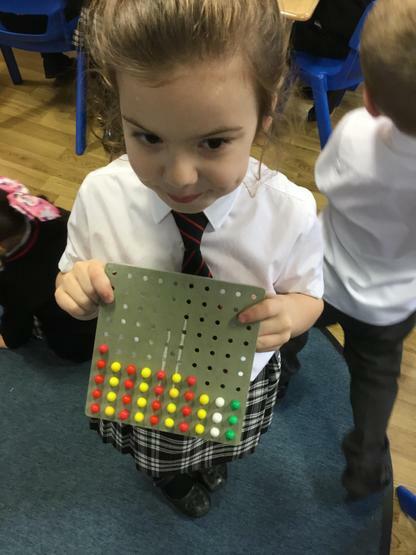 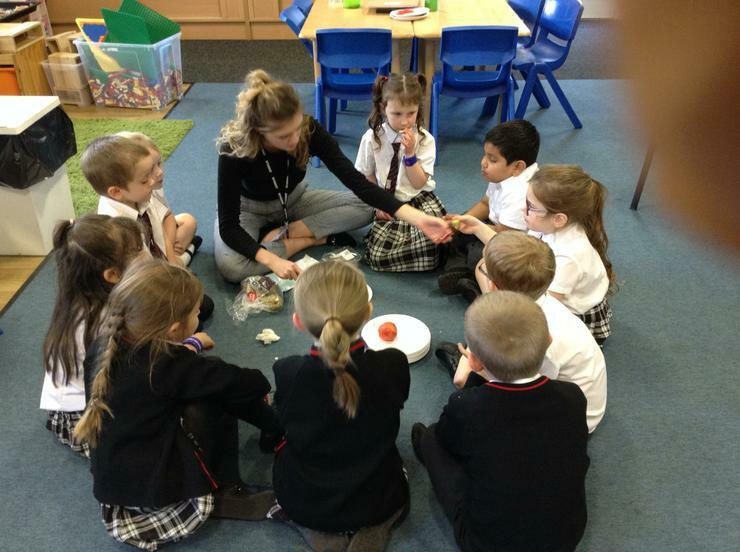 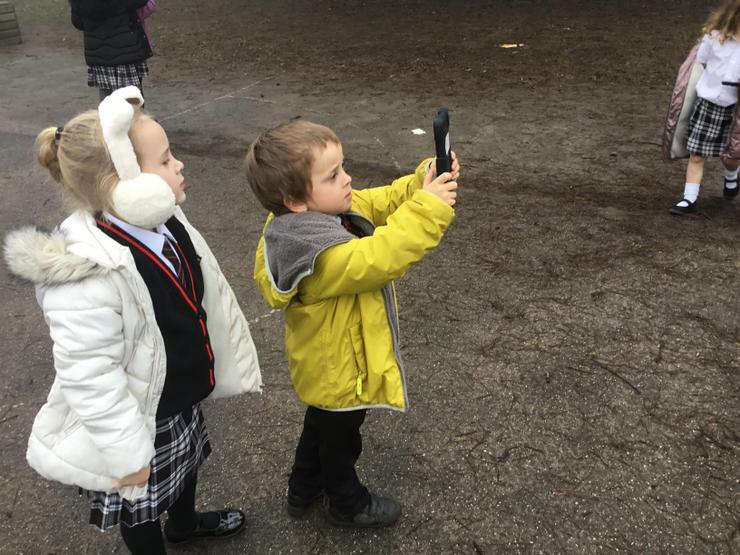 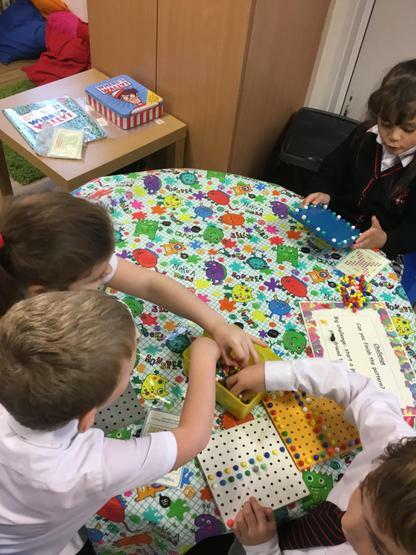 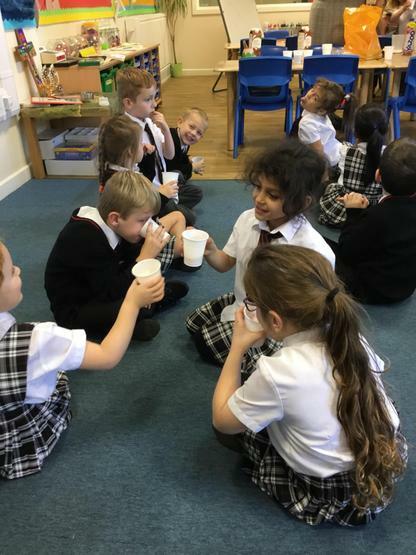 Year 1 had a brilliant time making and testing out their creations! 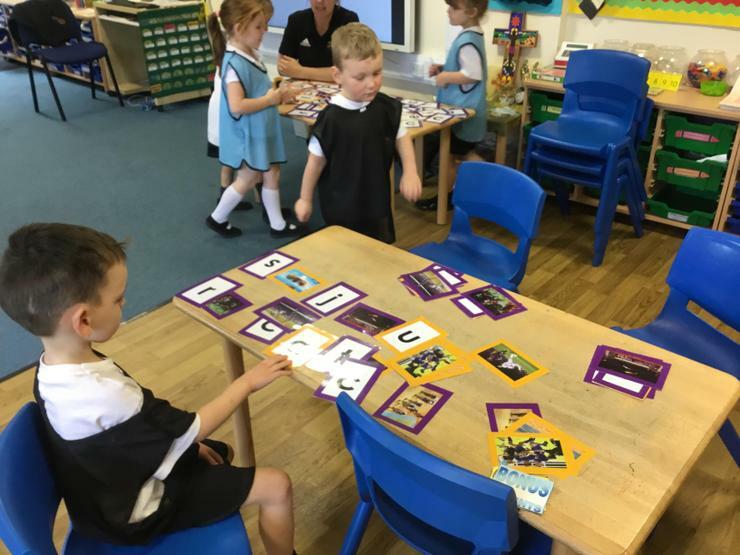 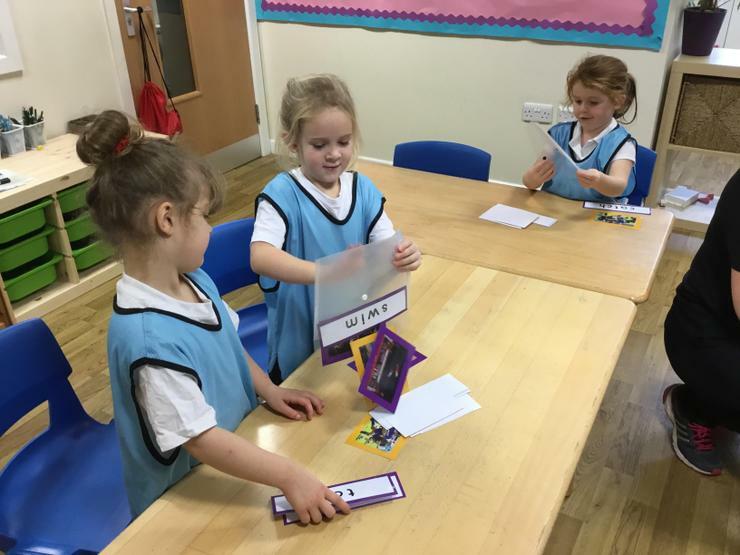 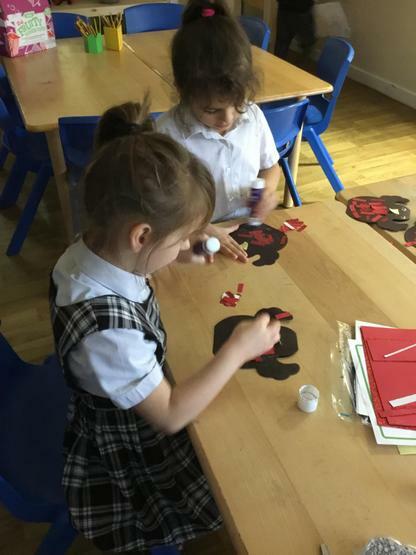 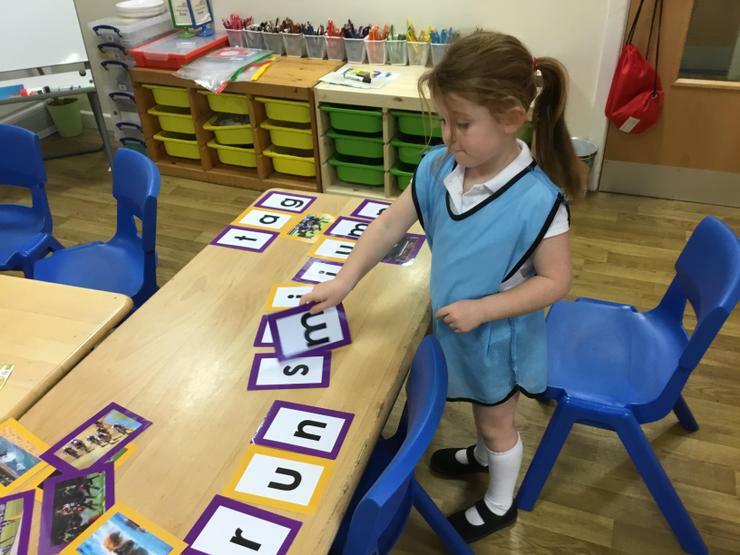 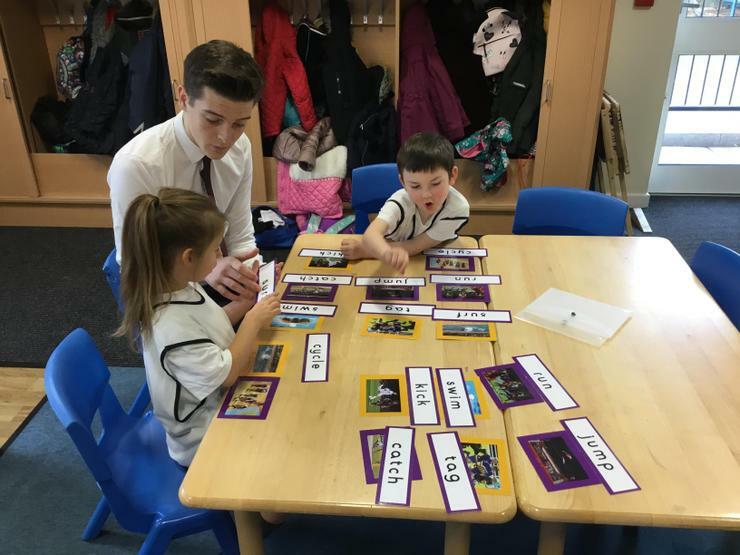 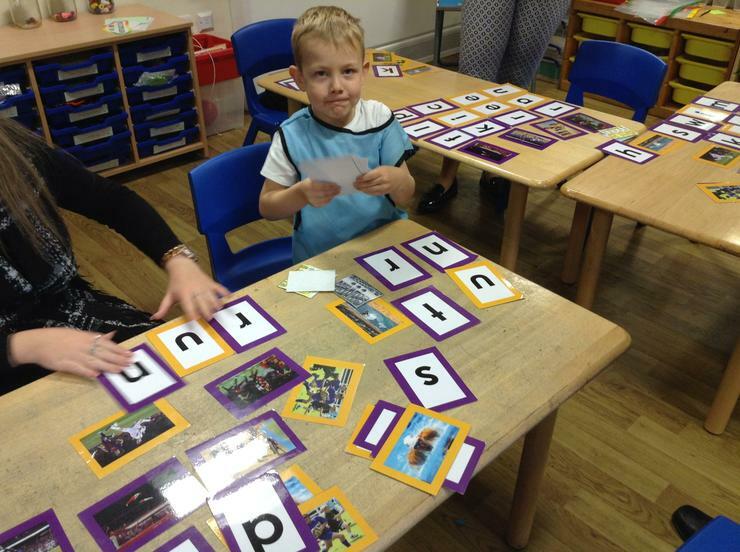 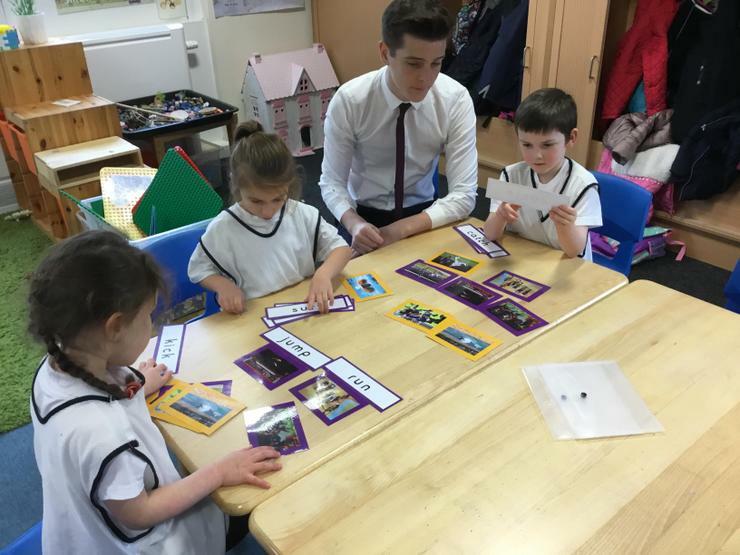 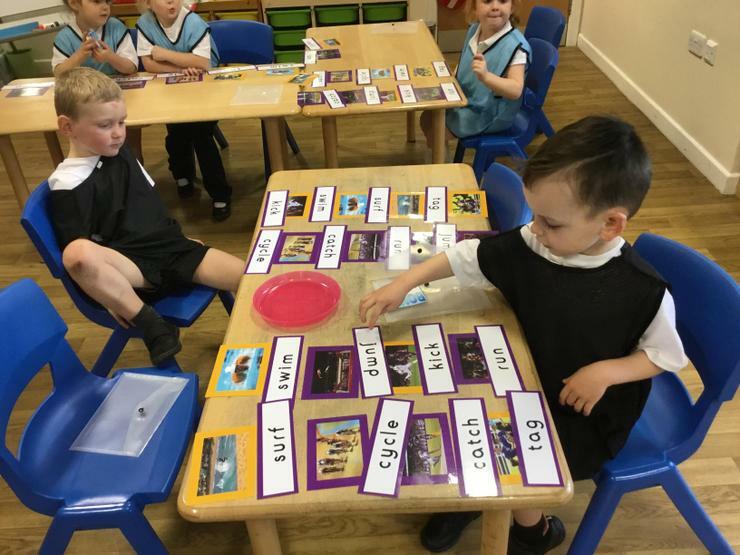 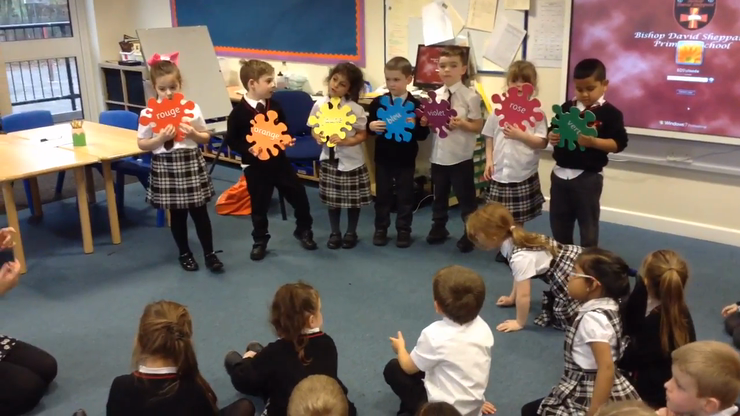 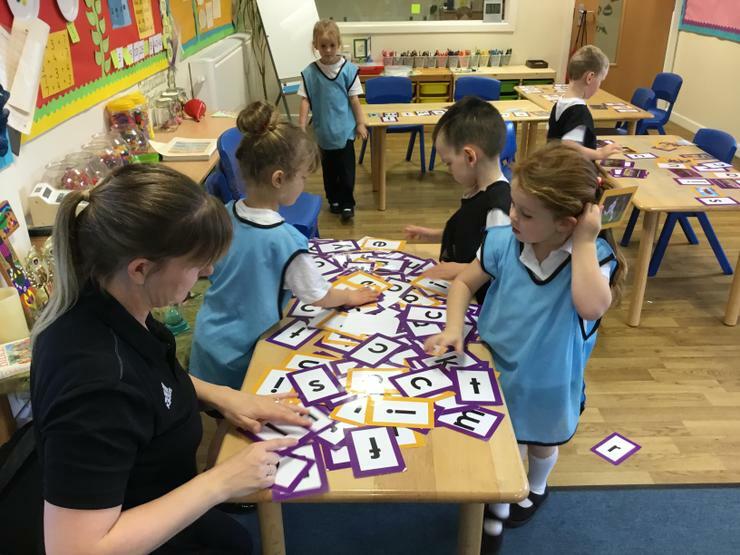 The children have been learning how to pronounce their colours in French. 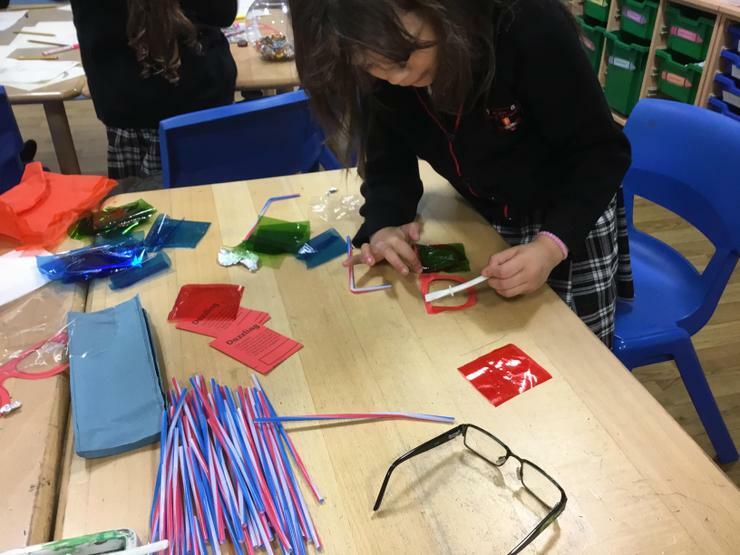 They have applied their understanding of this through learning and performing Les Couleurs de l’arc-en-ciel. 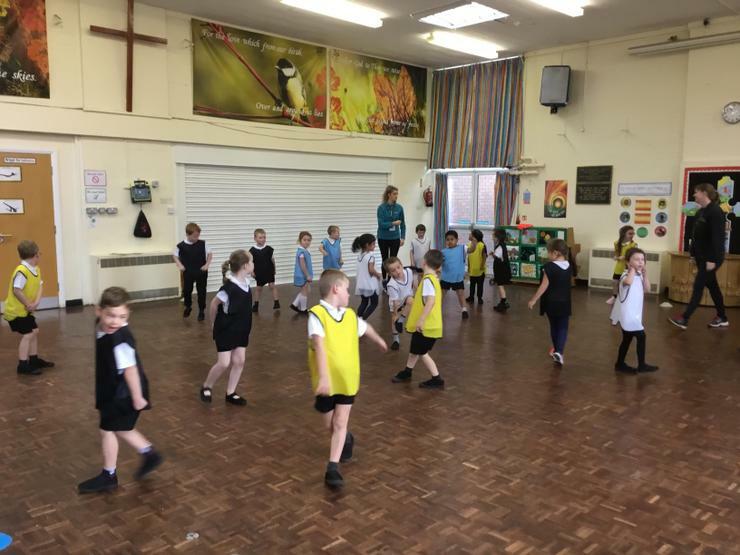 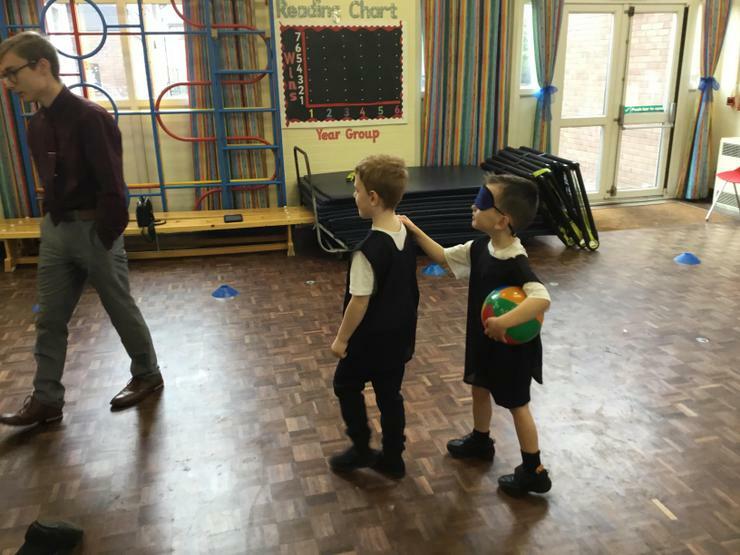 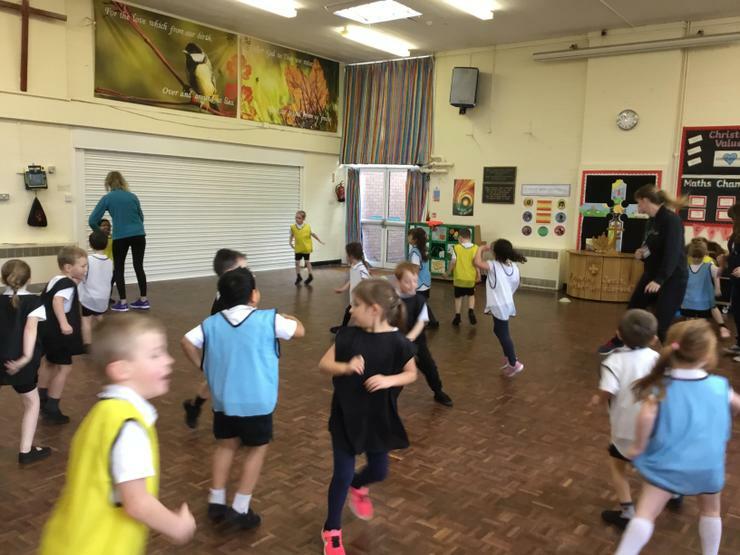 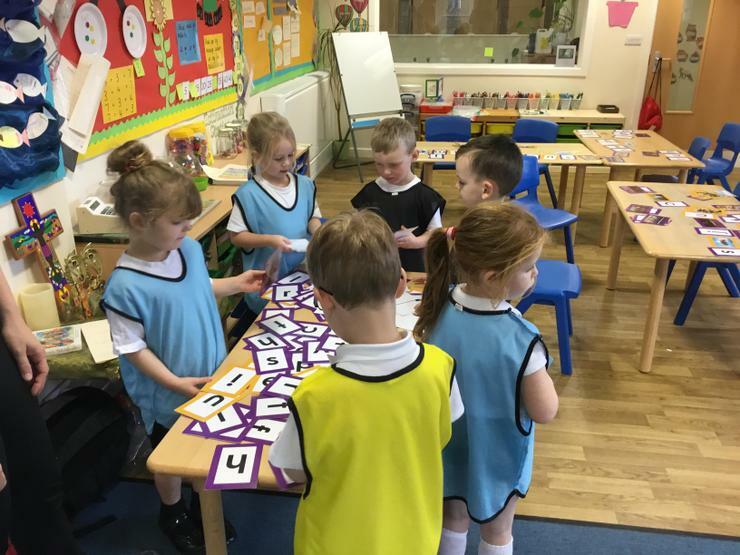 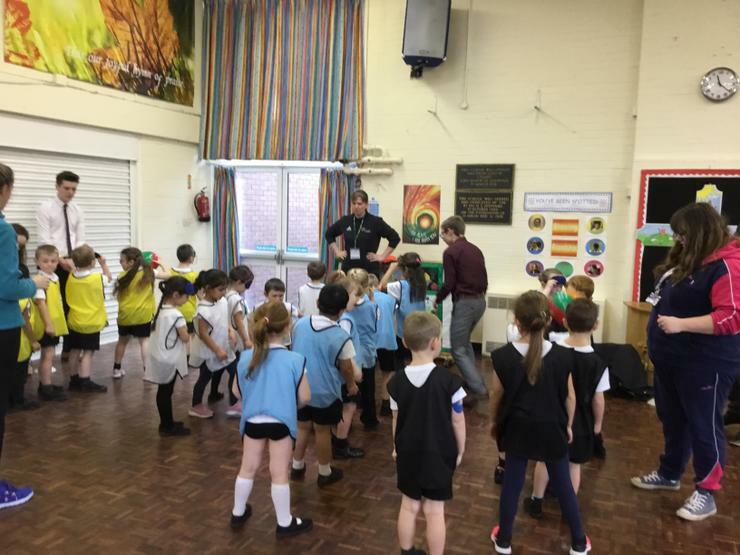 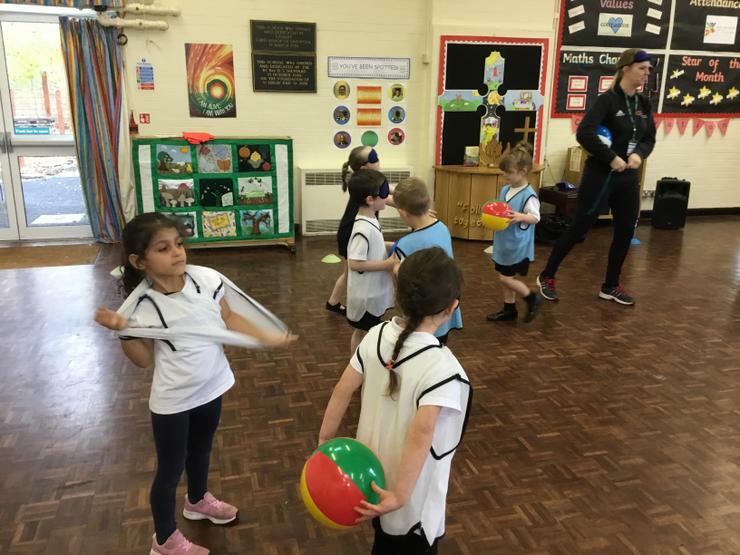 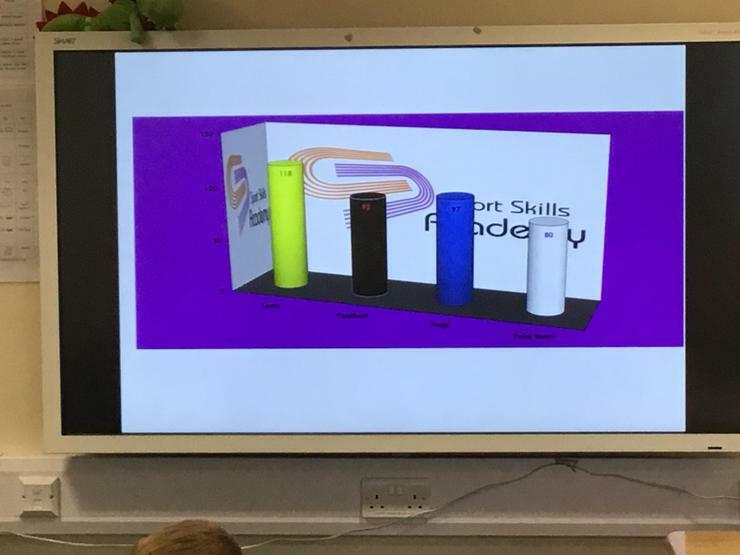 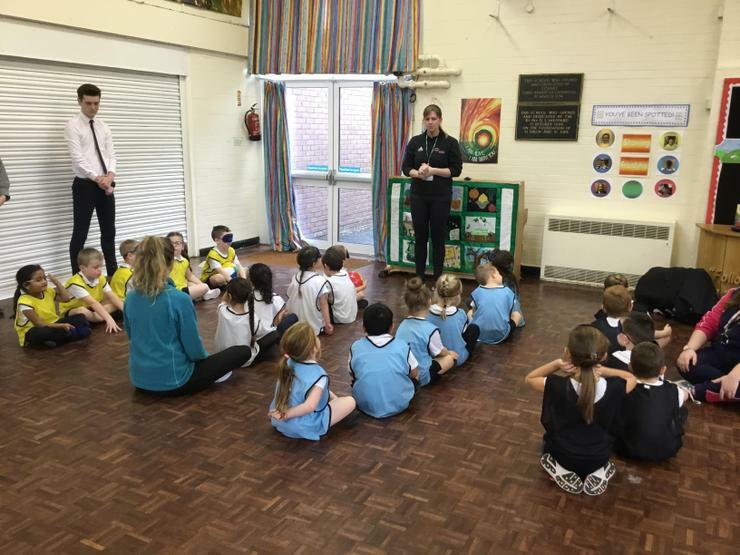 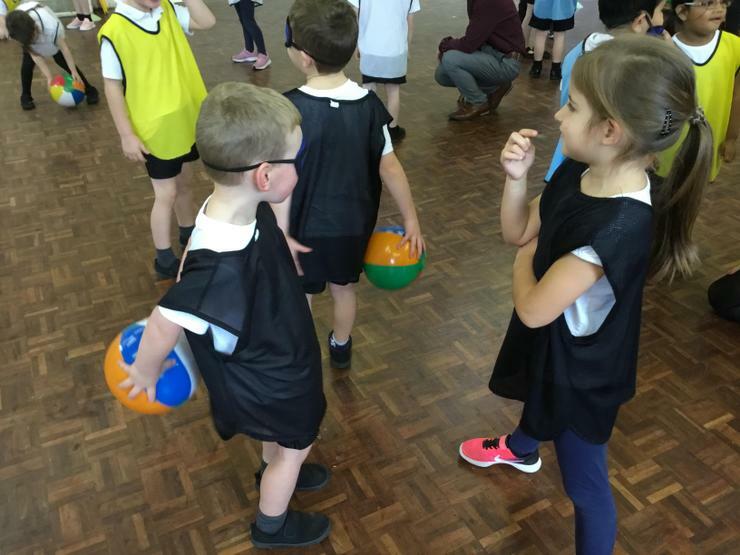 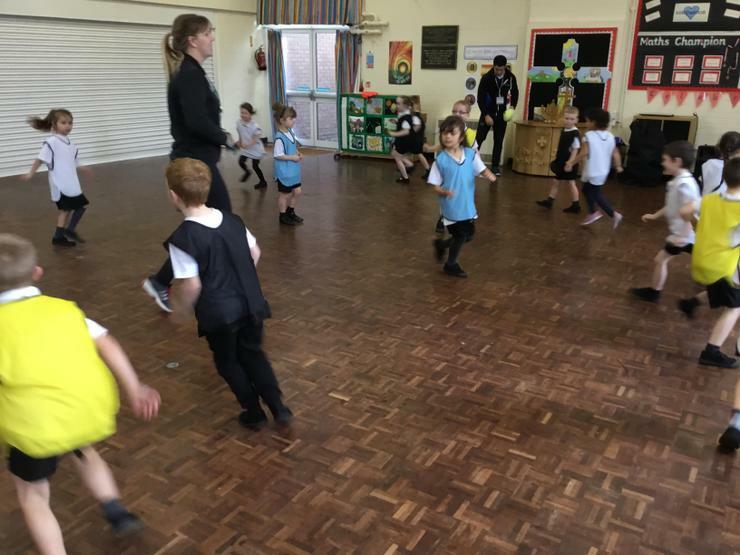 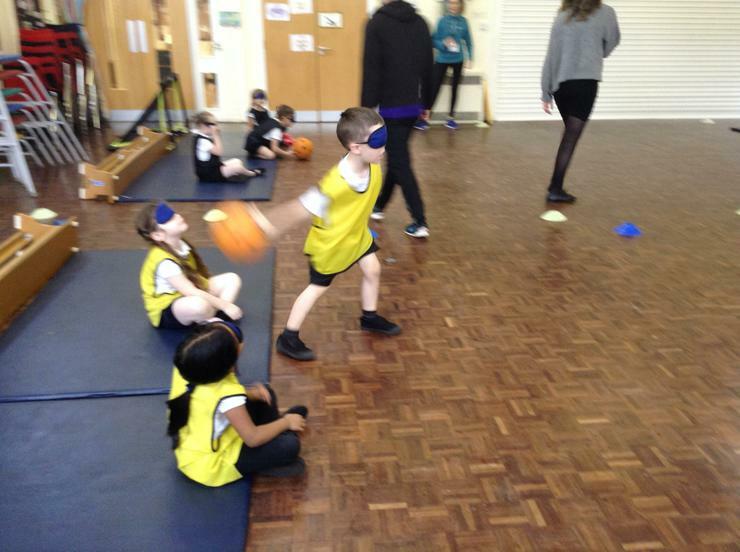 Year 1 were lucky enough to work with the Sports Academy for a whole day! 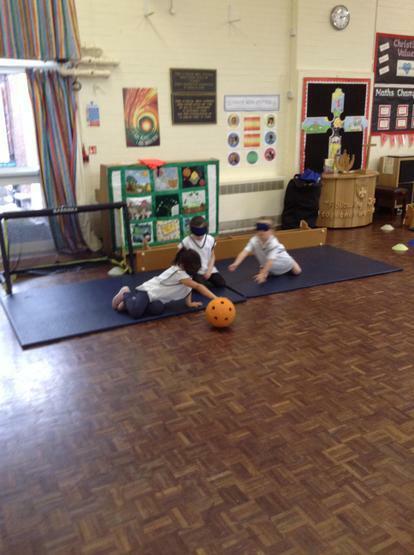 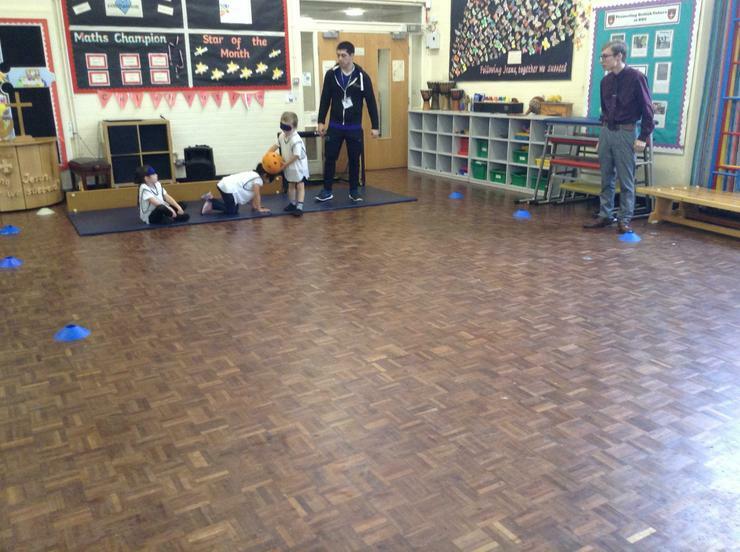 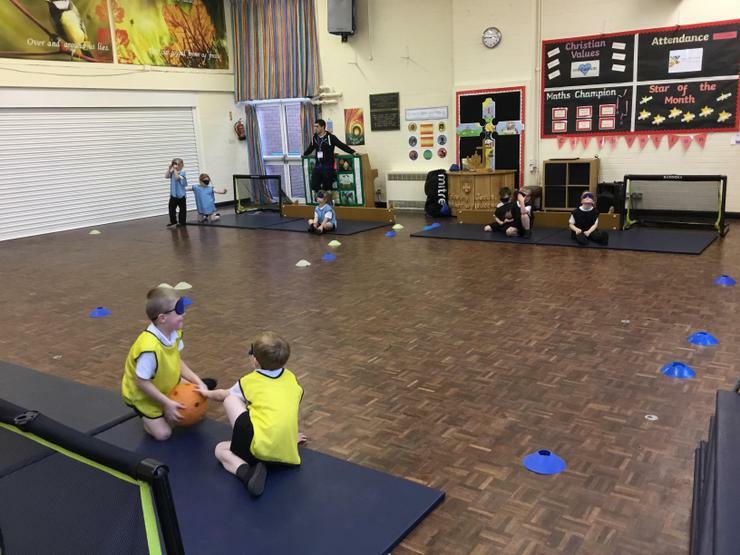 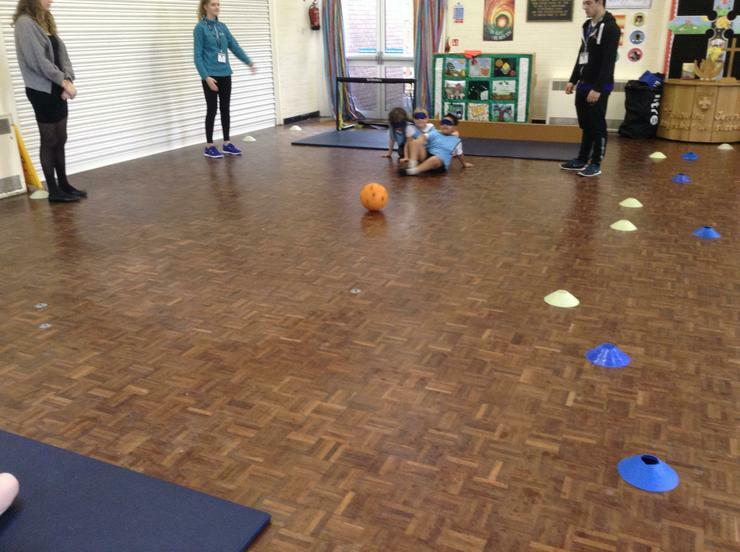 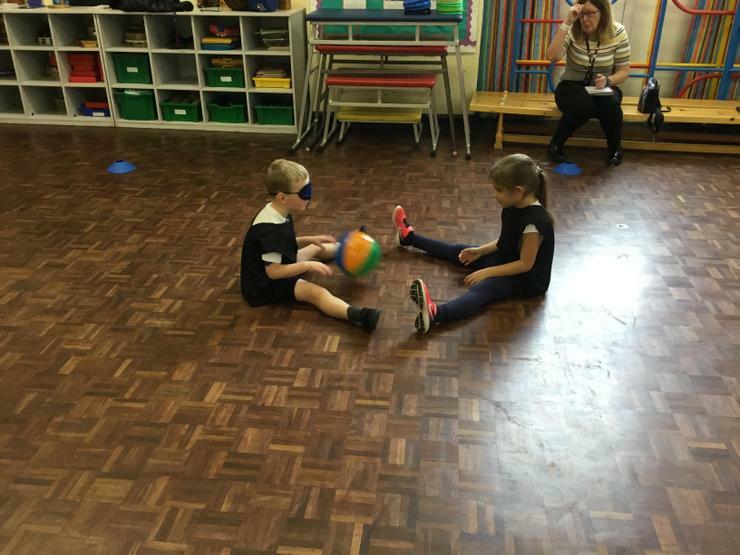 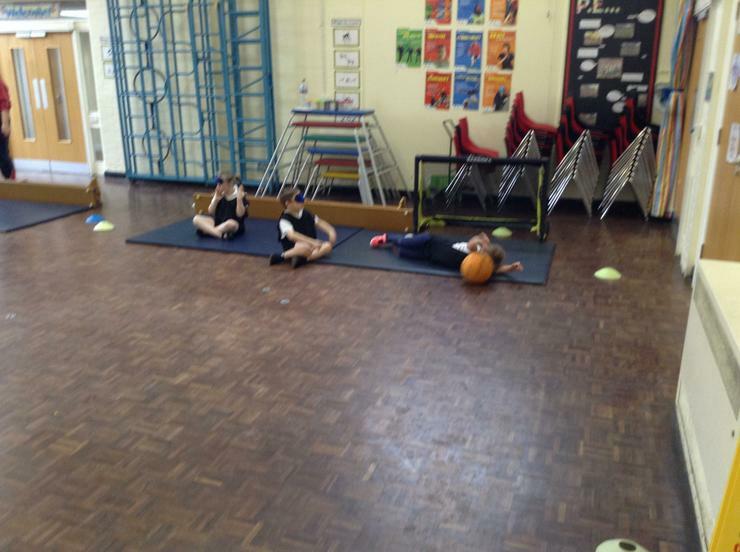 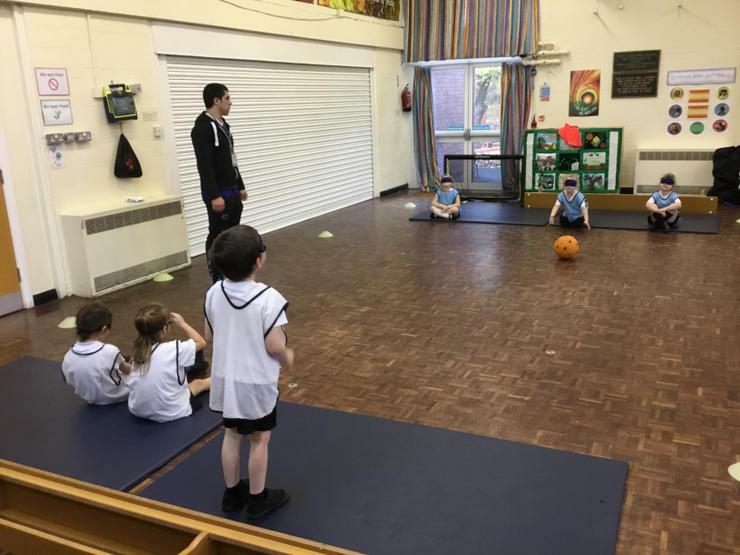 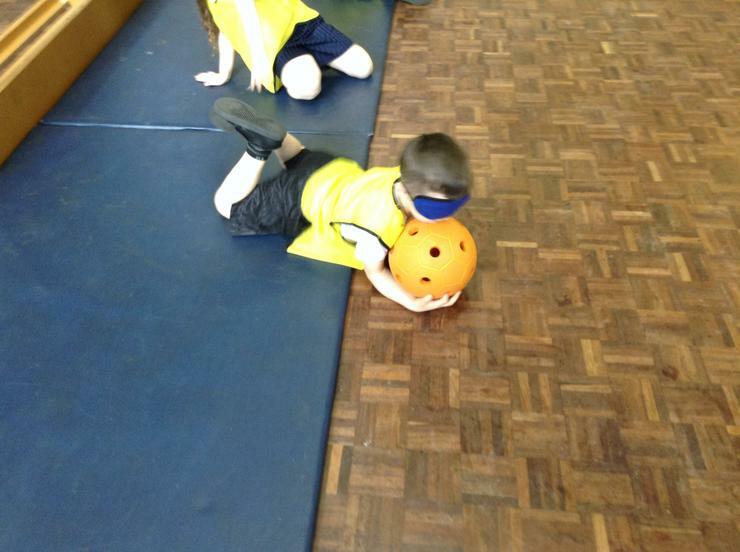 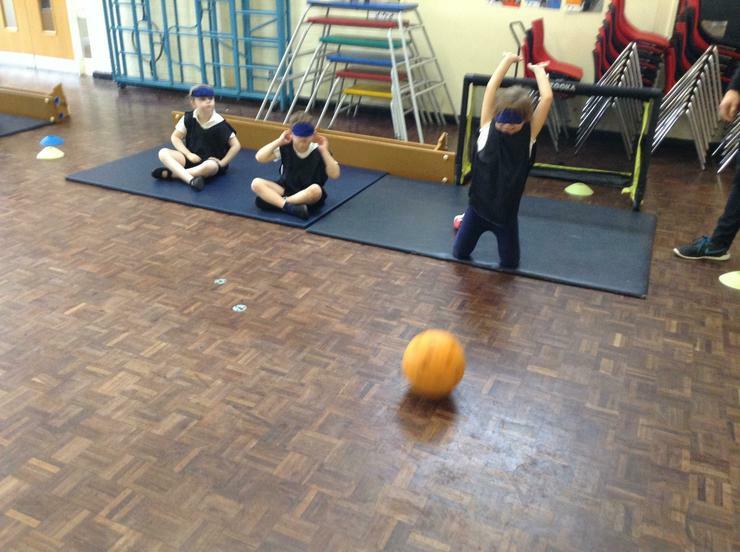 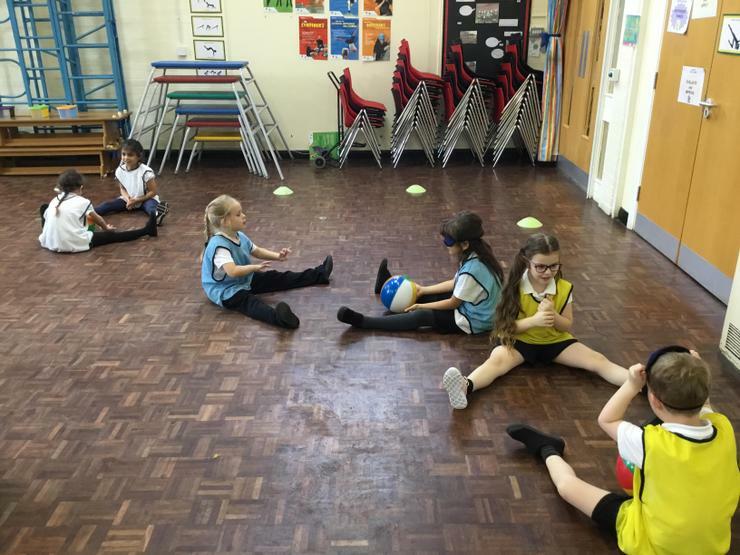 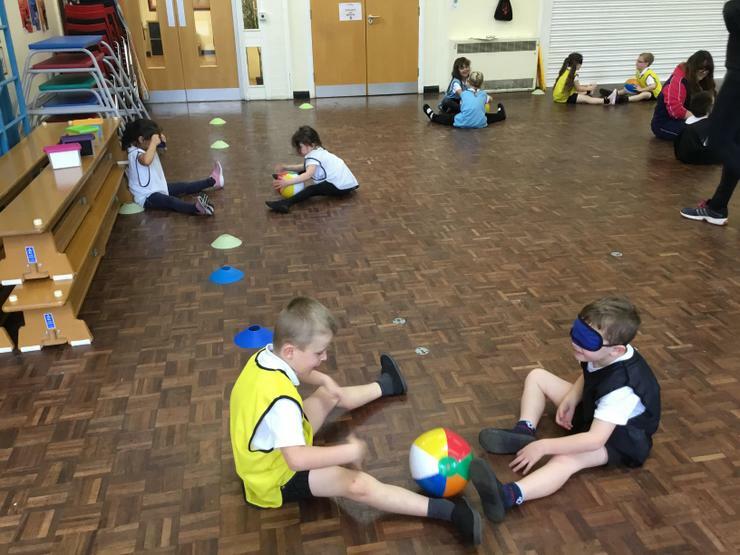 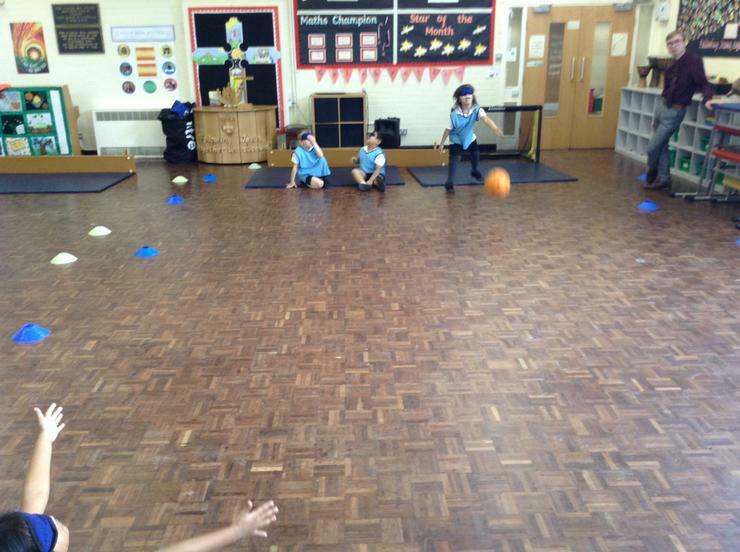 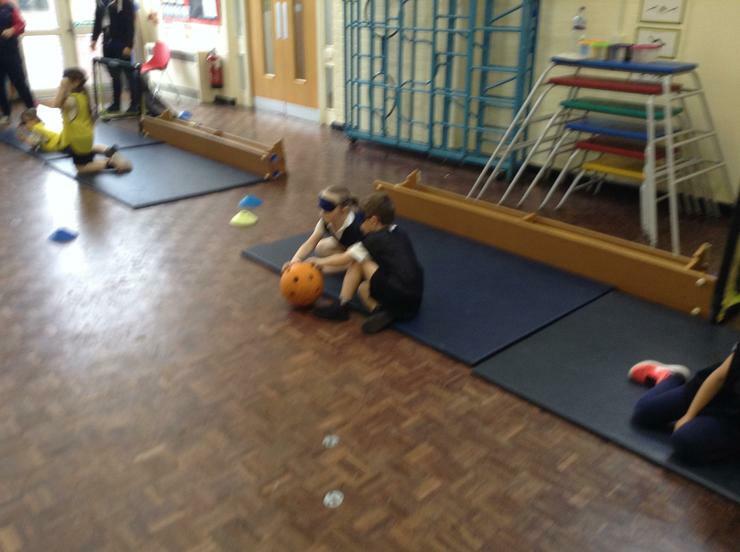 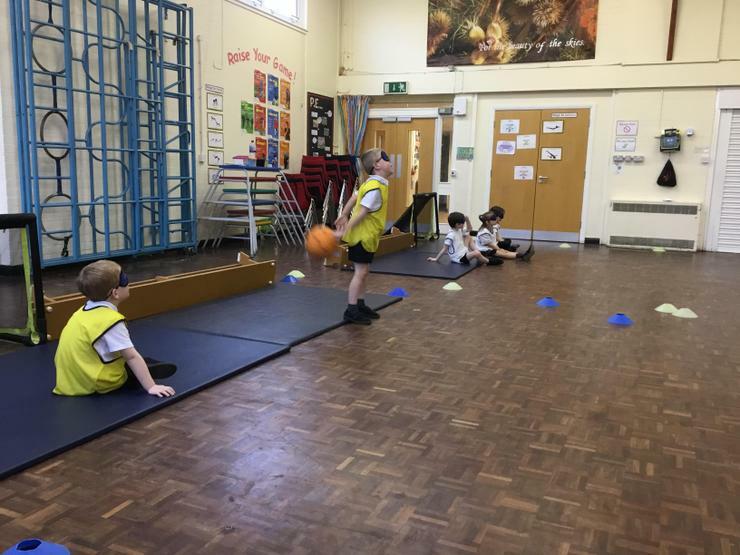 The children learnt a new sport, Goalball, and used their phonics knowledge to solve spelling problems. 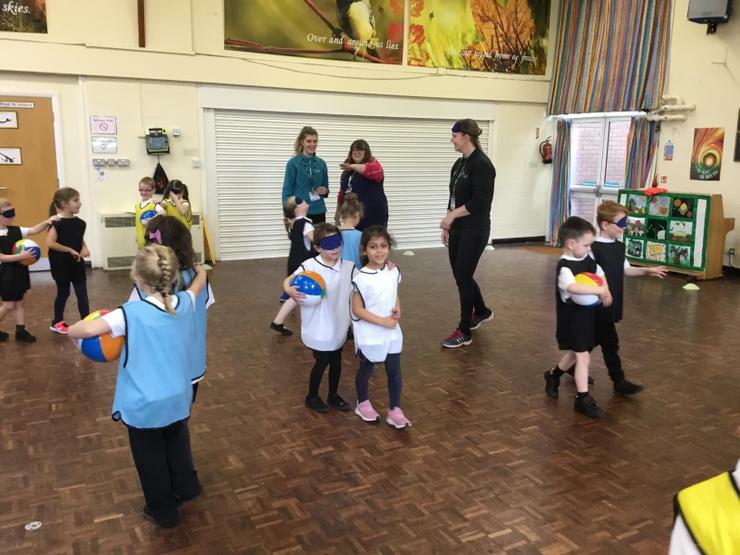 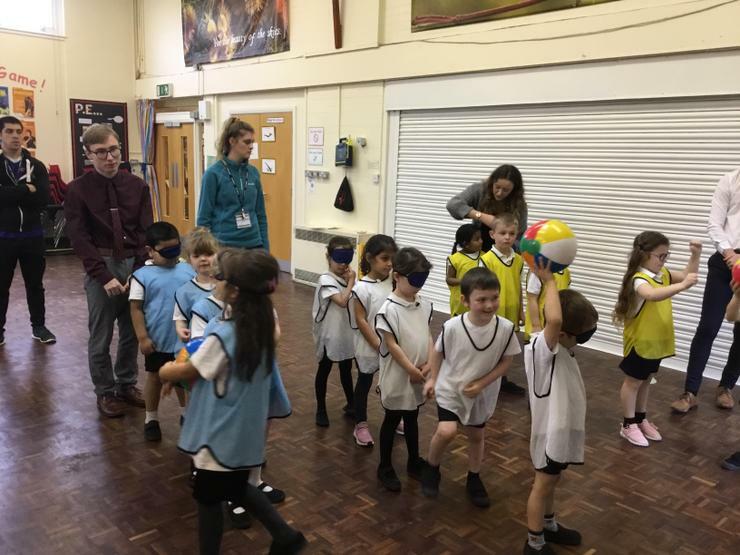 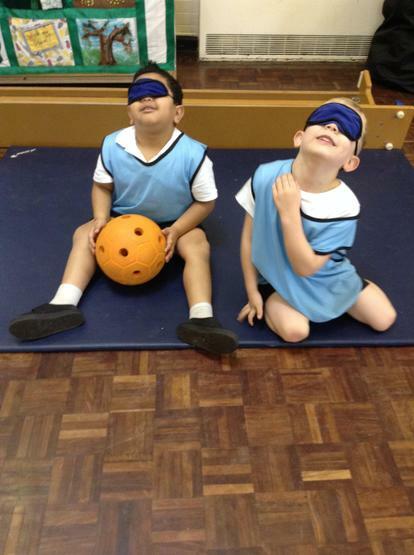 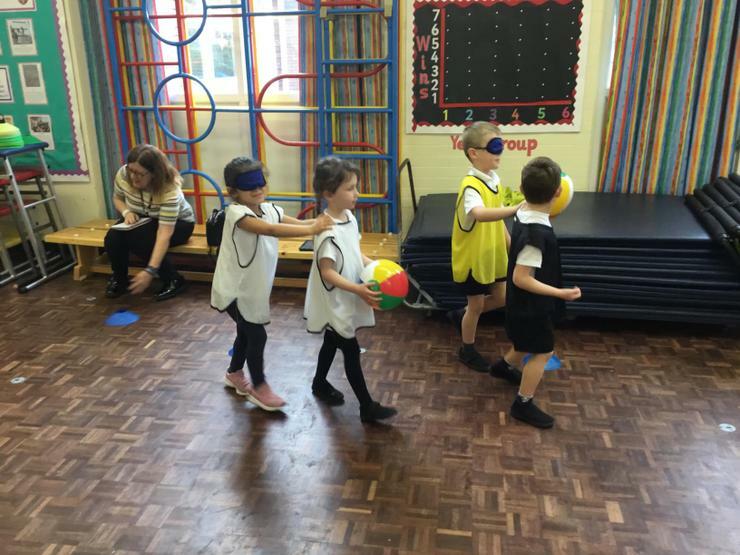 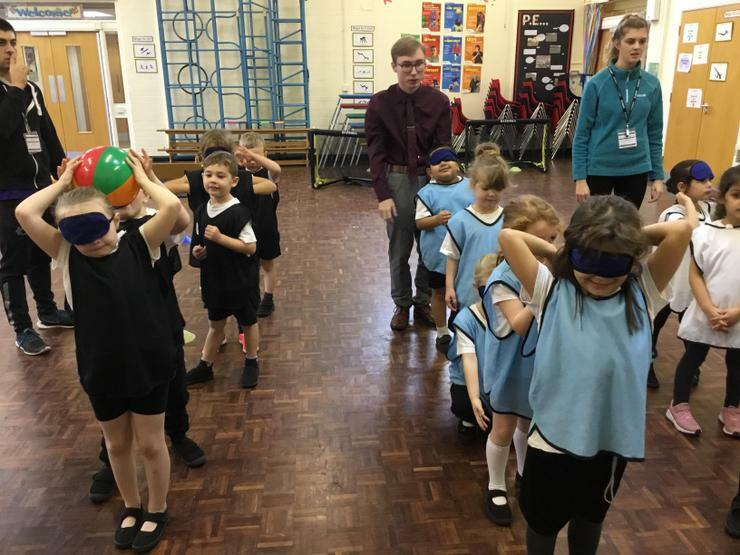 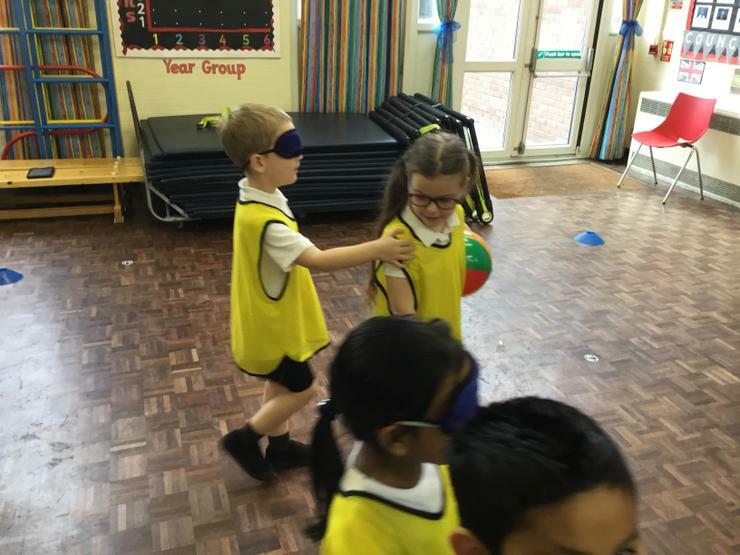 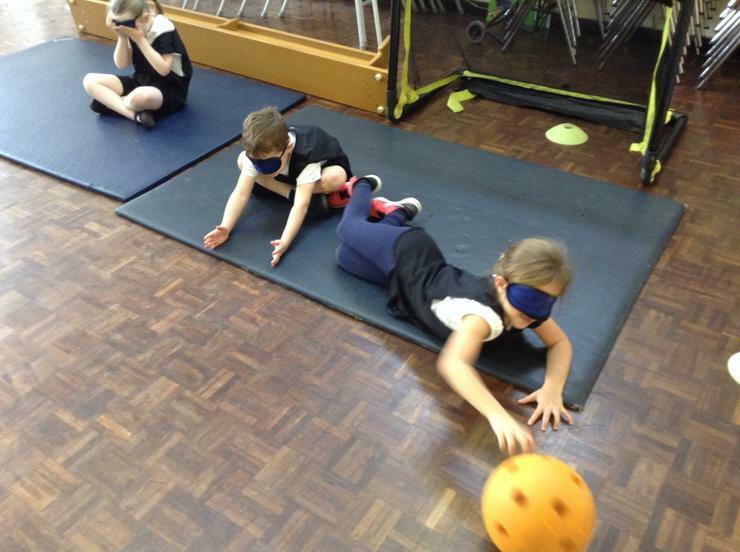 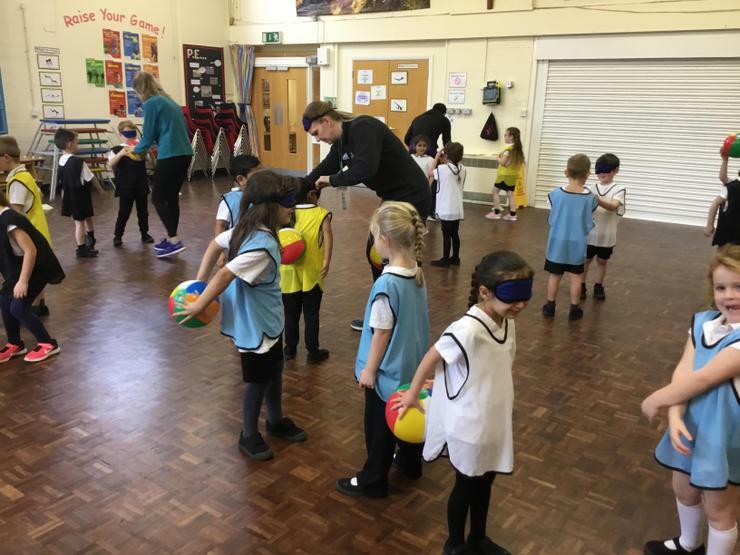 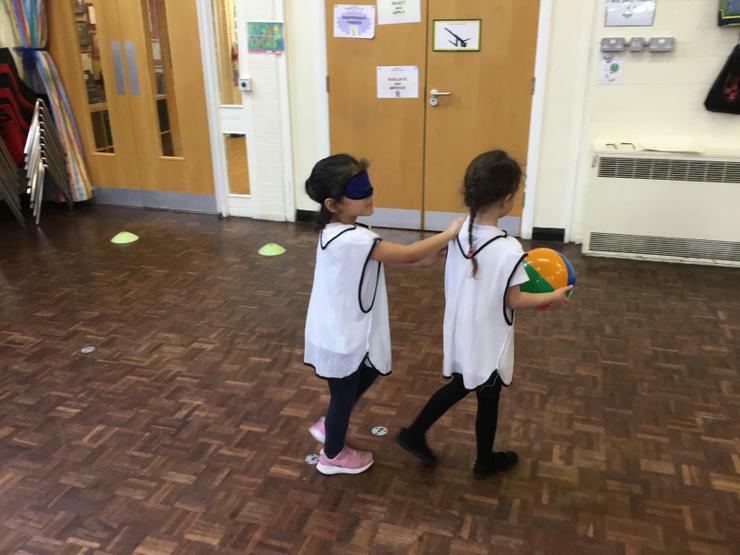 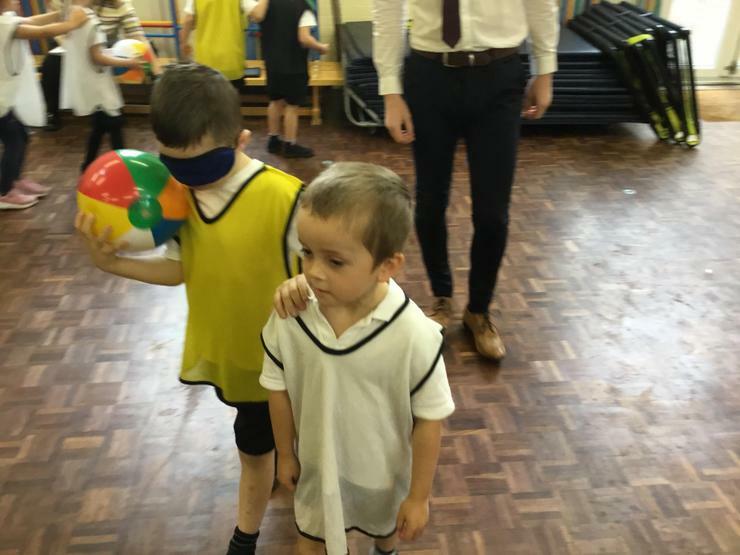 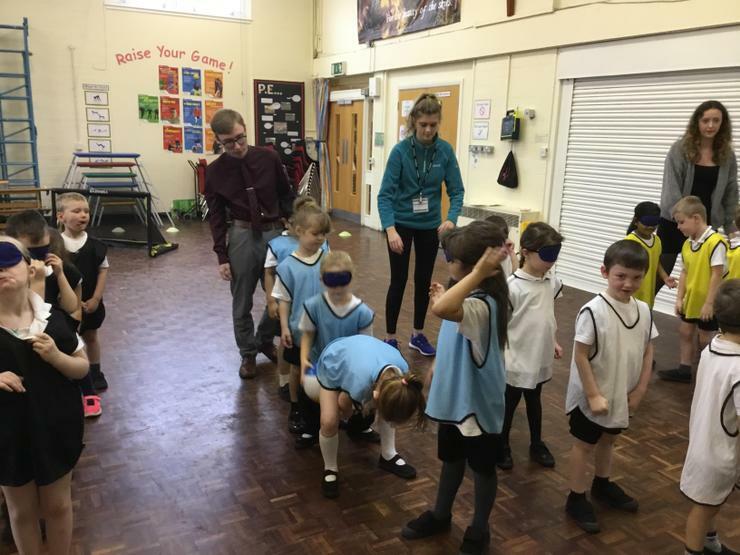 Goalball is an Olympic sport, specifically designed for athletes with a vision impairment so our children used blind folds. 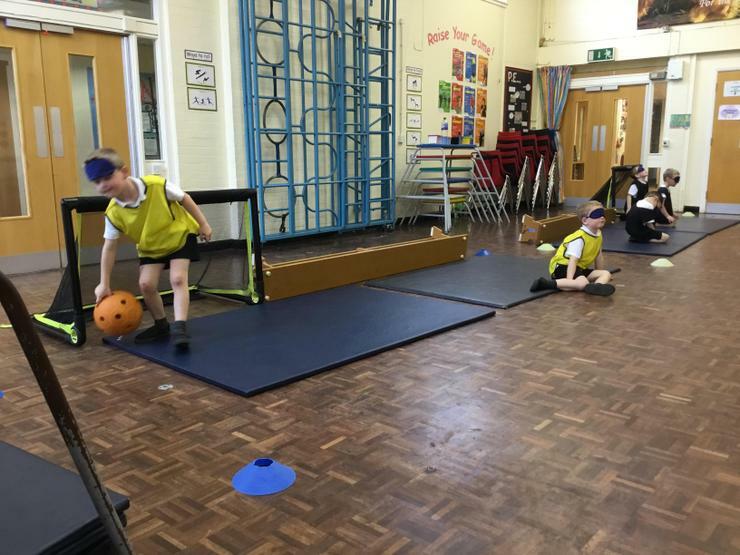 They competed in teams of three and had to throw the ball towards the other teams goal. 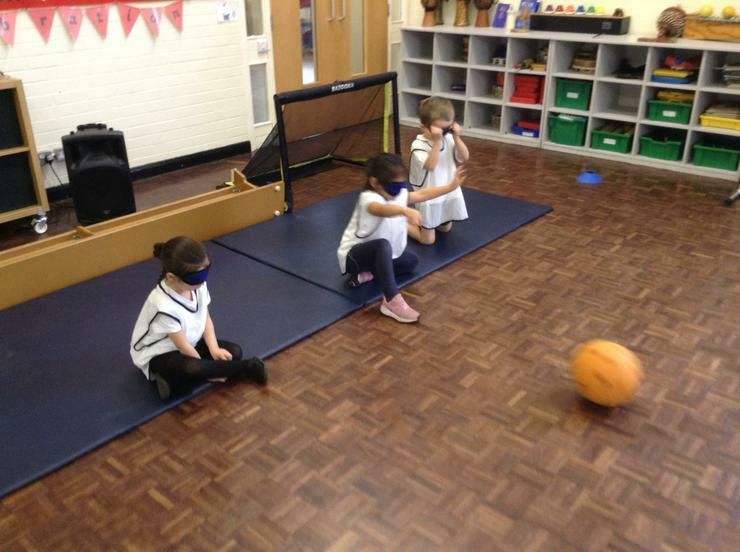 Players must use the sound of the bell, inside the ball, to judge the position and movement of the ball to keep it from going in their goal. 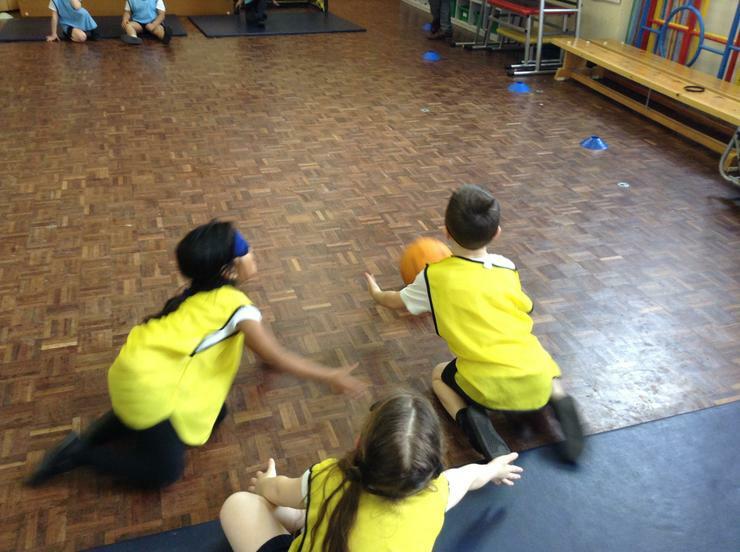 The children worked extremely hard to gain points for their team and our winners were the Lion Team with 118 points! 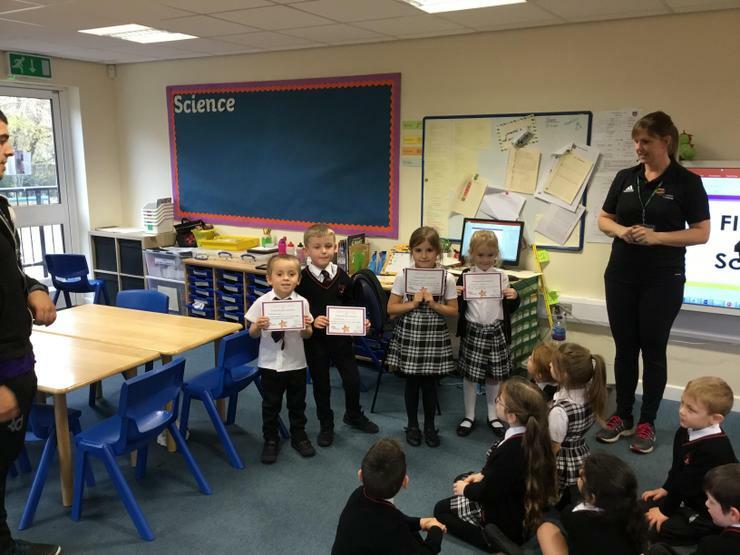 For each team a child was presented with a certificate for outstanding team work. 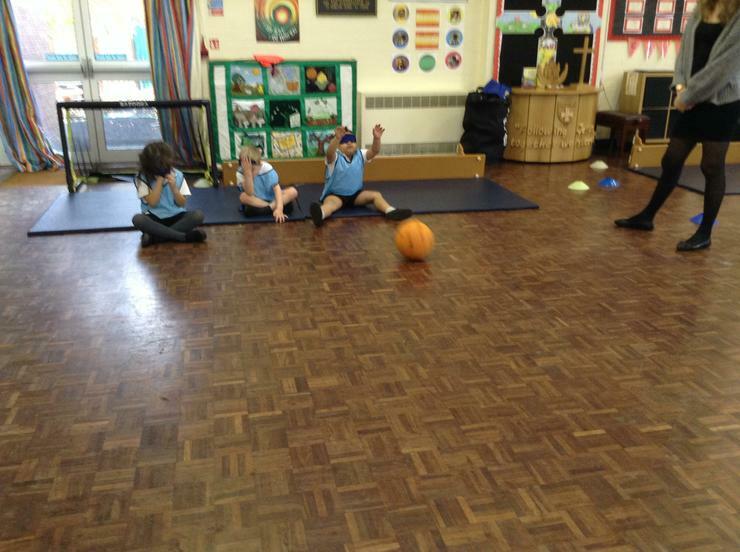 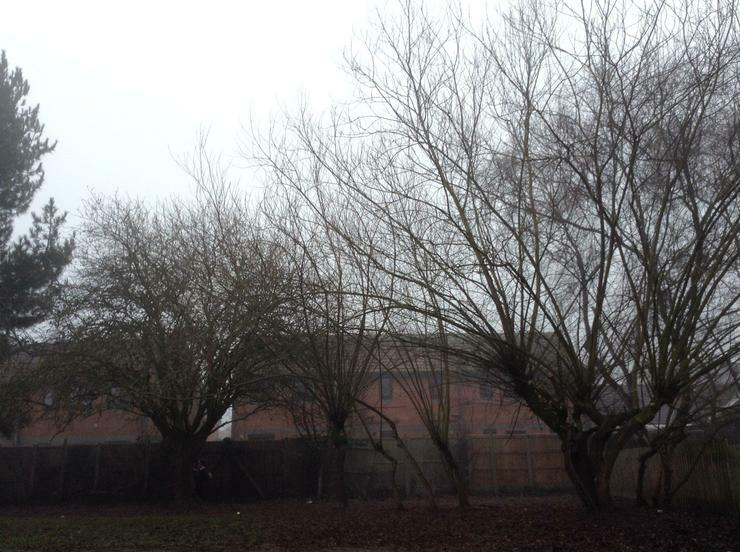 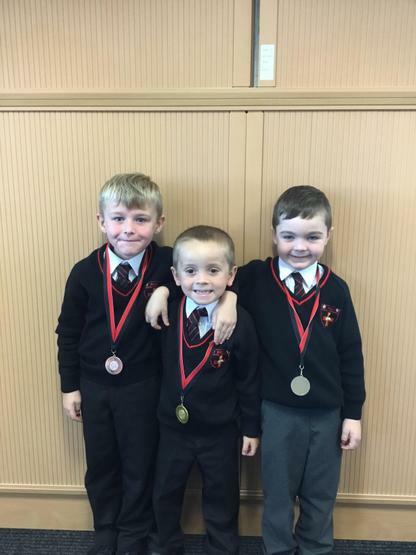 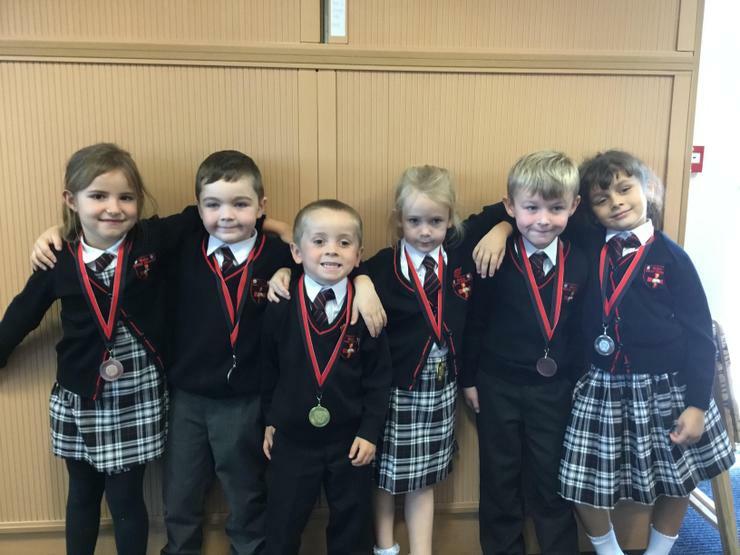 Well done Sandra, Madison, Kye and Luke for their great effort today and to the rest of Year 1 for working so hard! 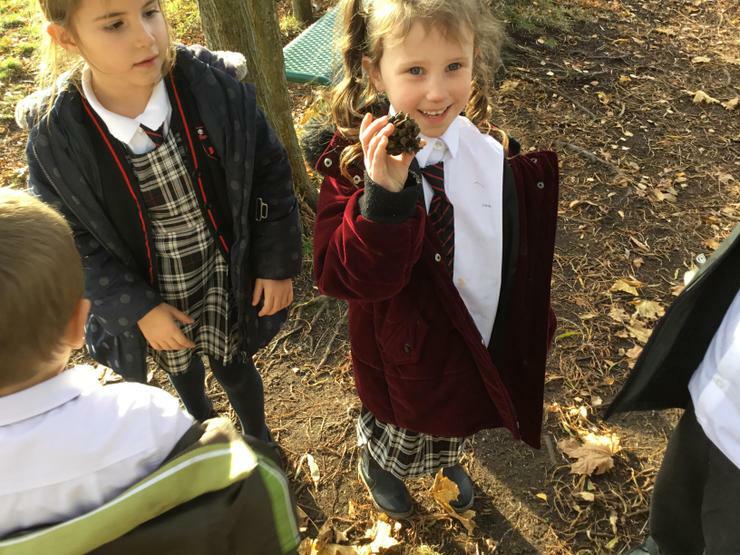 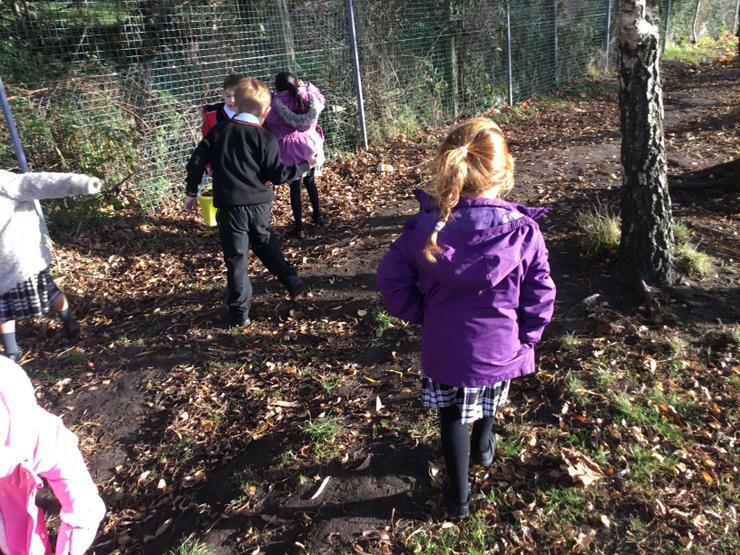 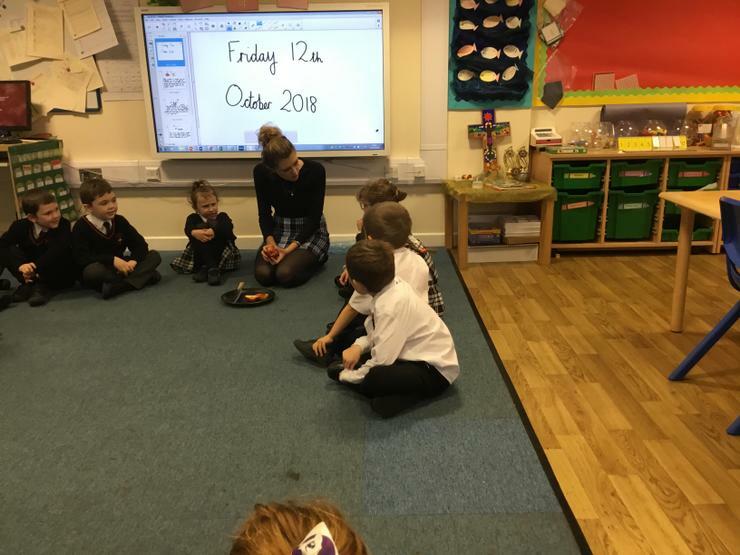 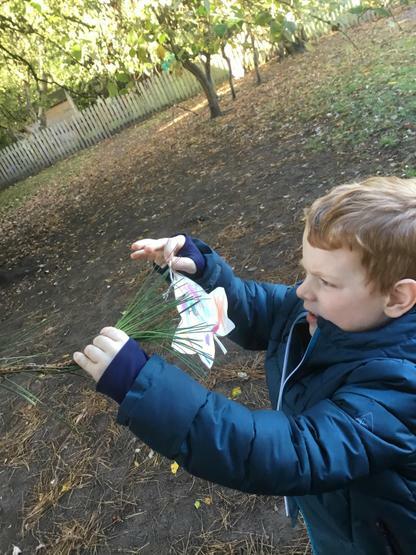 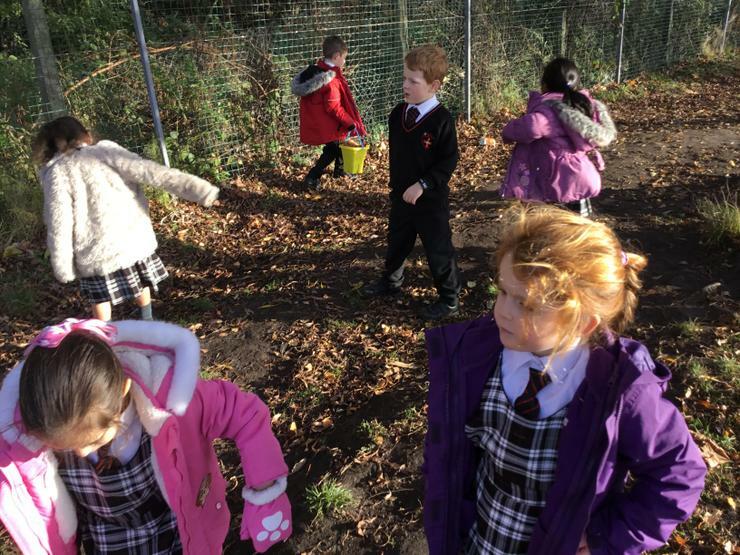 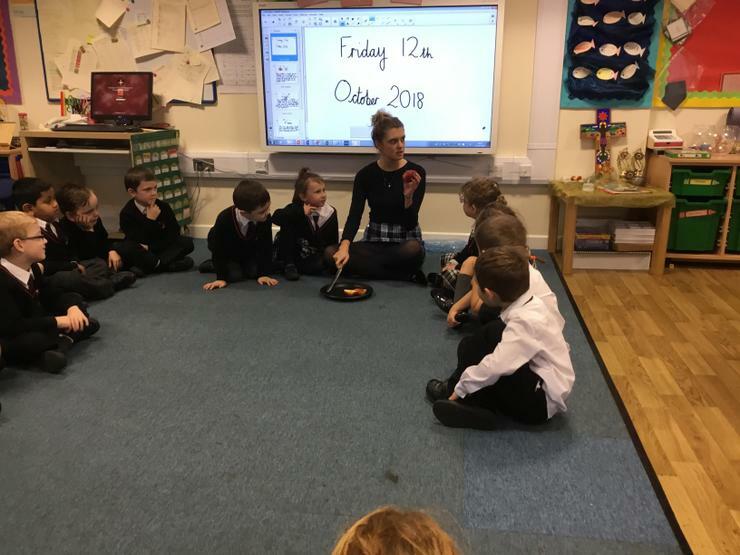 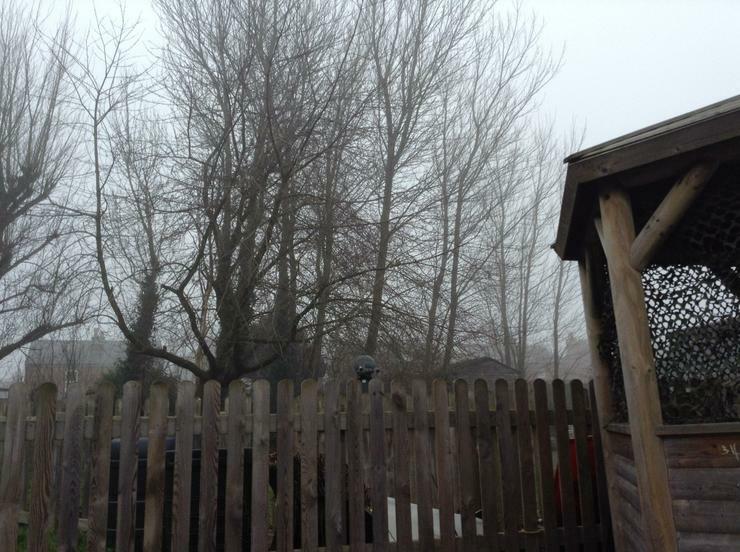 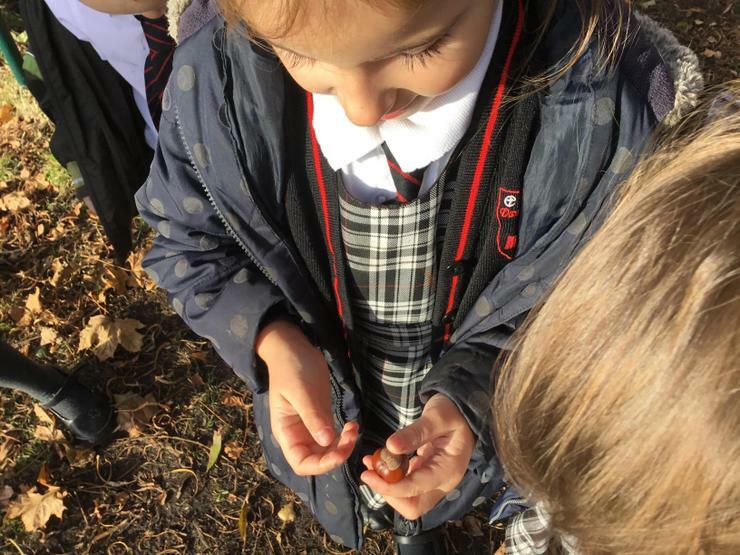 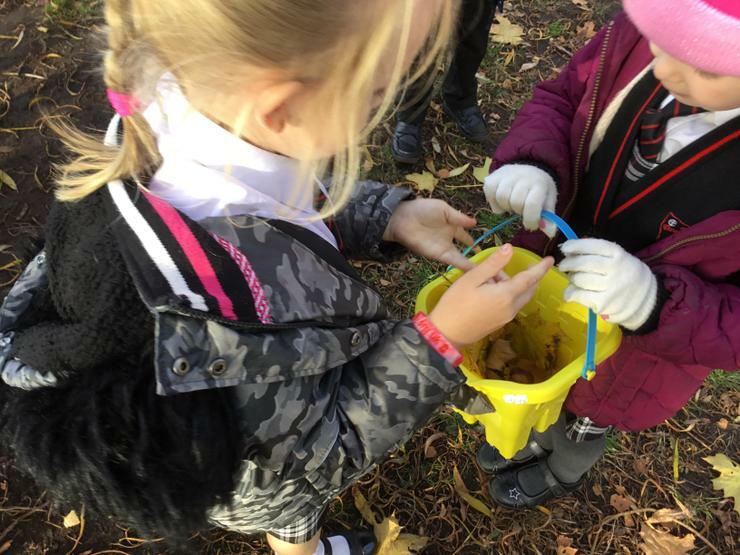 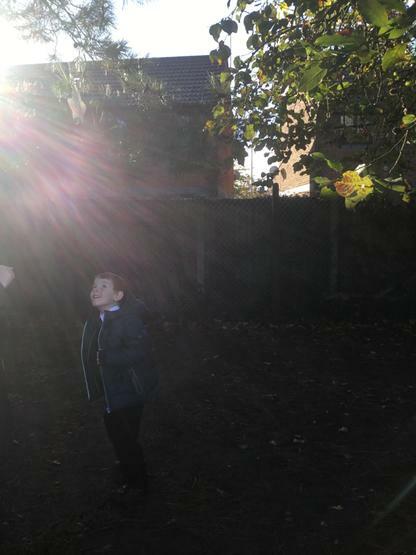 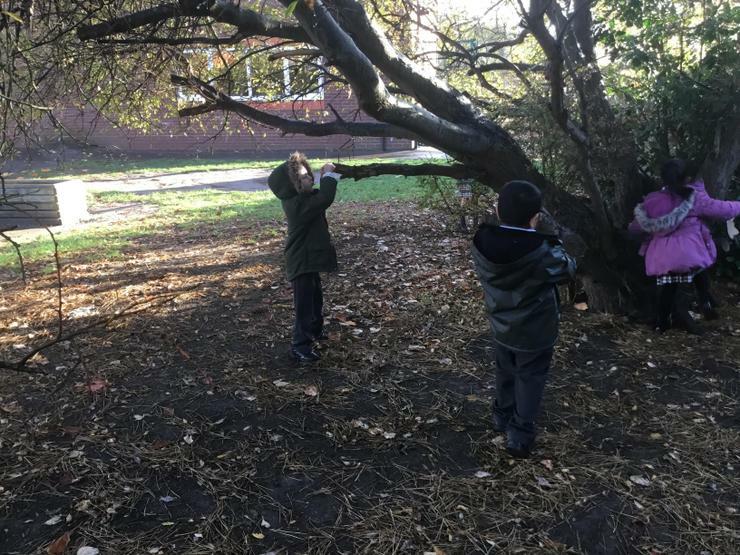 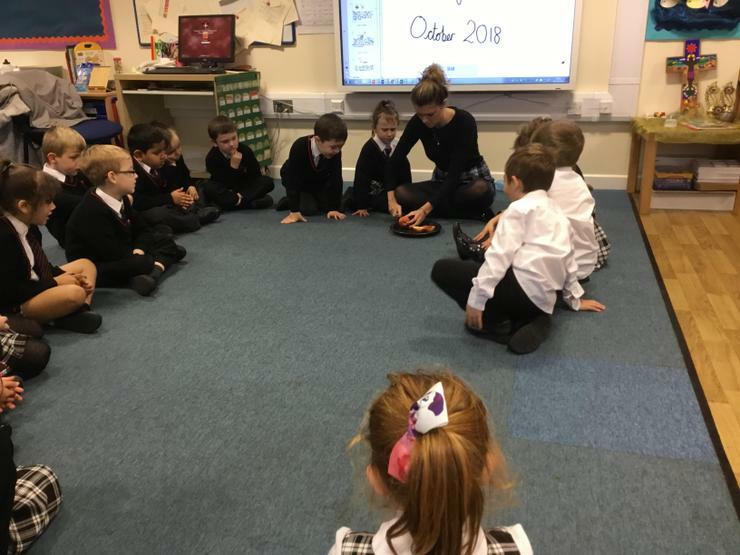 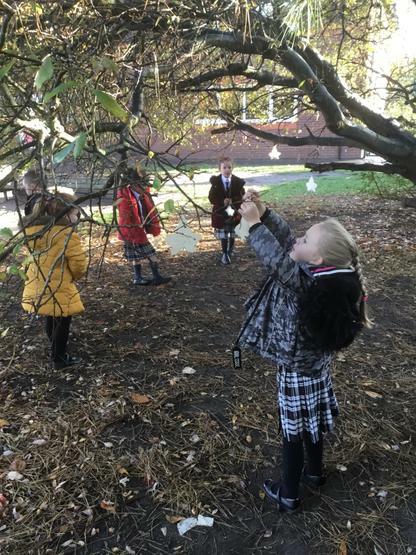 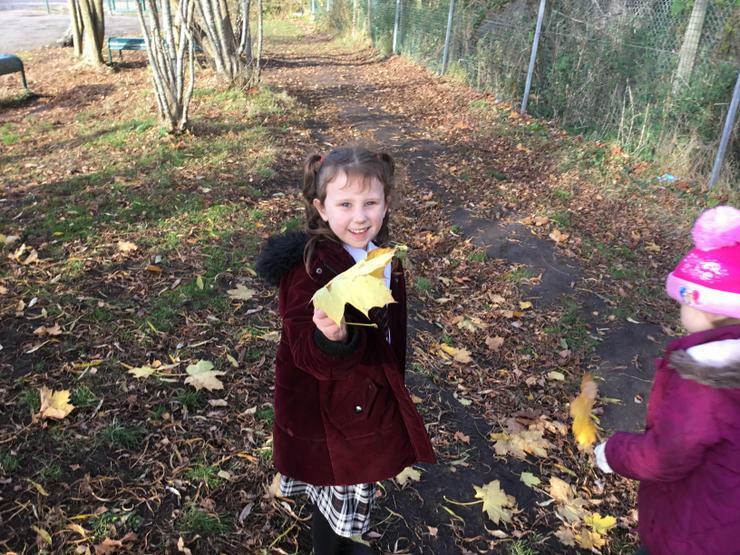 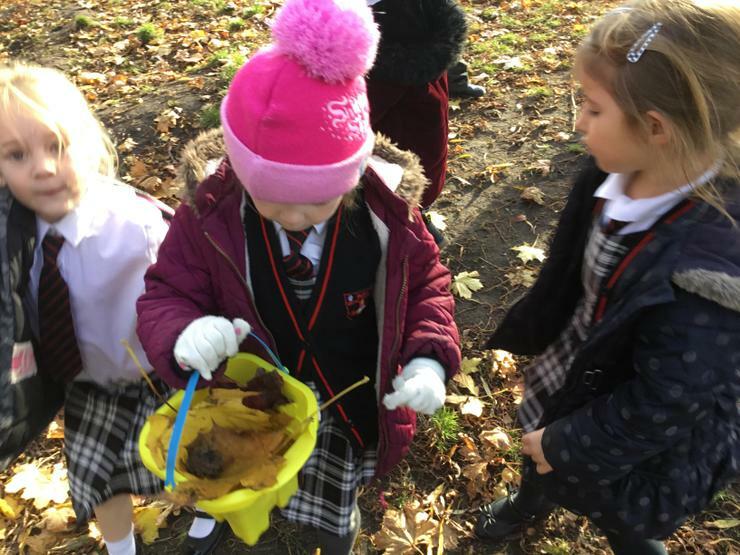 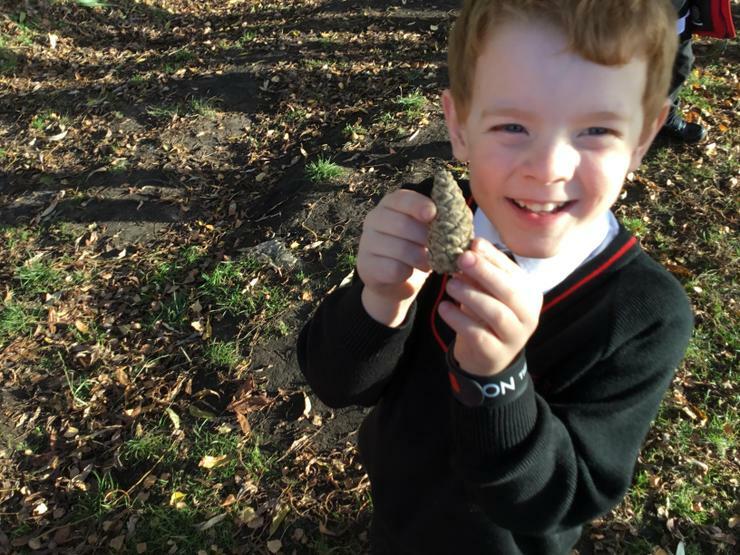 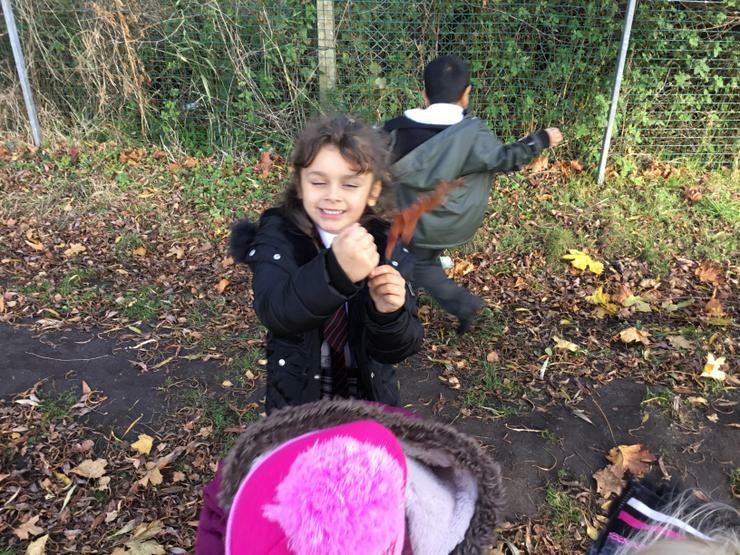 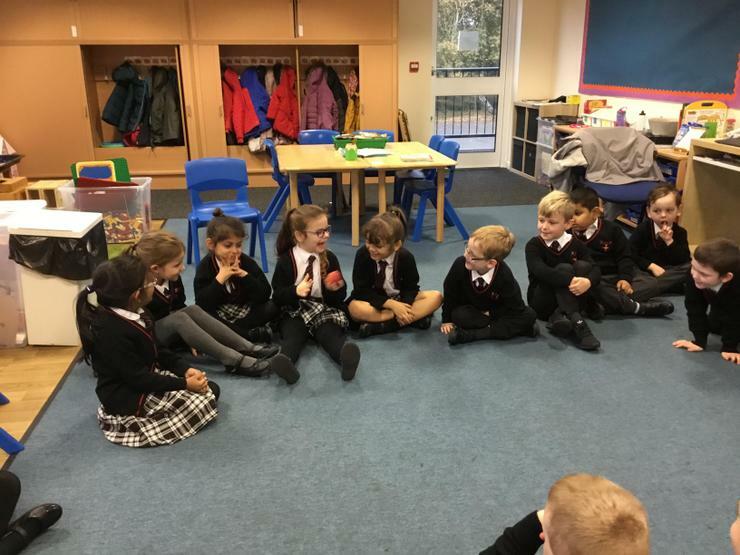 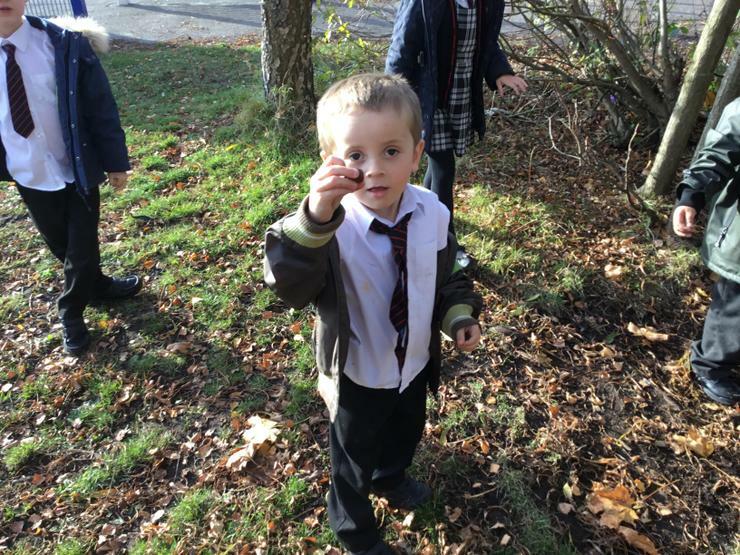 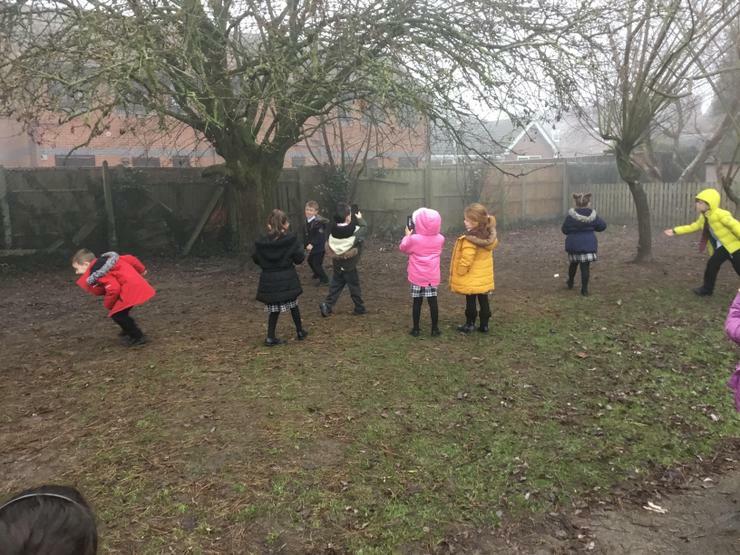 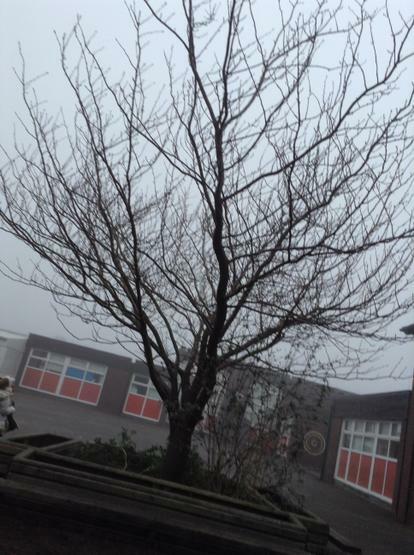 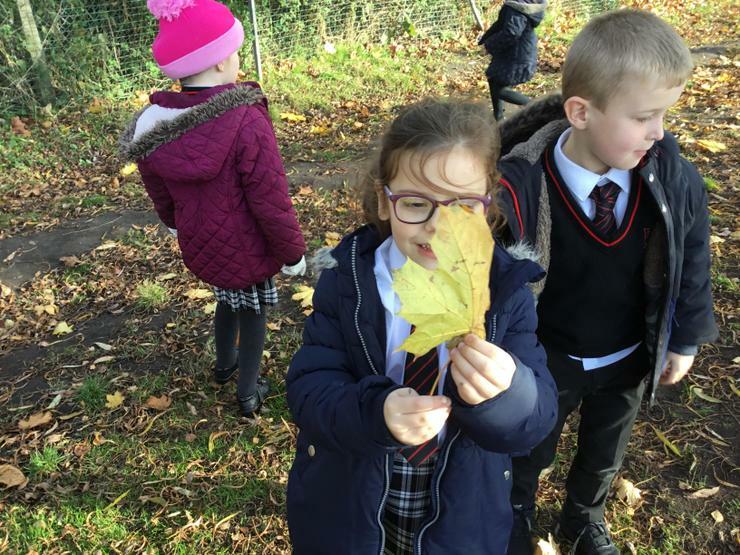 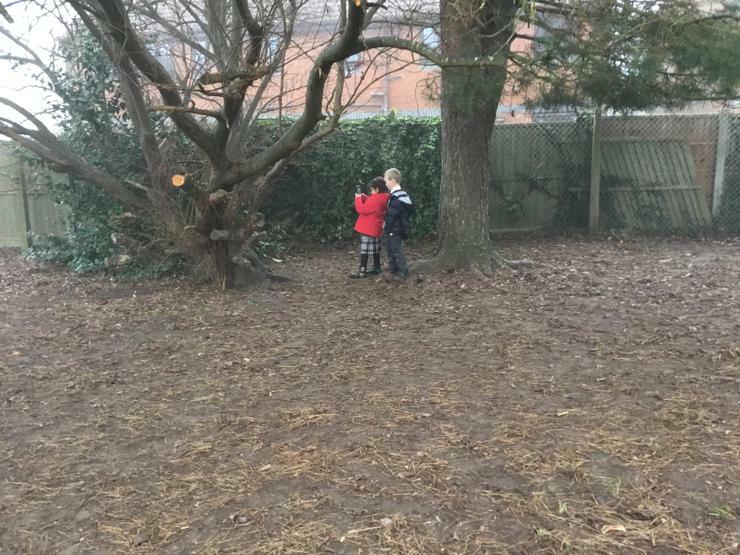 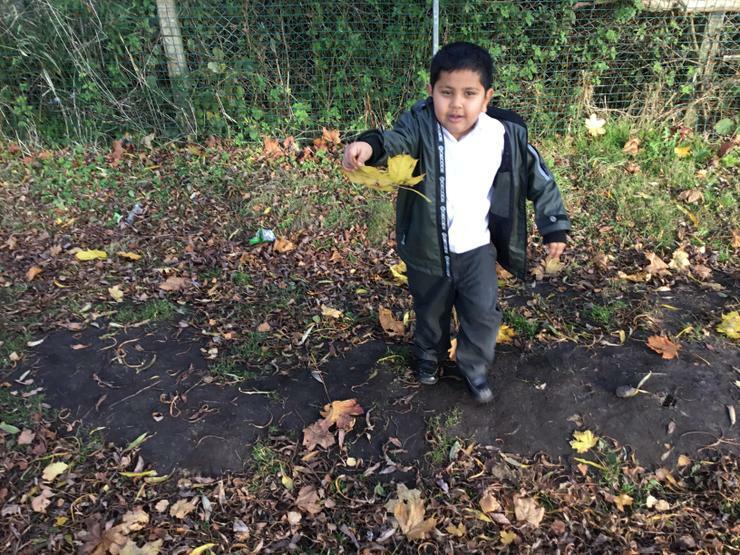 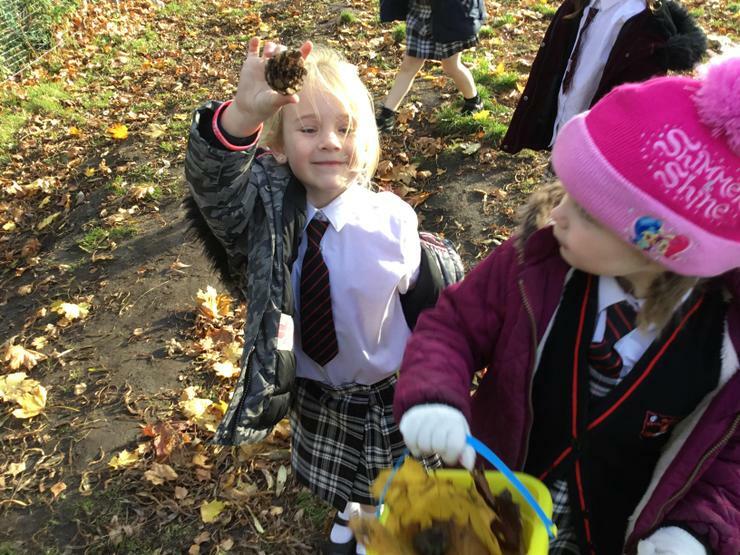 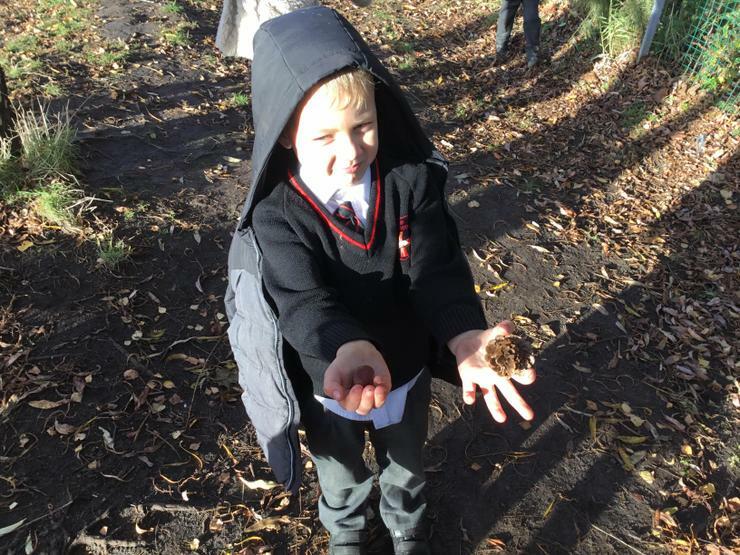 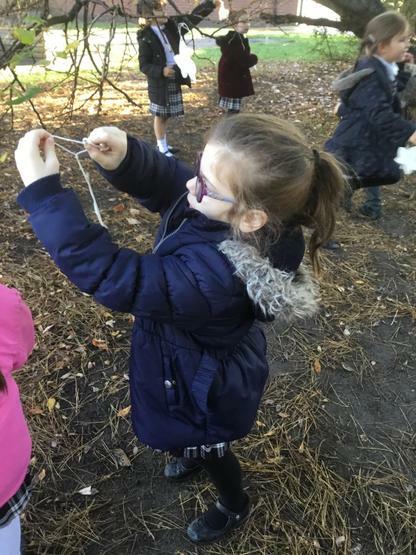 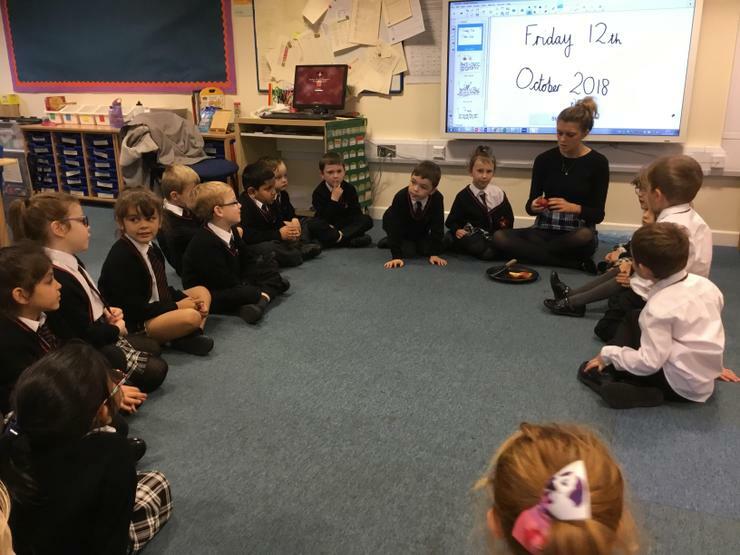 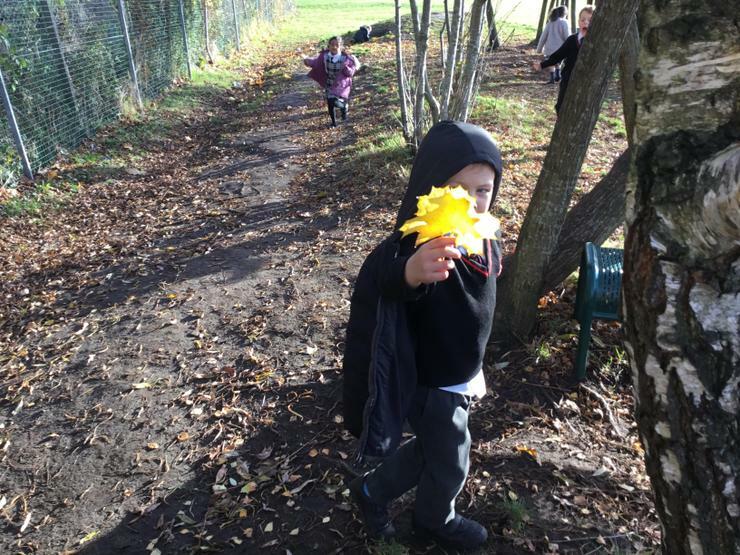 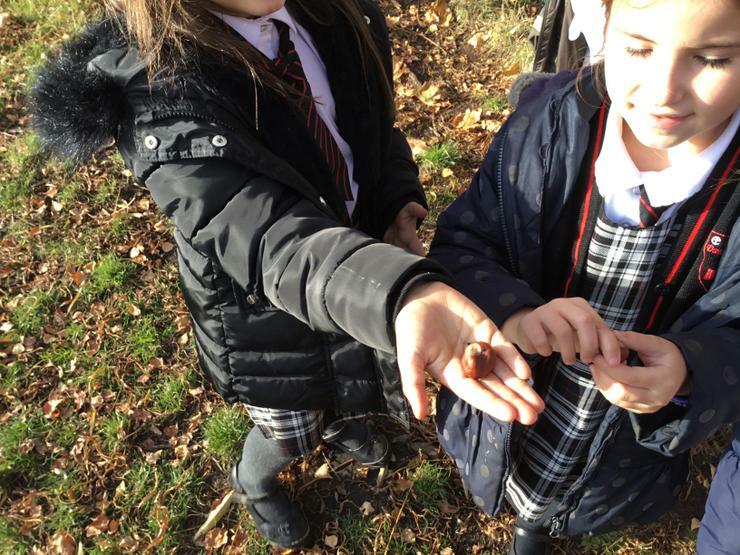 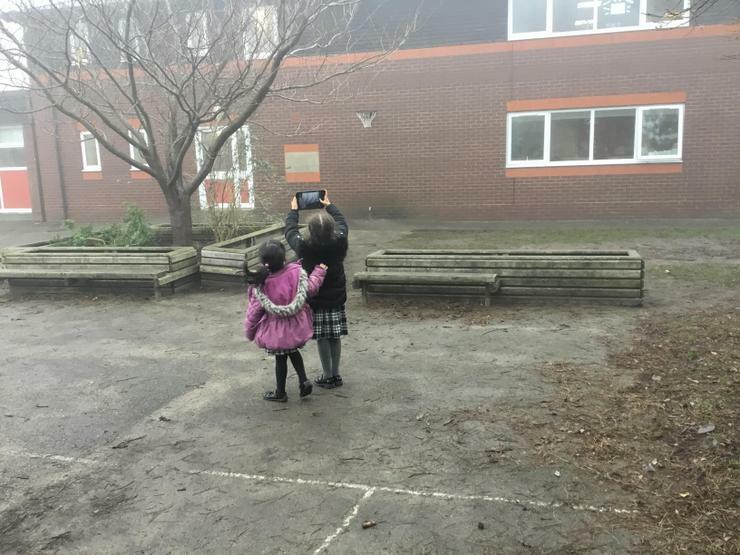 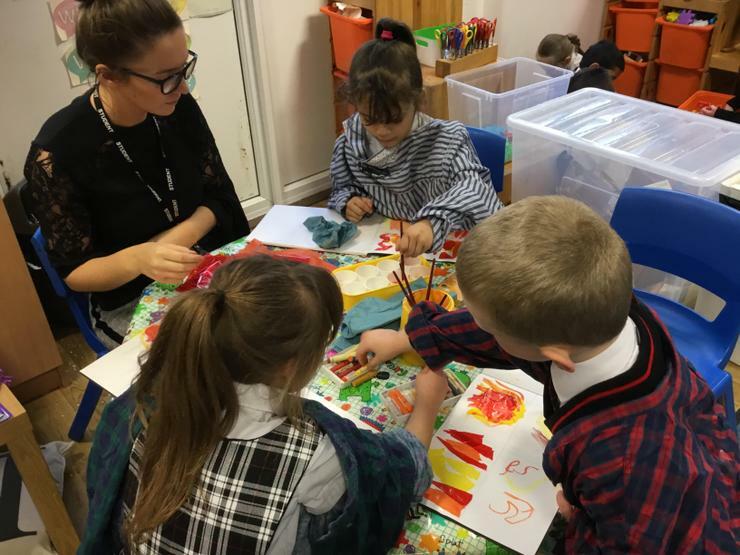 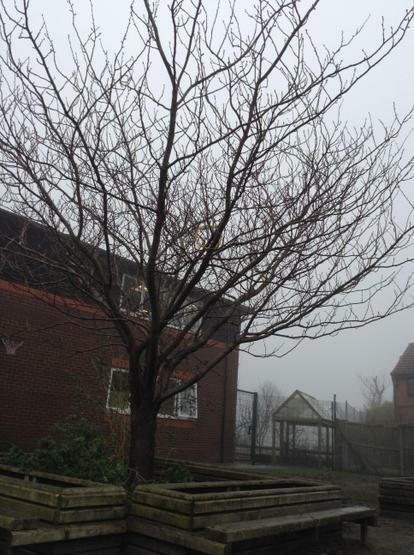 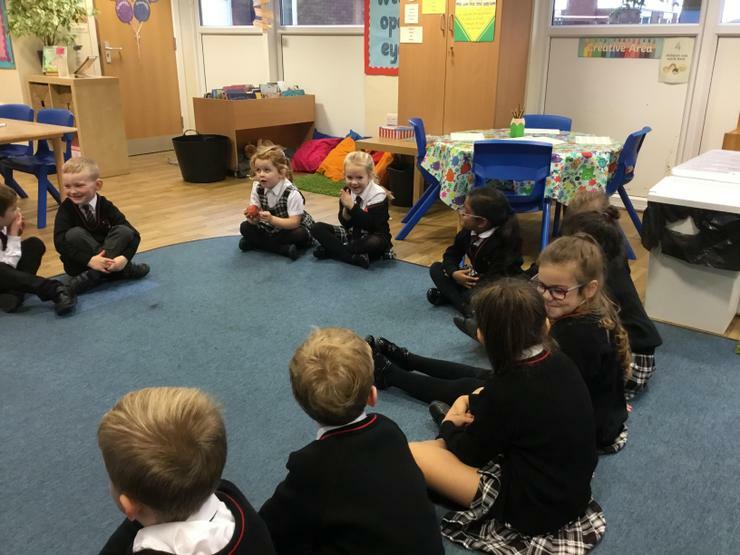 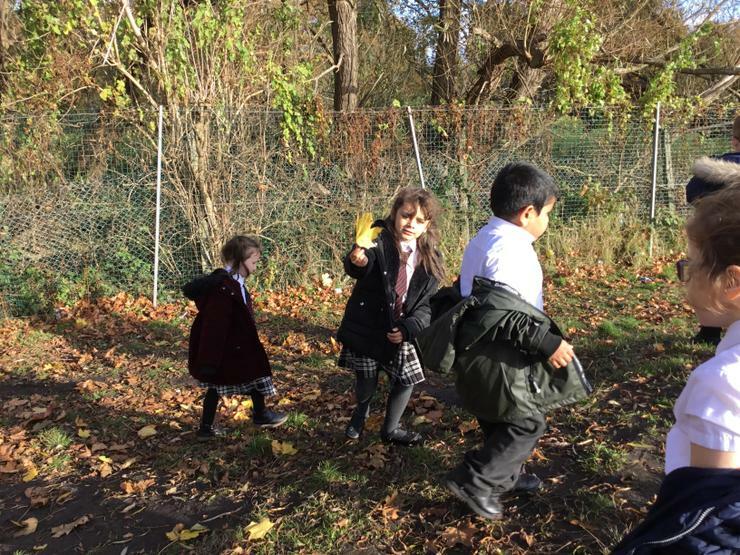 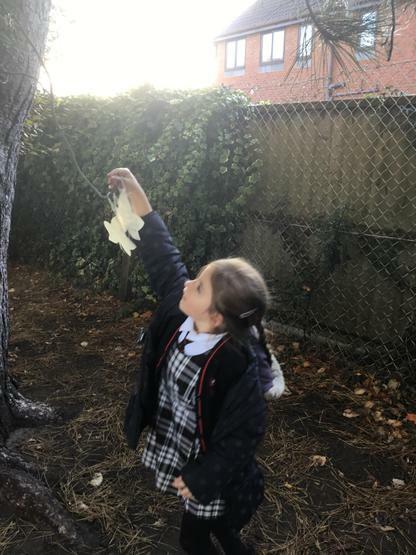 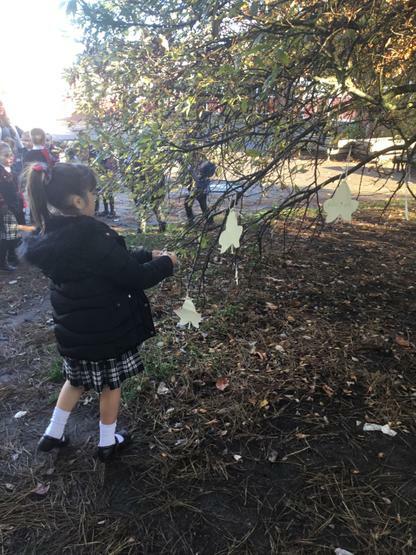 Year 1 have been learning about Autumn in Science and thinking about the changes they see during this season. 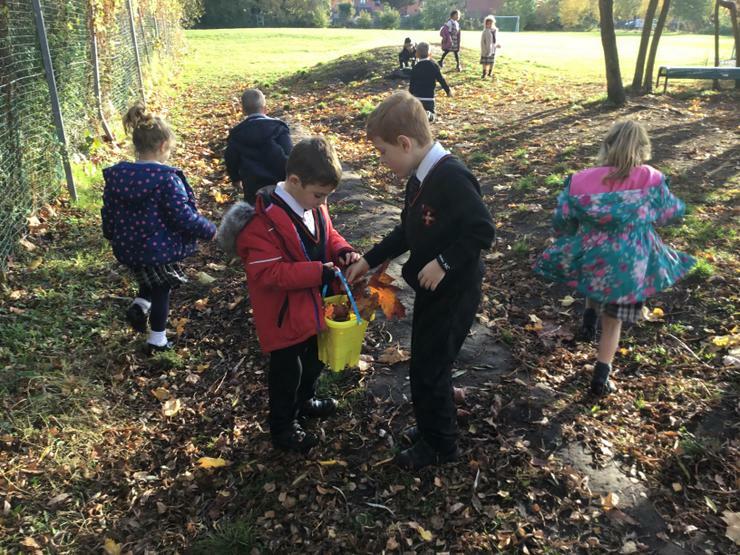 They went on a walk and picked up items that reminded us of Autumn. 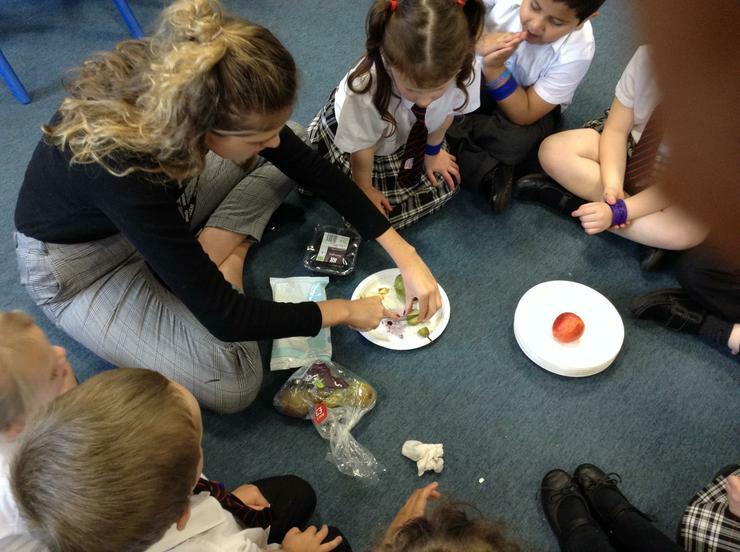 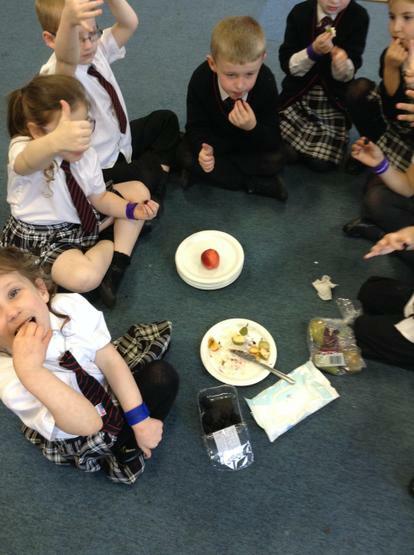 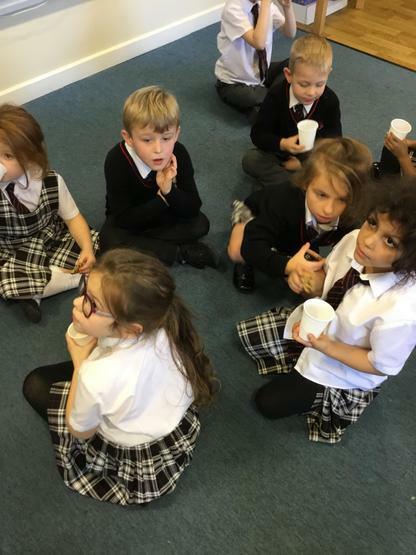 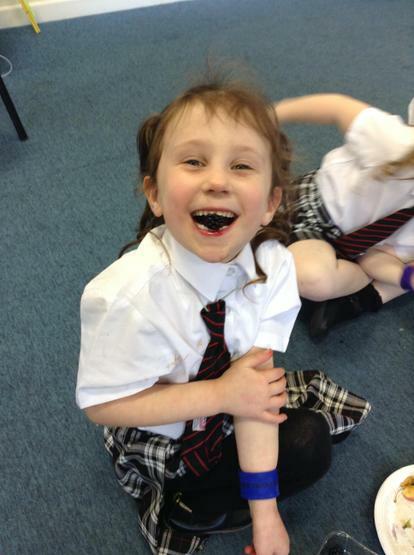 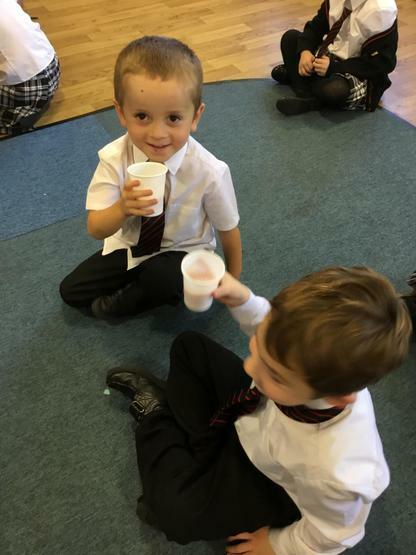 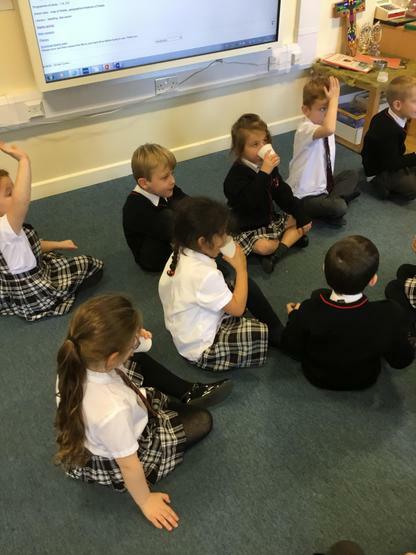 The children also tasted autumnal fruits such as blackberries, apples and pears which most of them enjoyed. 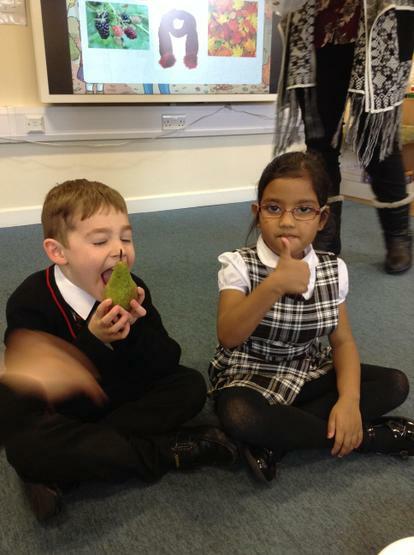 Their favourite being the pear. 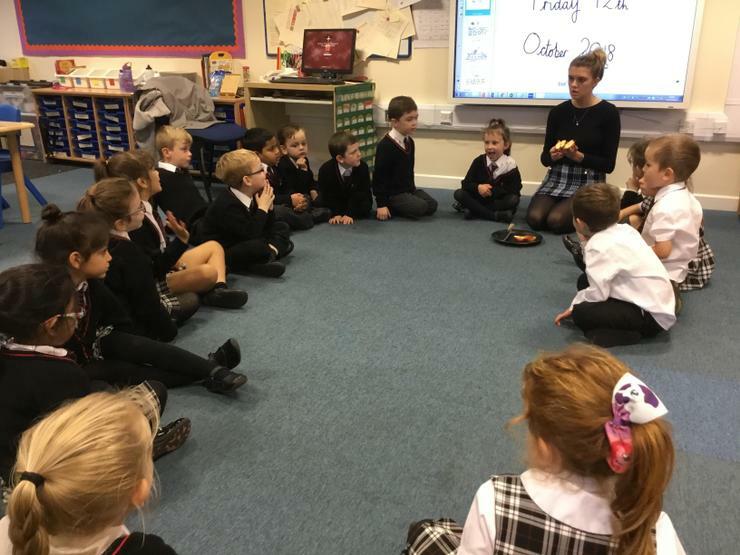 Which is your favourite autumnal fruit? 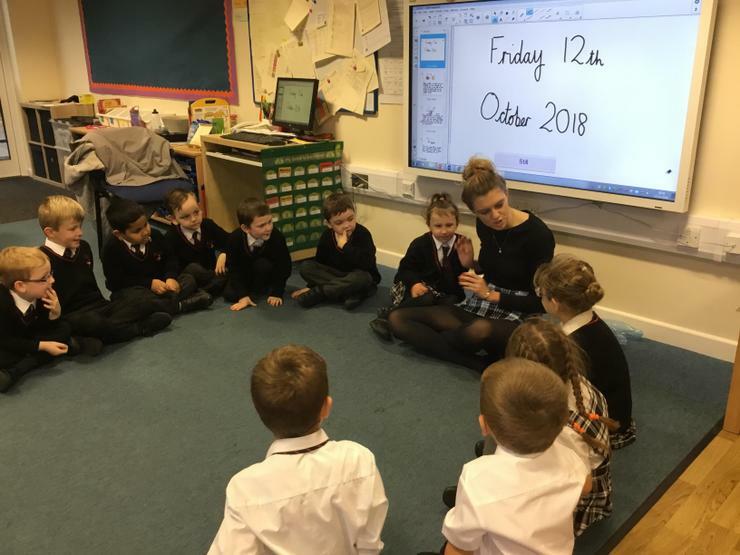 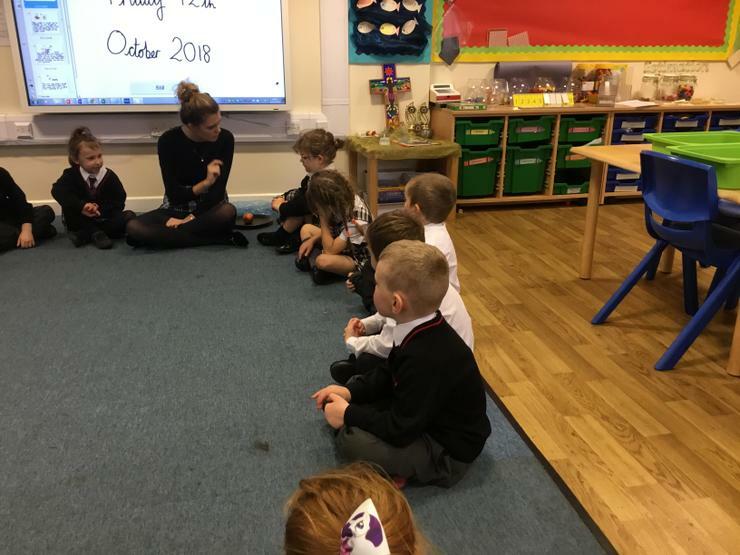 Year 1 have been thinking about why we are thankful during Harvest. 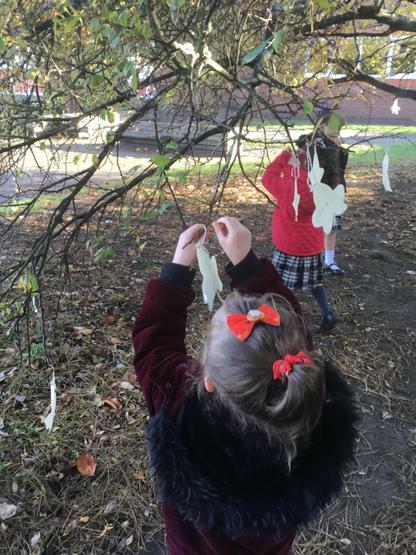 Each child thought of their own individual reason, wrote these on a leaf and as a class we hung them outside for all to see! 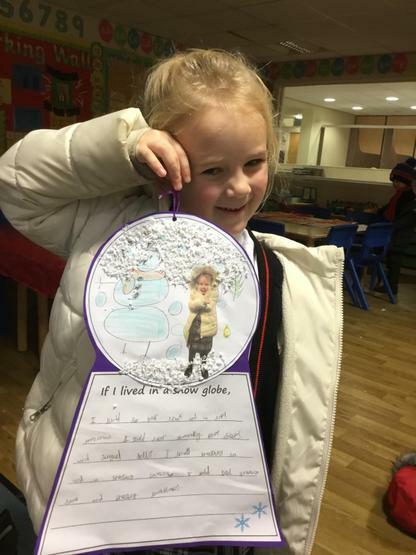 Some children chose to write their reasons for being thankful, whilst others chose to write about those in need. 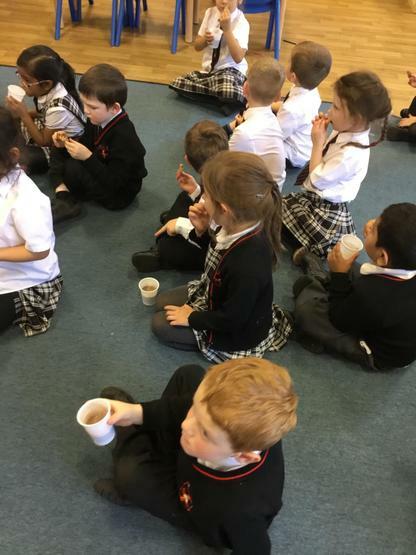 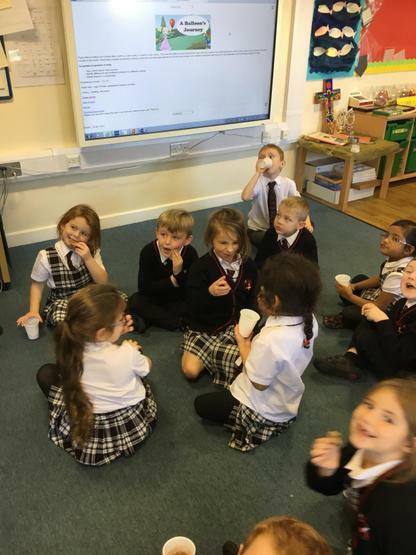 Year 1 won the KS1 reading competition this half term and enjoyed milkshakes and cookies whilst listening to a story. 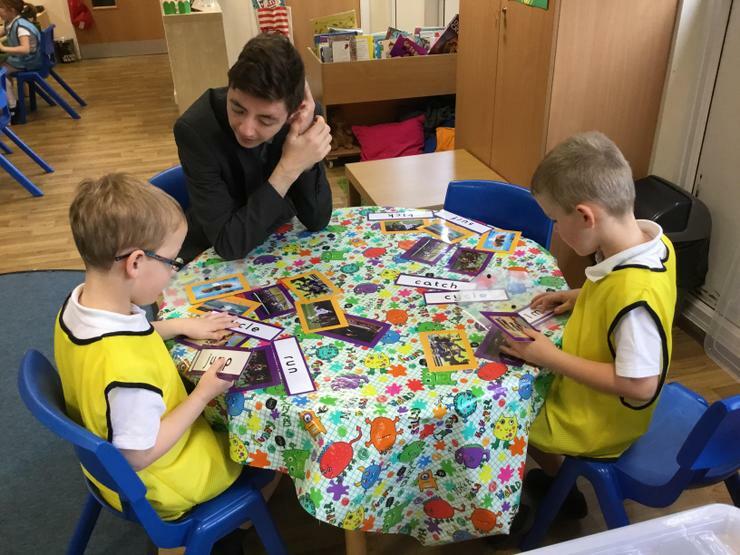 Let’s win next half term as well, by making sure we read every night! 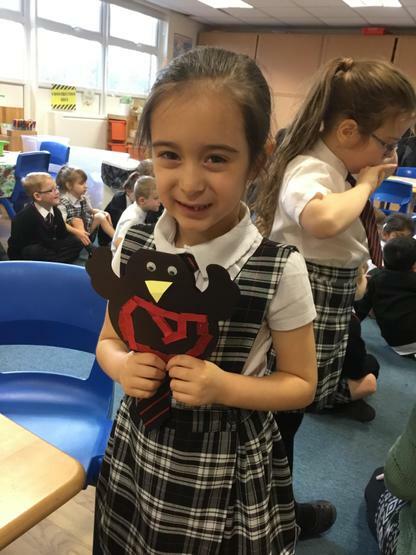 Well done Year 1 and thank you to all the parents at home for supporting us with reading. 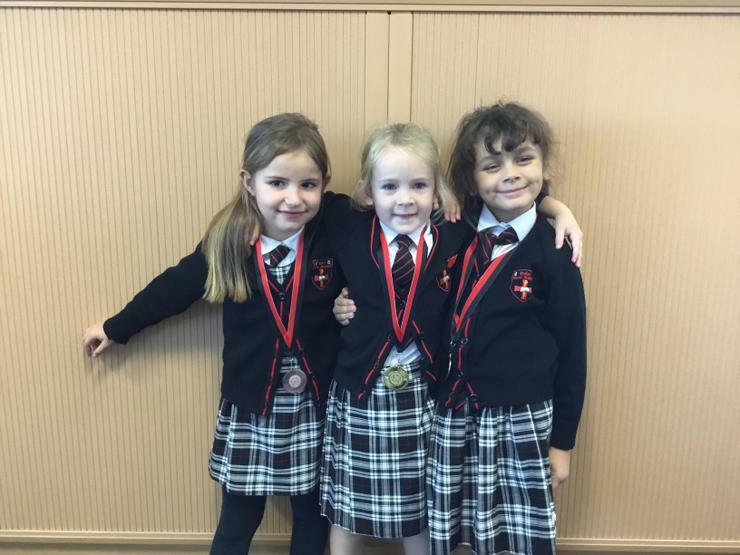 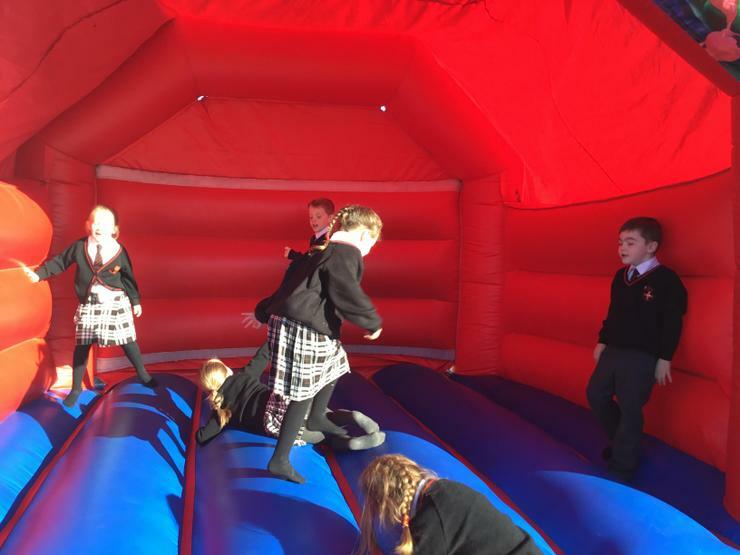 Year 1 were able to take part in a sponsored bounce, arranged by Year 6 girls to raise money for new library books. 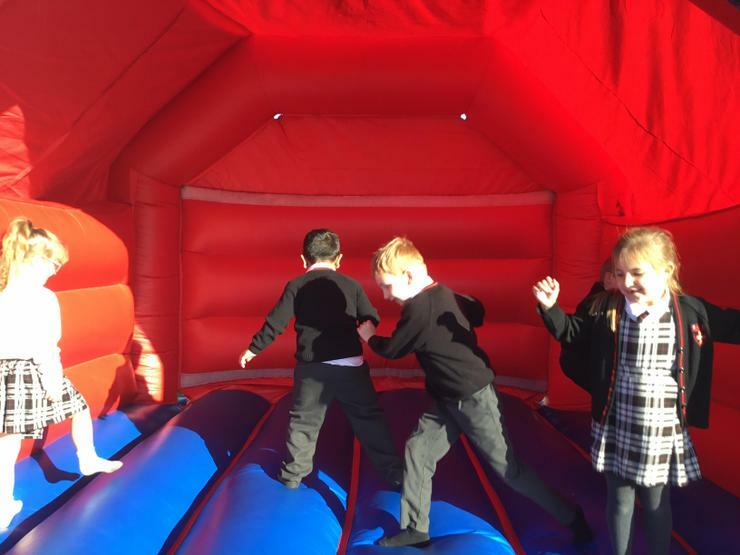 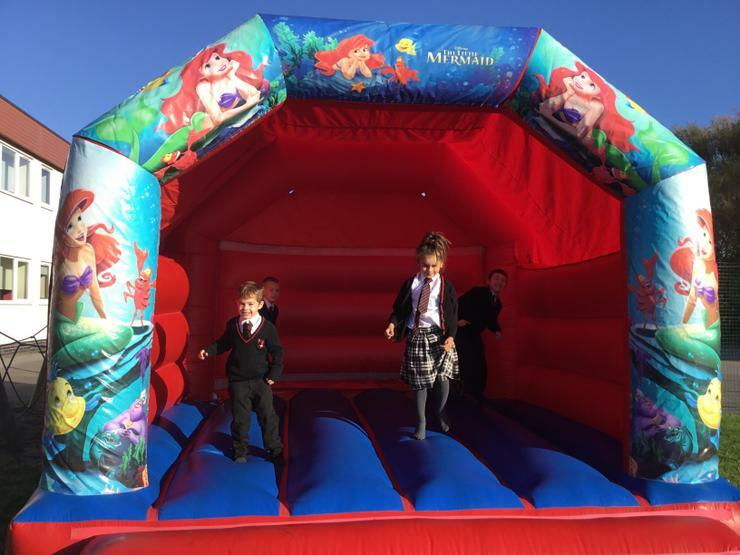 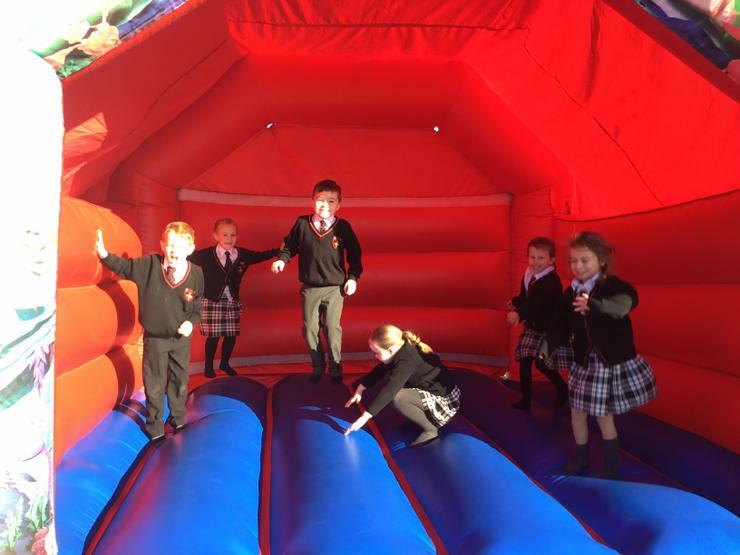 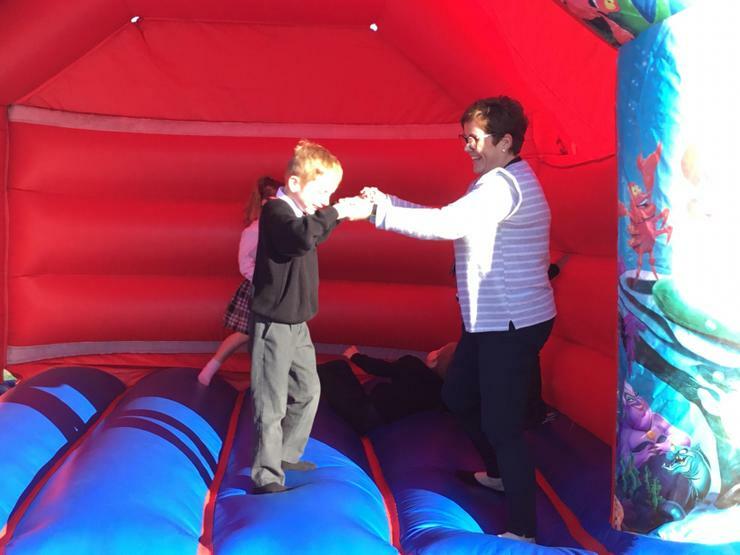 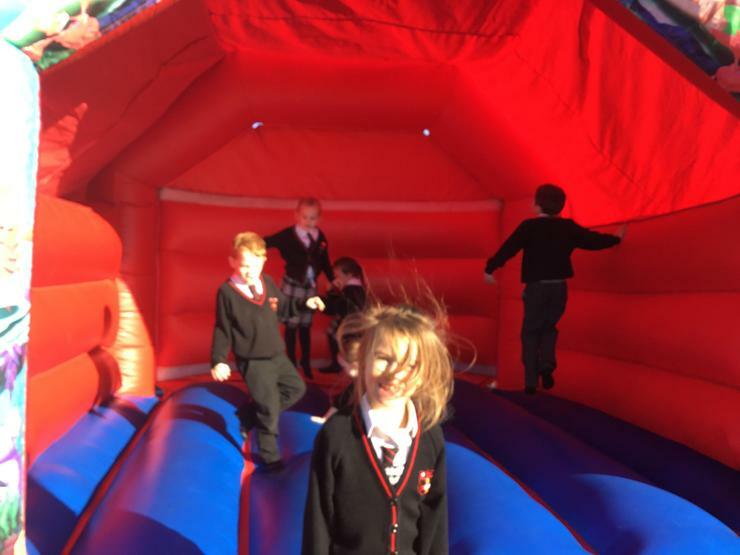 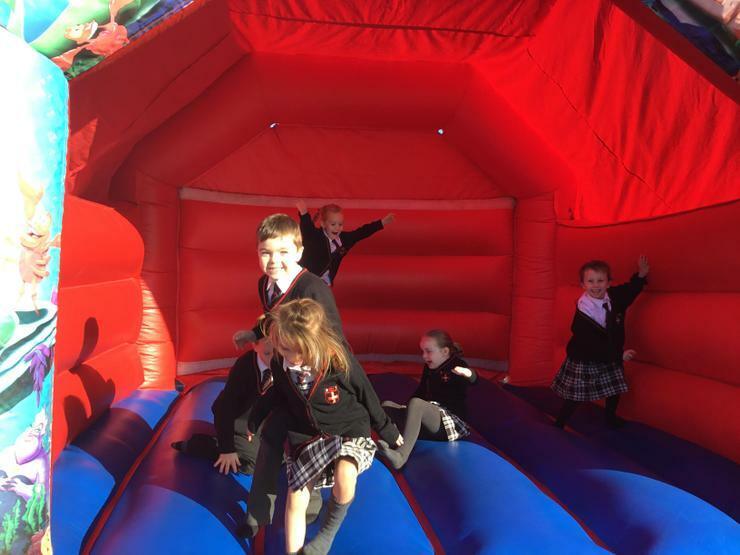 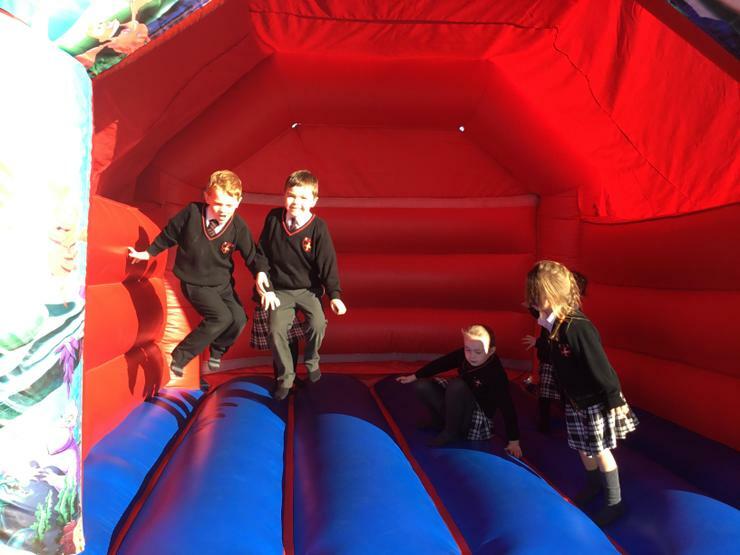 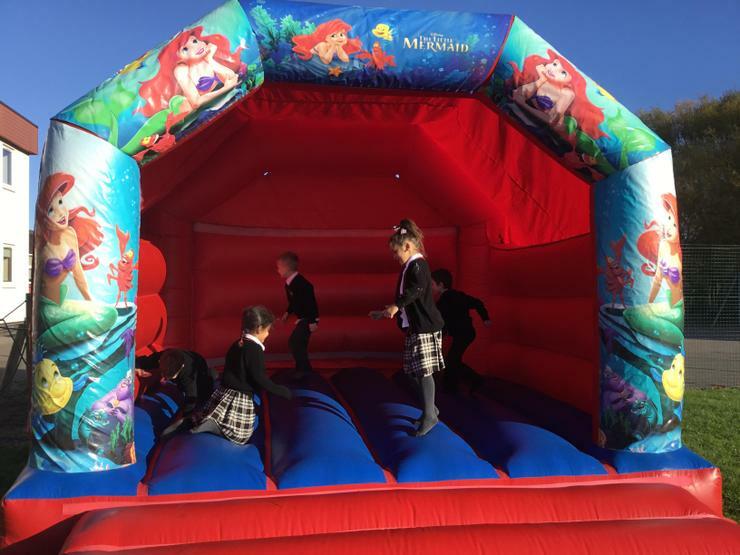 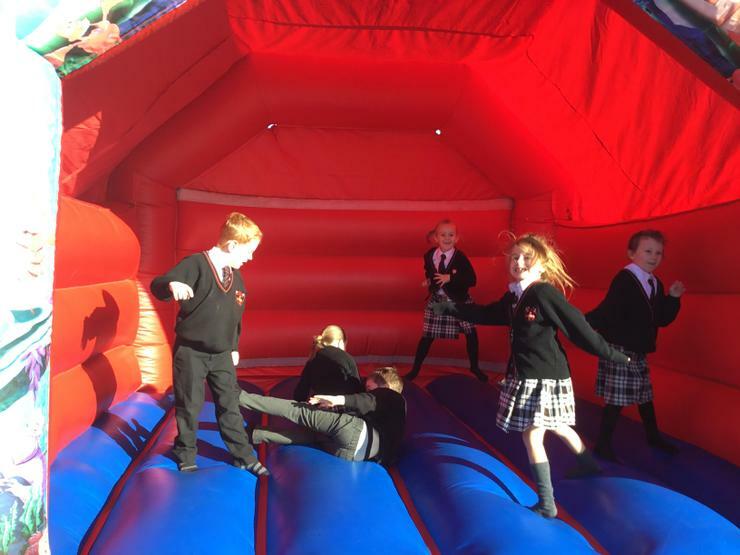 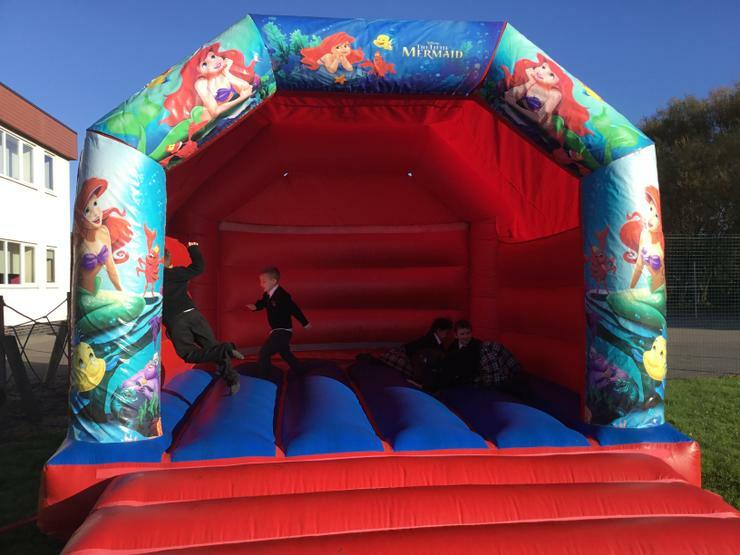 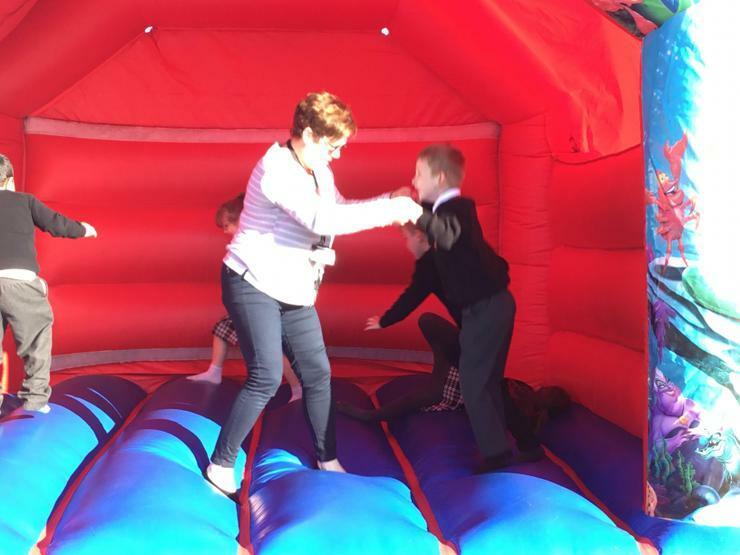 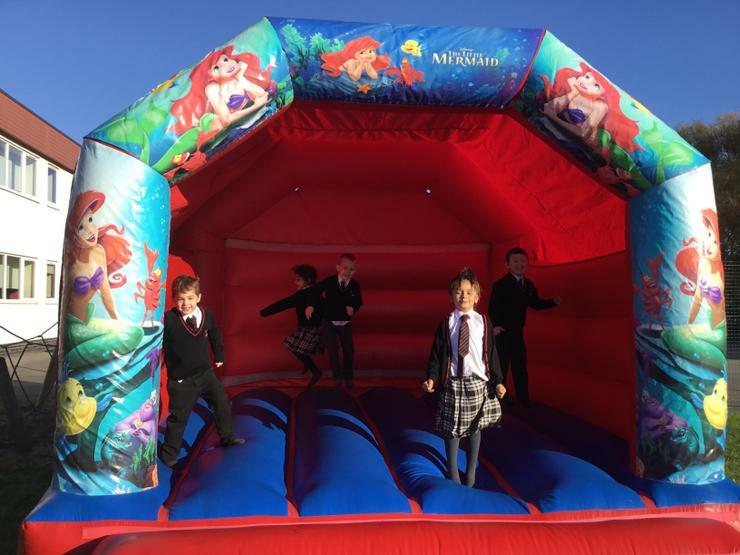 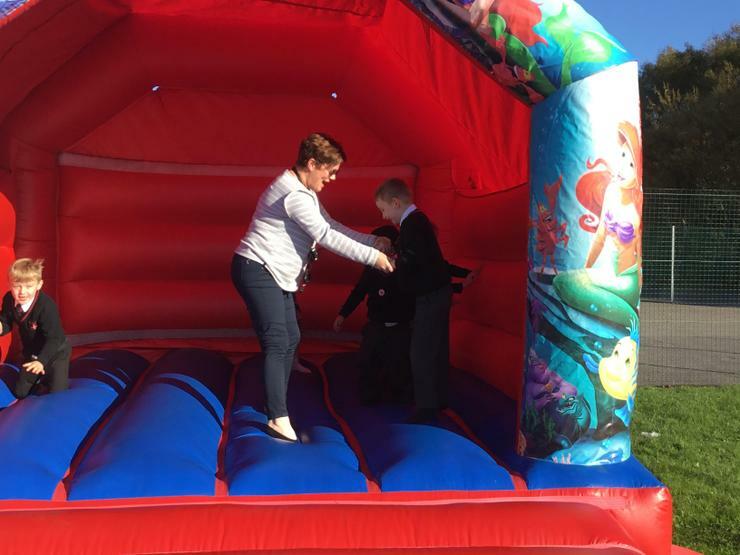 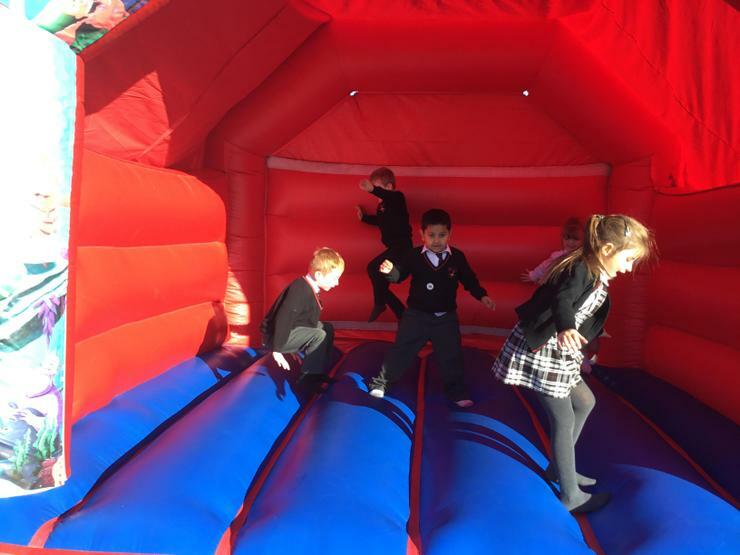 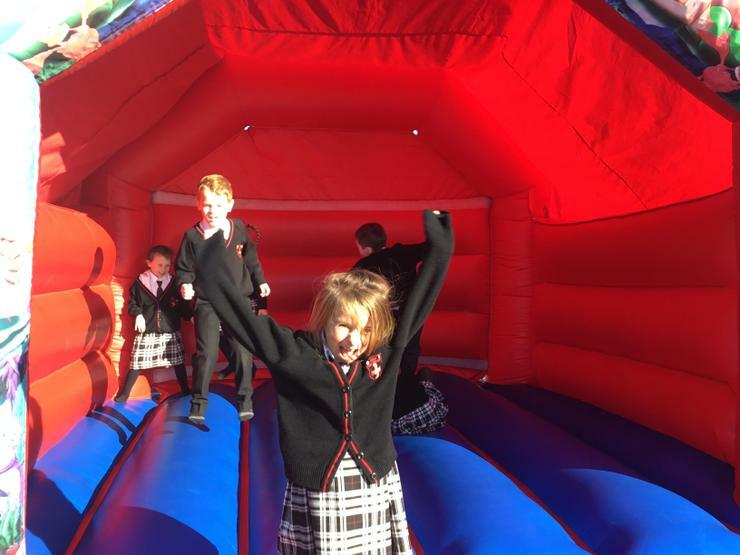 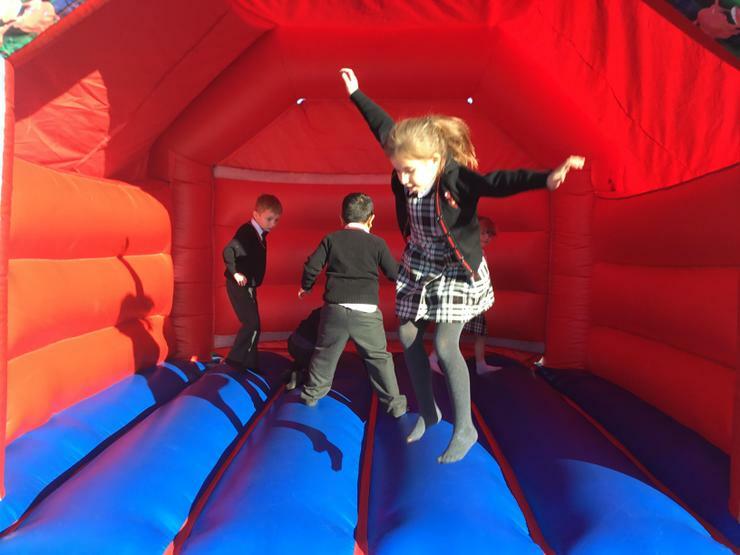 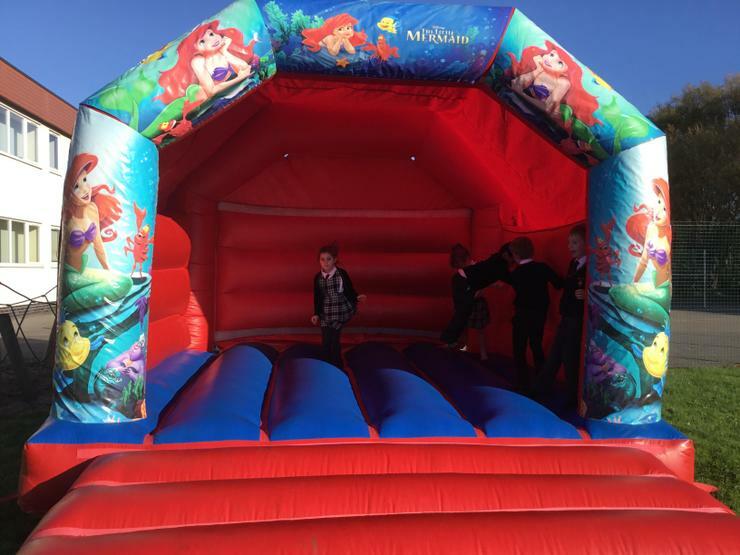 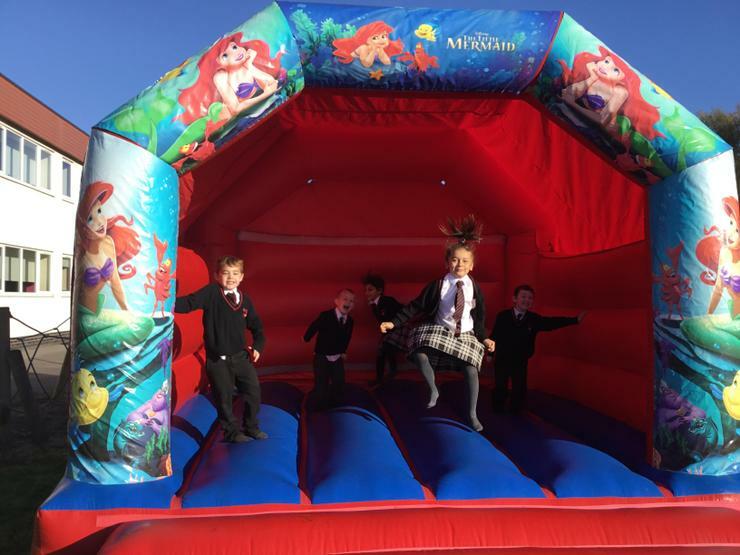 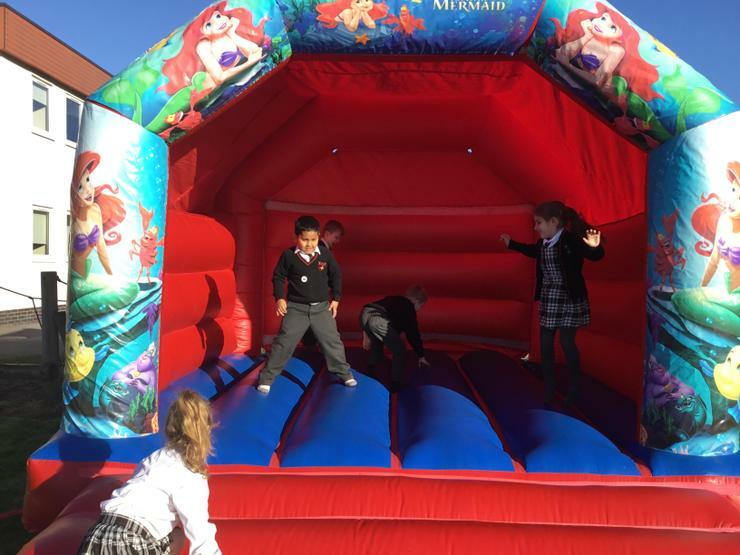 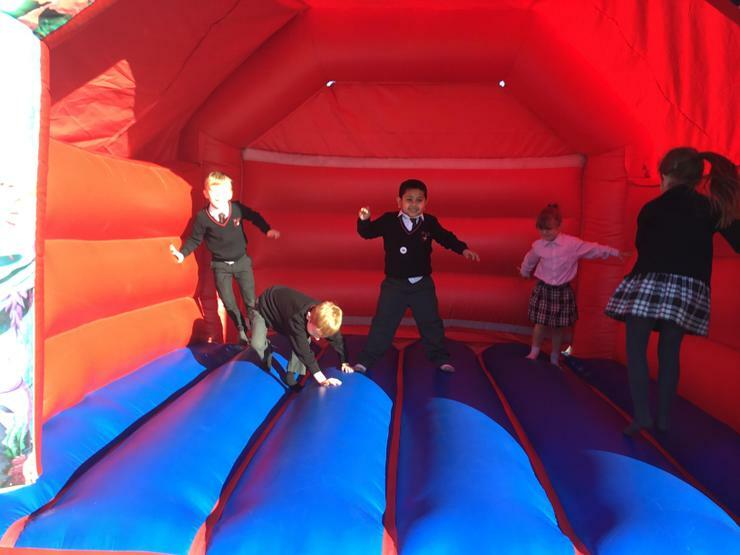 The children had a great time on the bouncy castle and, together with the cake sale, the school raised an amazing £1100! 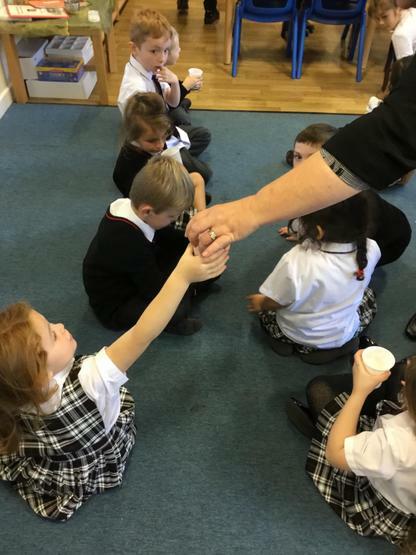 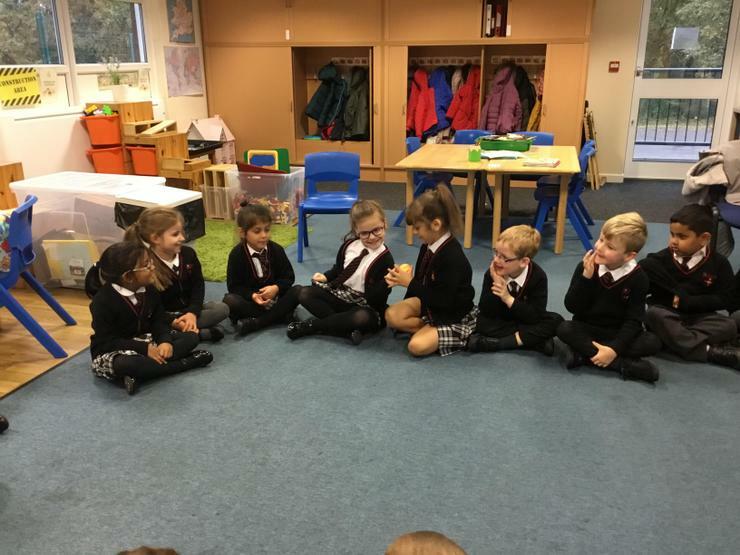 In Collective Worship, we have been looking at this terms Christian Value of Friendship. 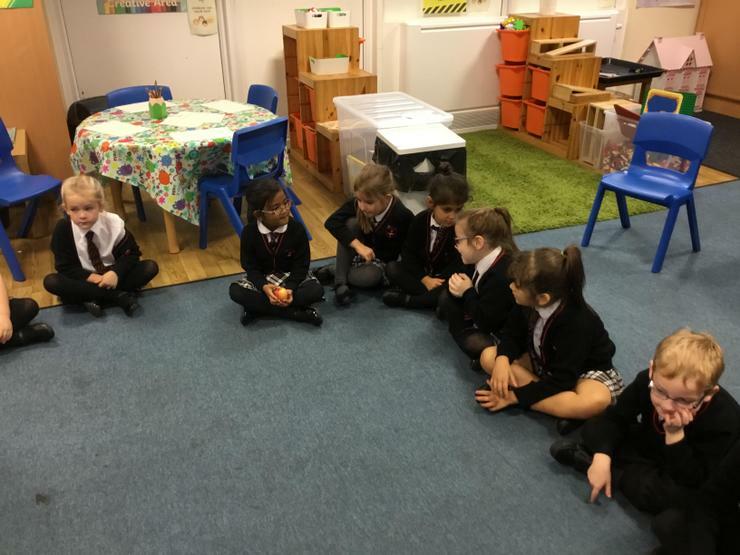 We discussed the effects of being kind and unkind to each other. 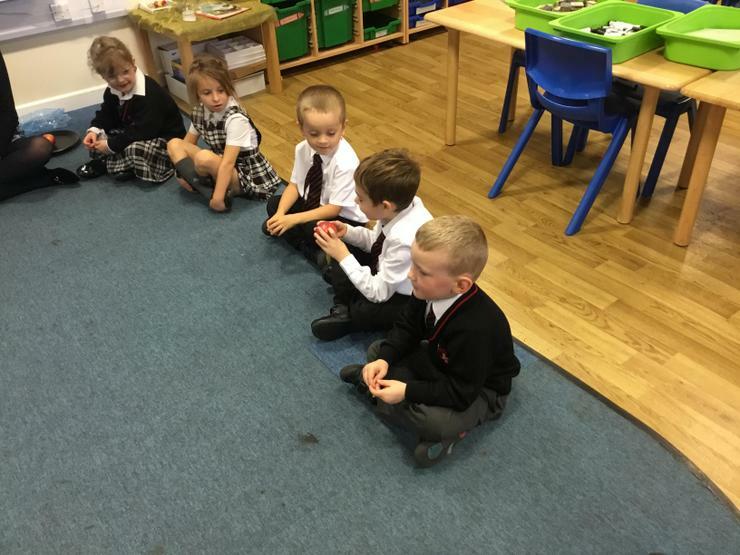 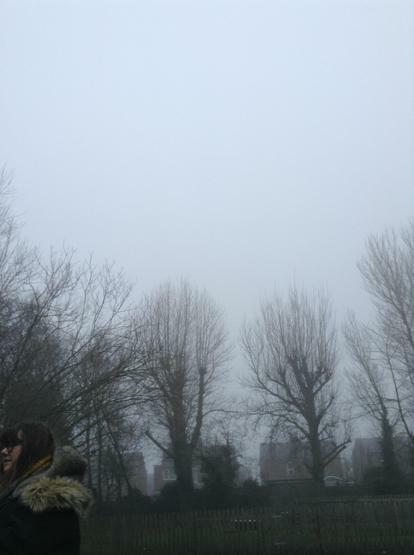 First, we looked at two identical apples and tried to spot their differences. 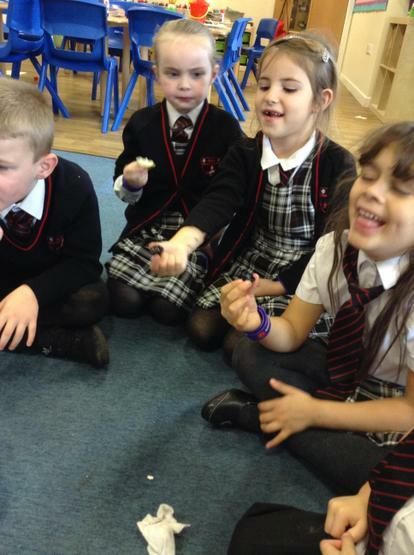 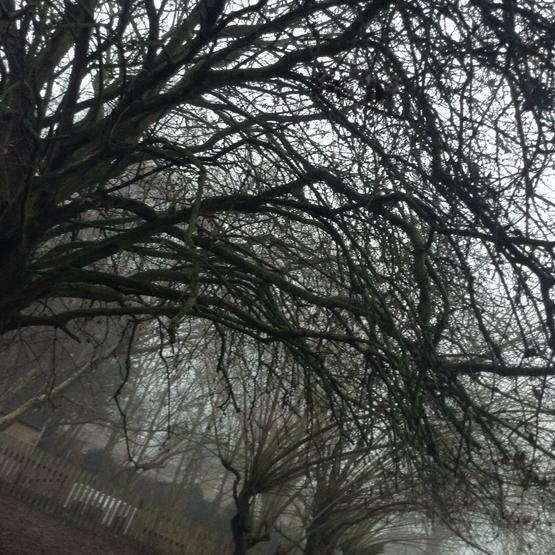 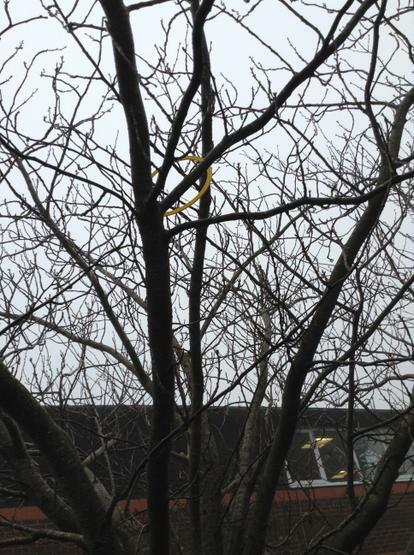 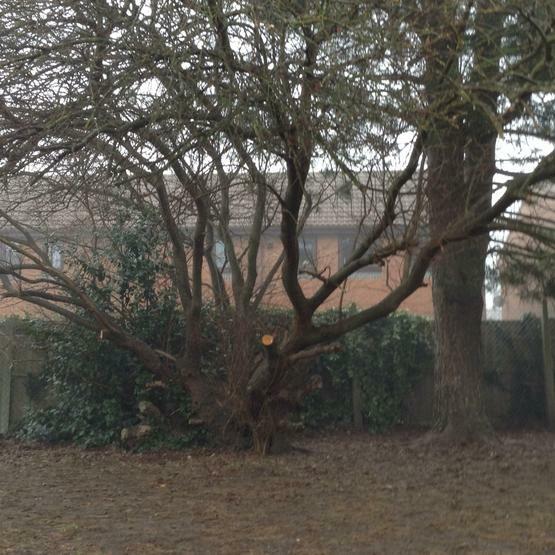 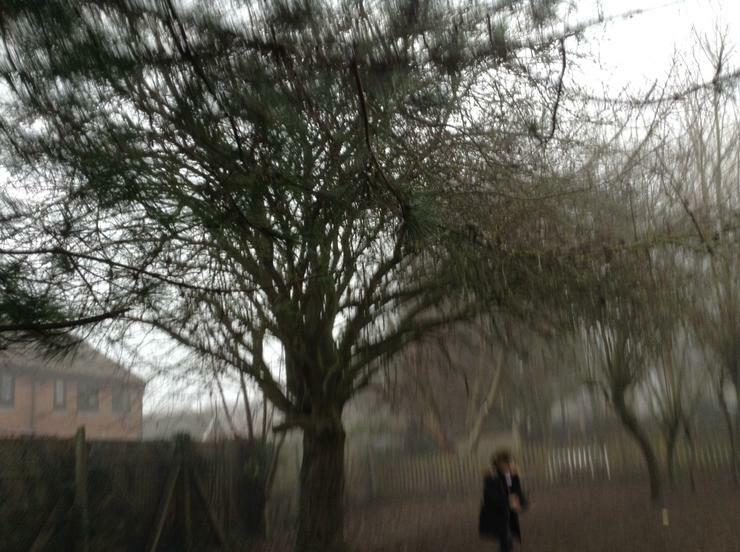 We decided that we did not like one of the apples so we passed it around the circle and whispered unkind comments. 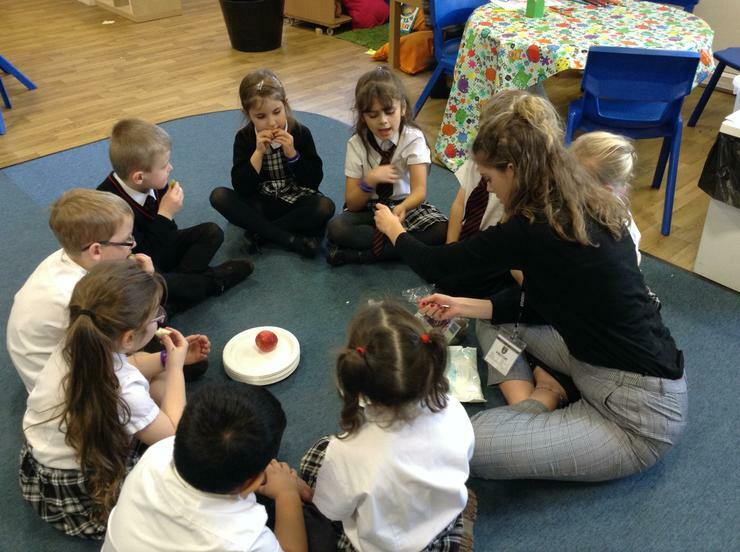 However, the second apple was beautiful! 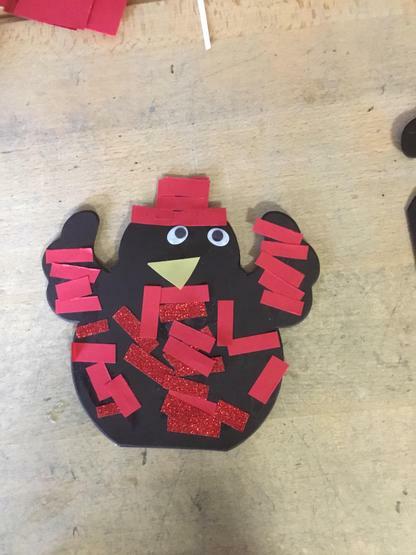 We passed it around and thought of some lovely compliments. 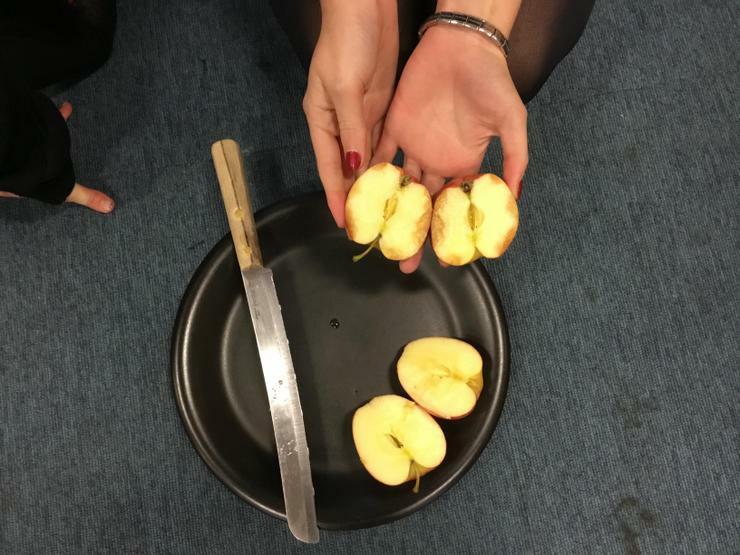 When we cut our apples in half... the apple we were hurtful to was bruised on the inside and the apple we were kind to was still fresh and juicy. 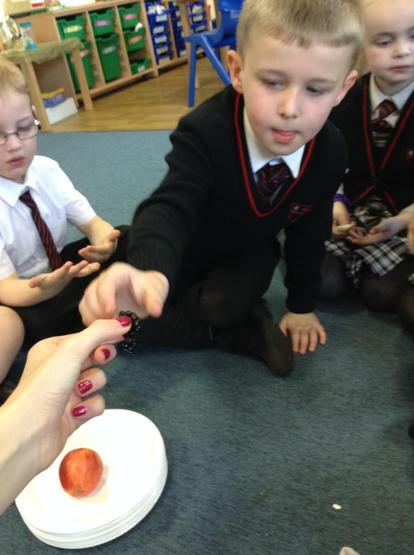 We felt sad for being unkind and apologised to the apple. 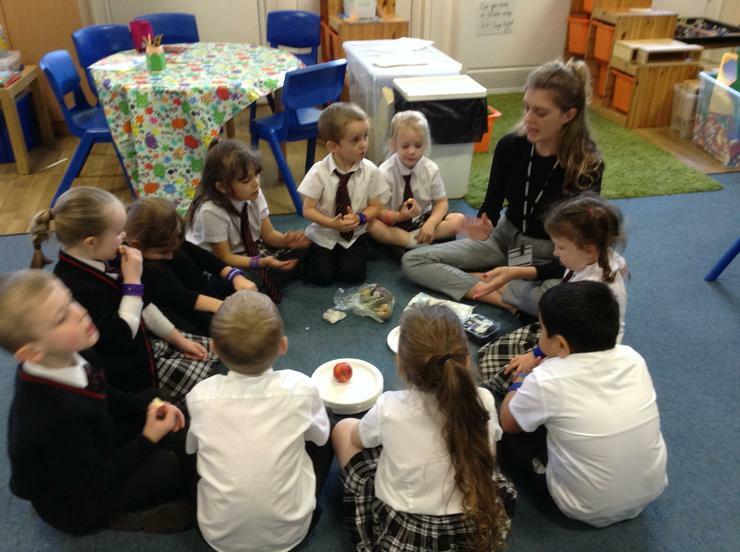 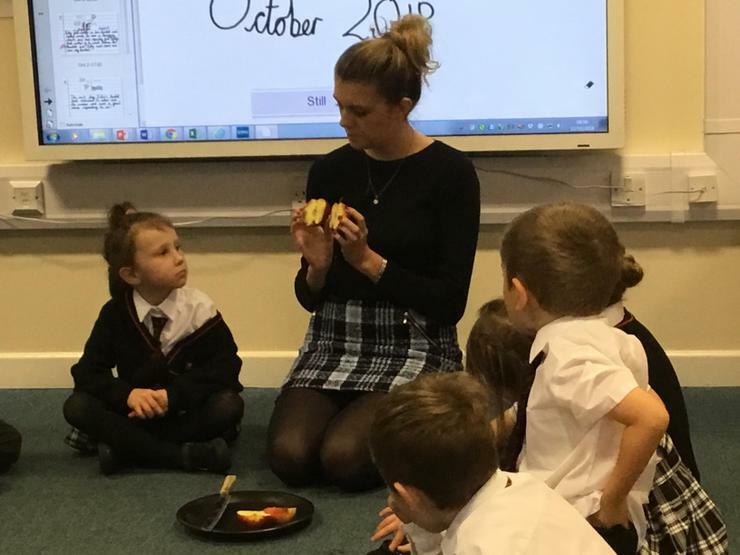 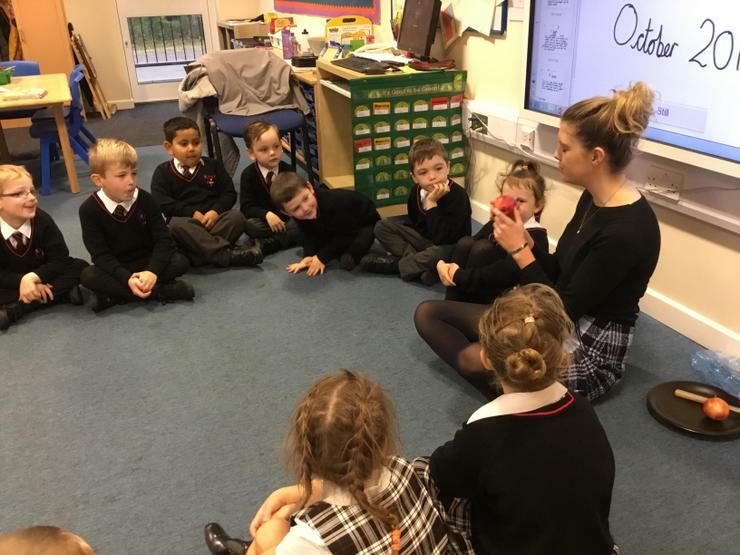 Although the apple did not go juicy again we learnt about the importance of being kind to one another. 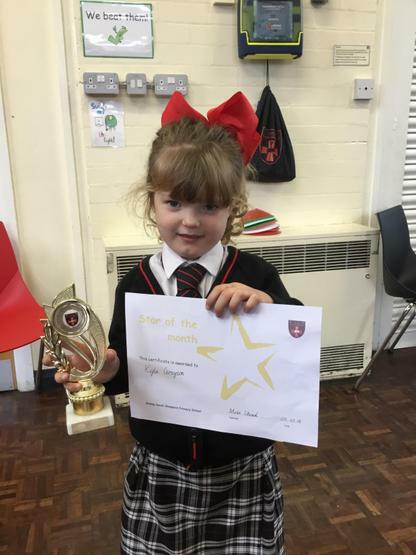 In Year 1 our Stars of the Month are Kyla and Oscar - for always trying their best in every lesson and never giving up. 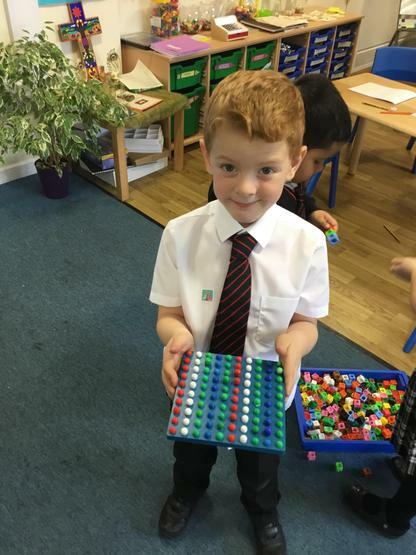 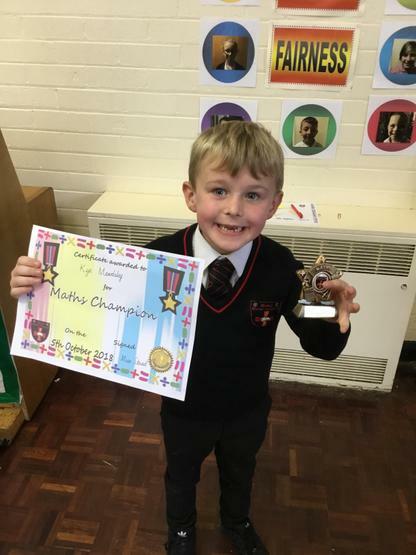 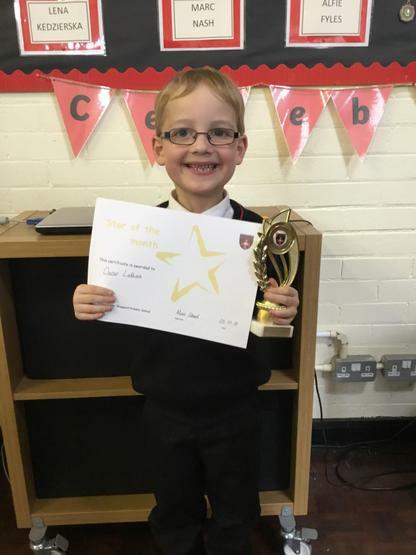 Our Mathematician of the Month was Kye - for showing great determination to be an independent learner. 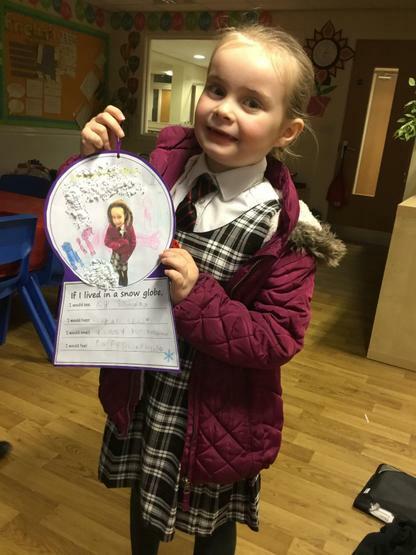 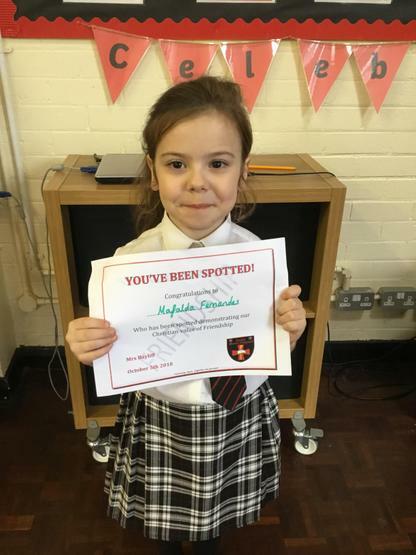 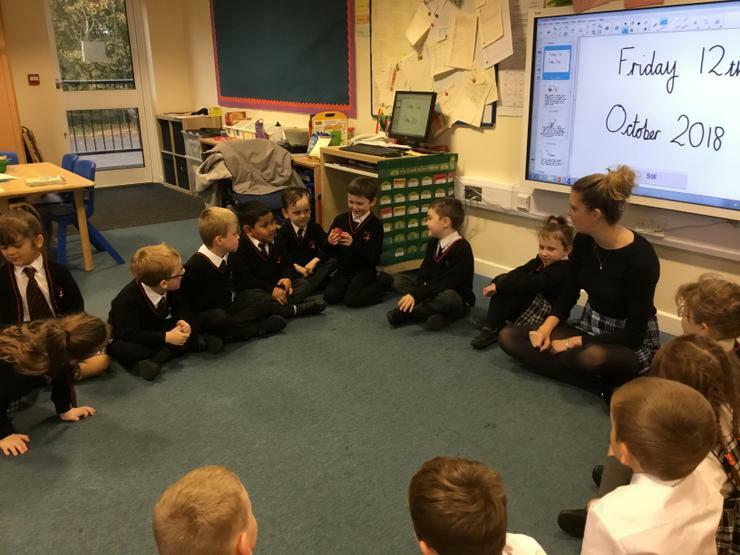 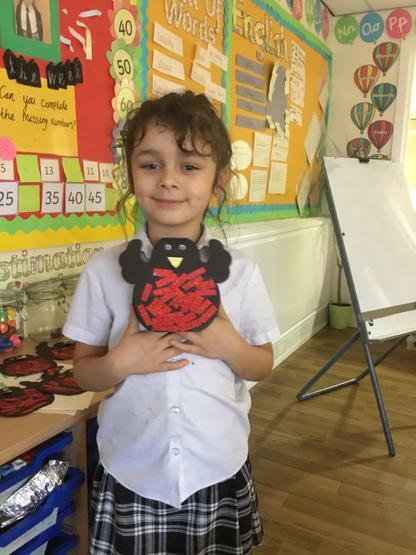 For Friendship, Mafalda was spotted being kind and caring to her new class mates. 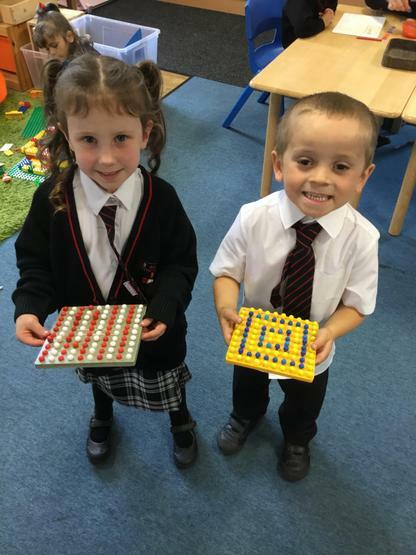 Madison and Luke are our Year 1 school councillors. 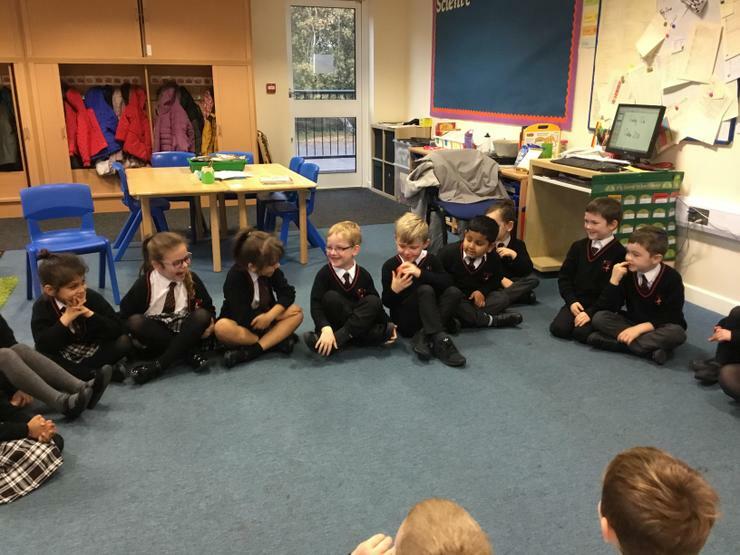 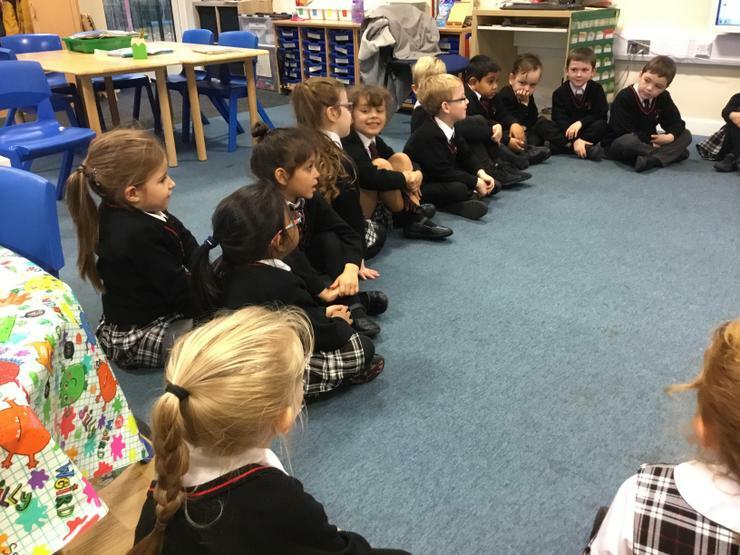 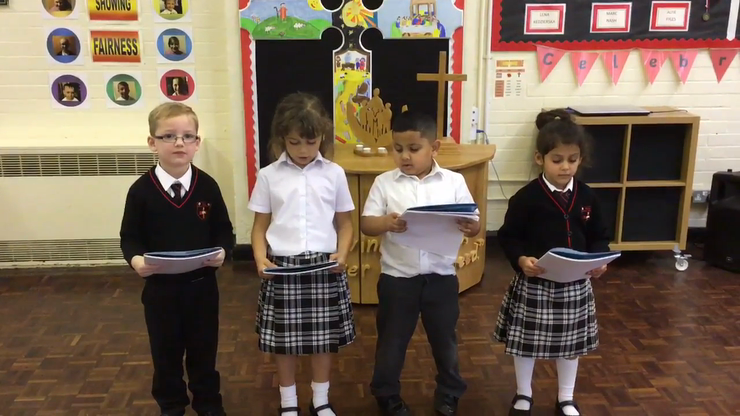 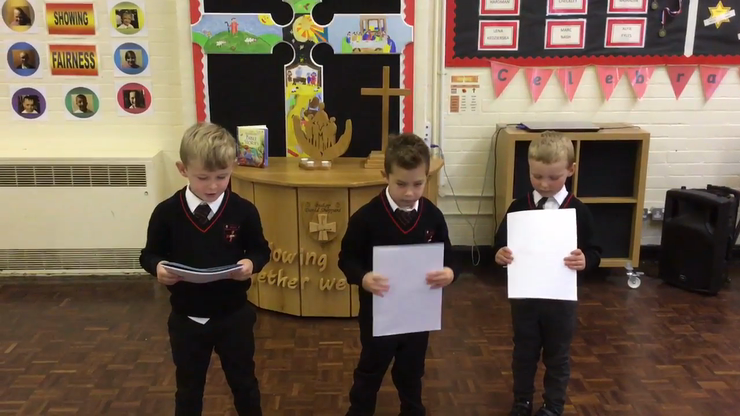 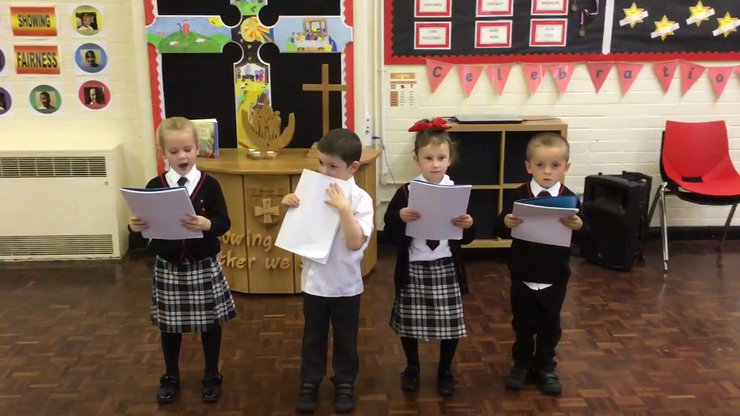 They will present ideas from Year 1 and will take part in deciding how to help improve our school and help the community.